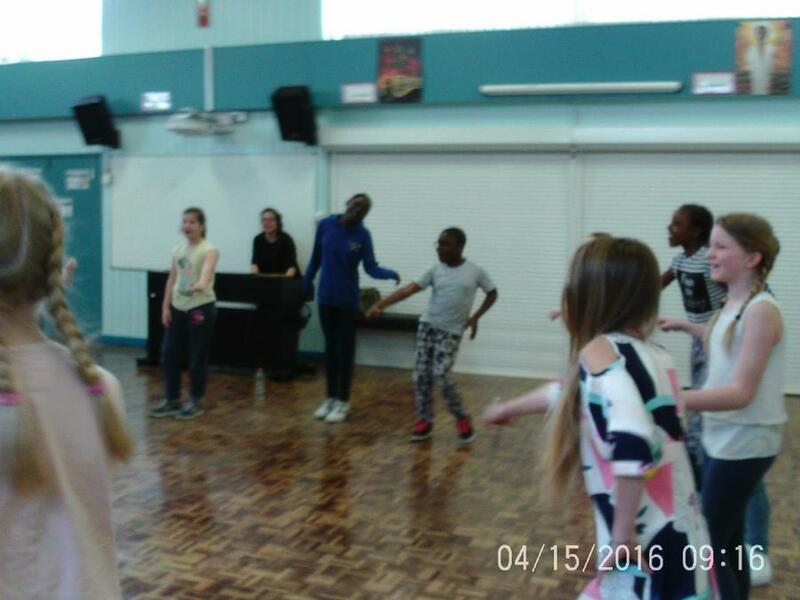 Your teachers are Miss Crofton, Mrs Ignatov and Miss Jaconelli. 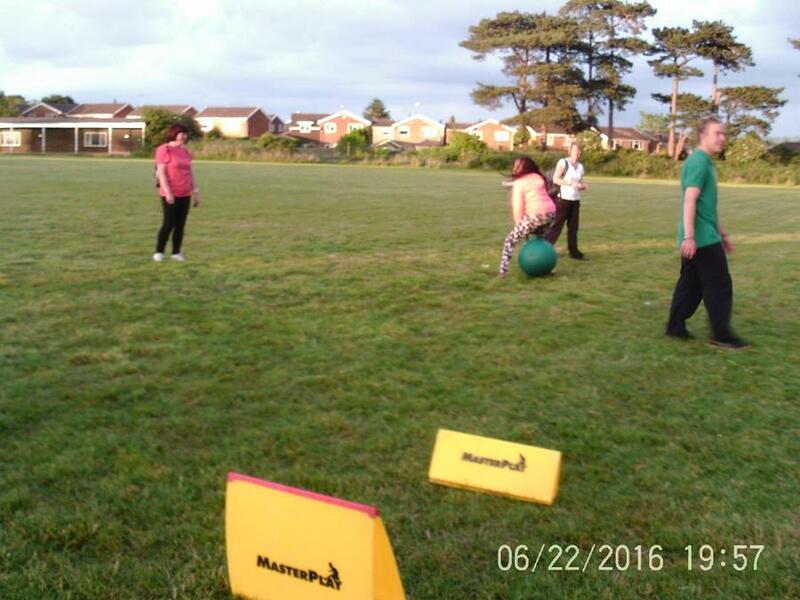 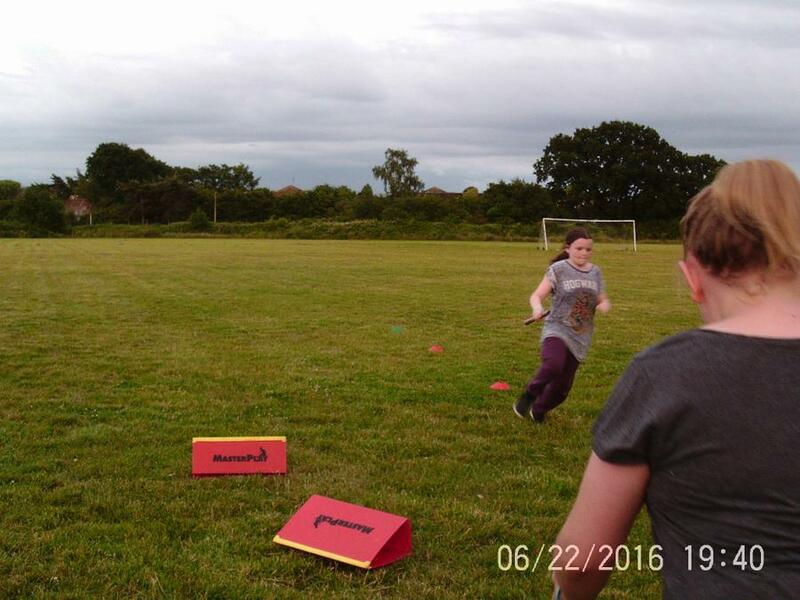 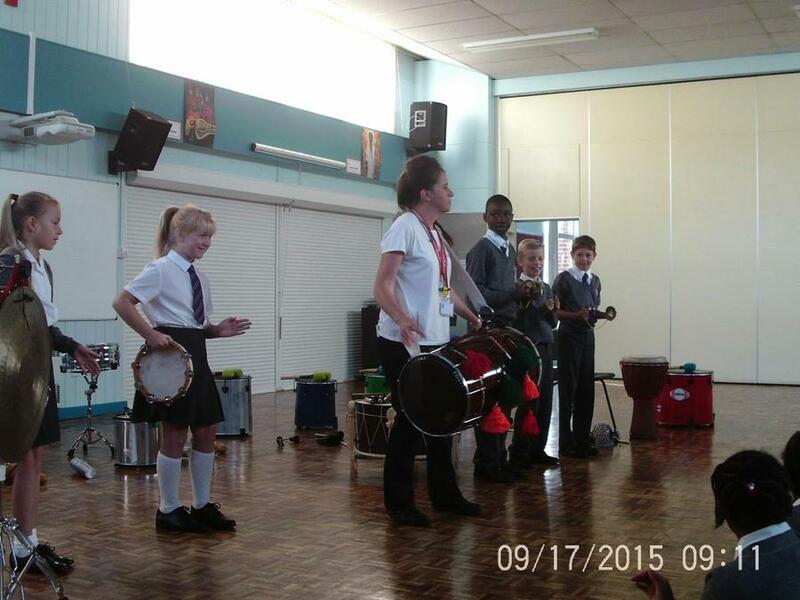 You are supported by Mrs Sharp, Mrs McGinley, Mrs H, Mrs Wiseman and Mrs Roskilly. 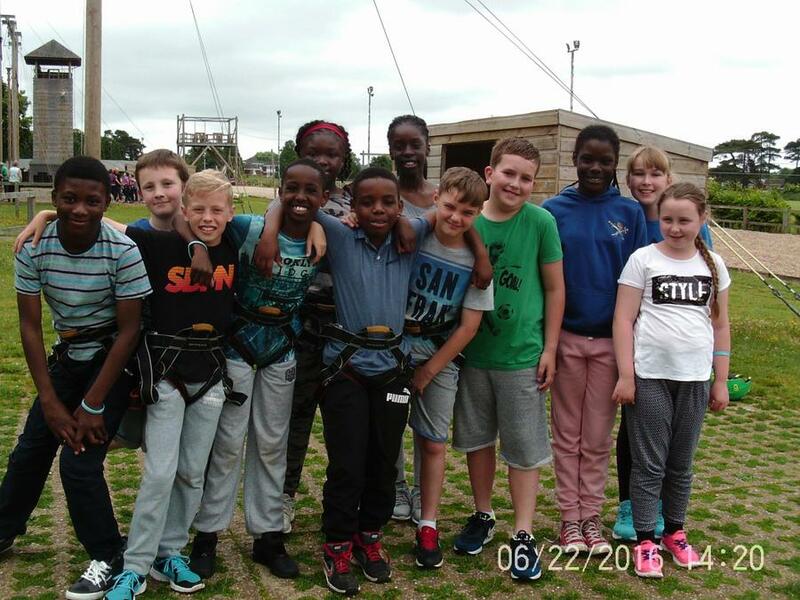 Year six are having a fantastic time. 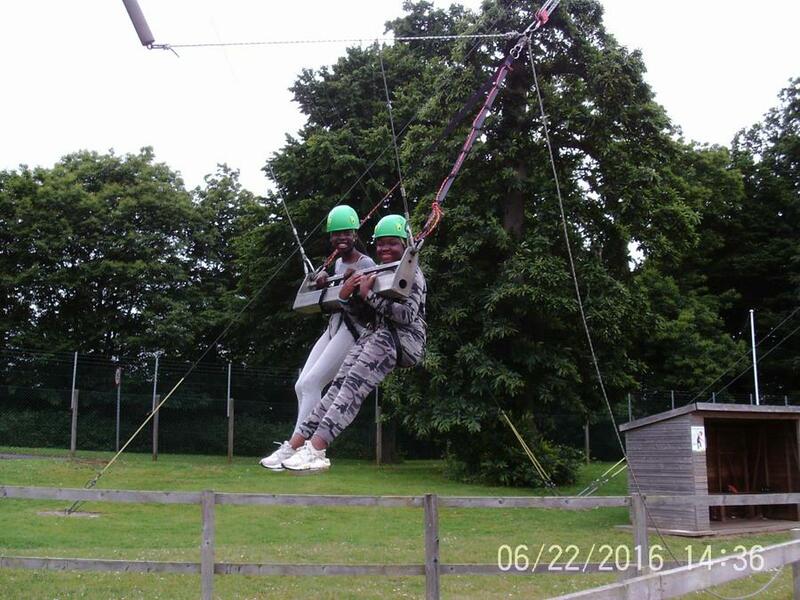 They enjoyed the 3G swing and aerial runway. 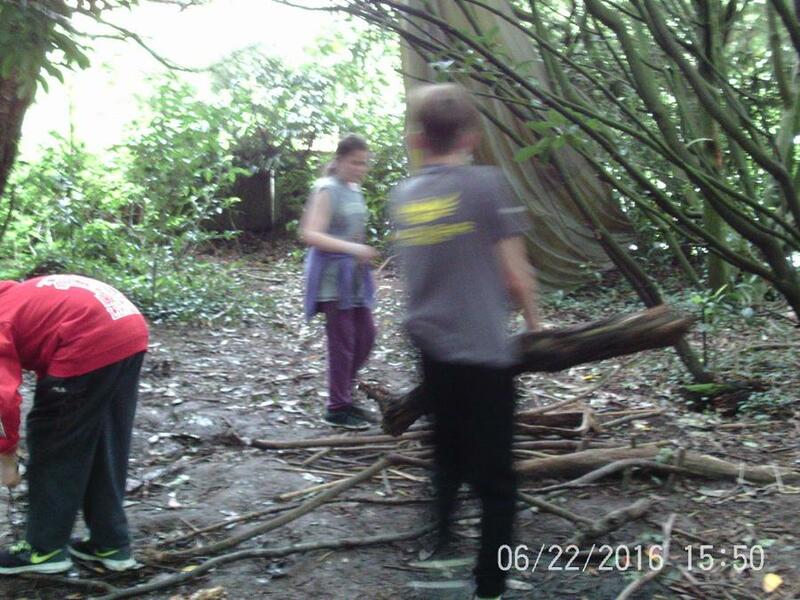 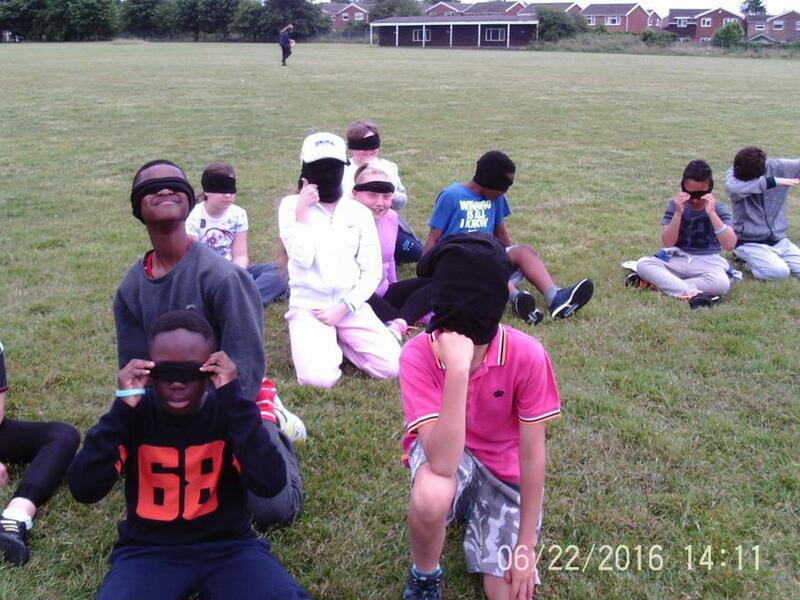 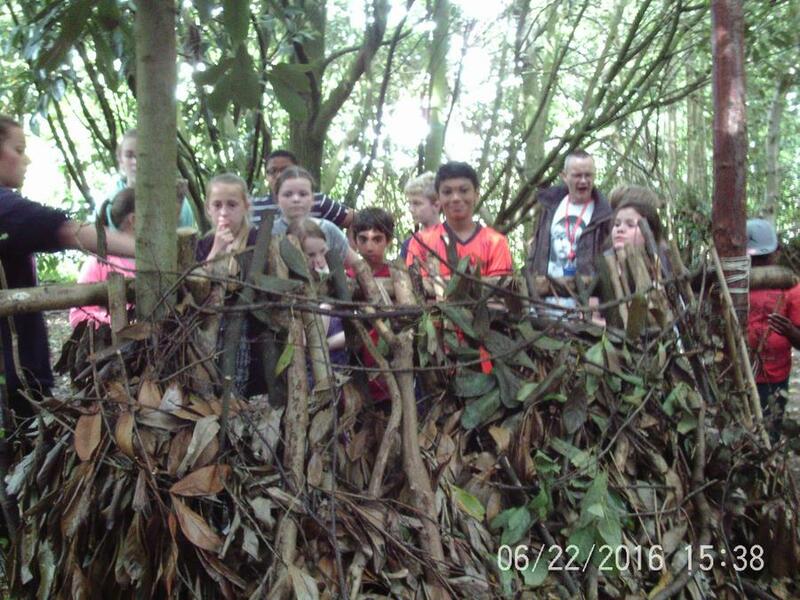 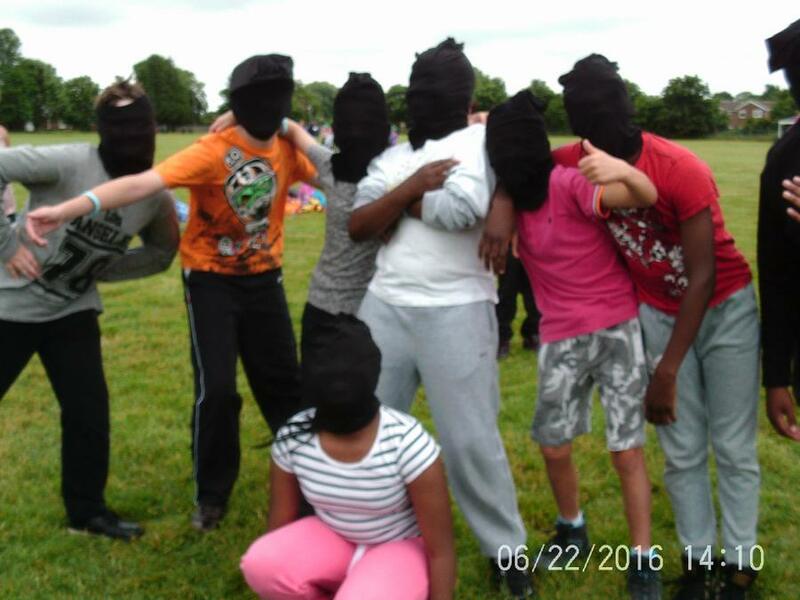 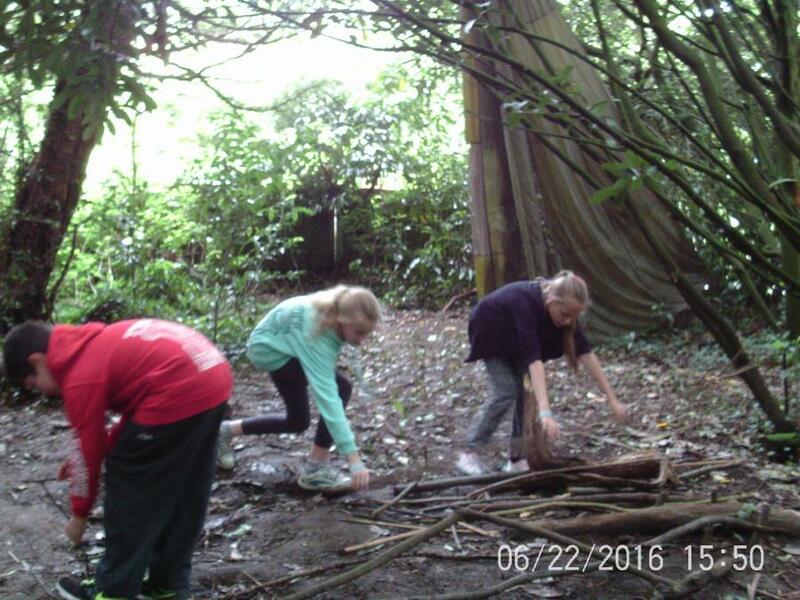 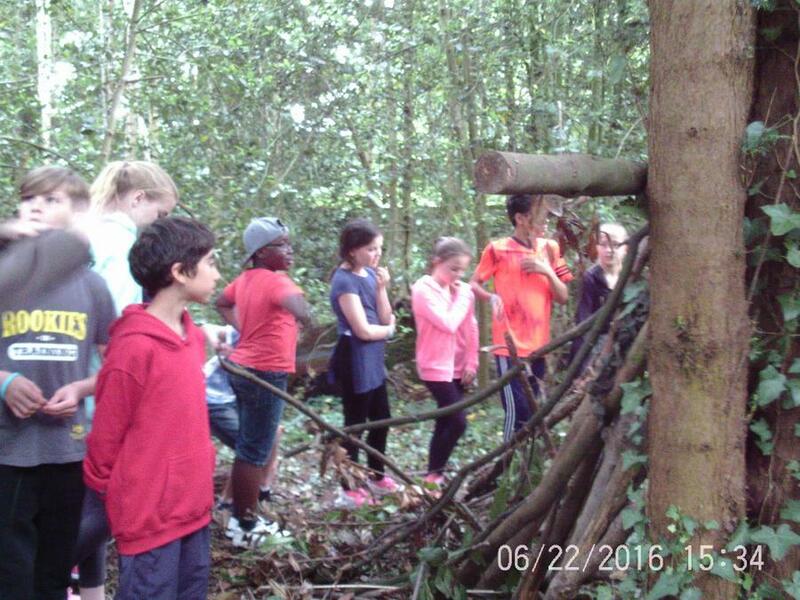 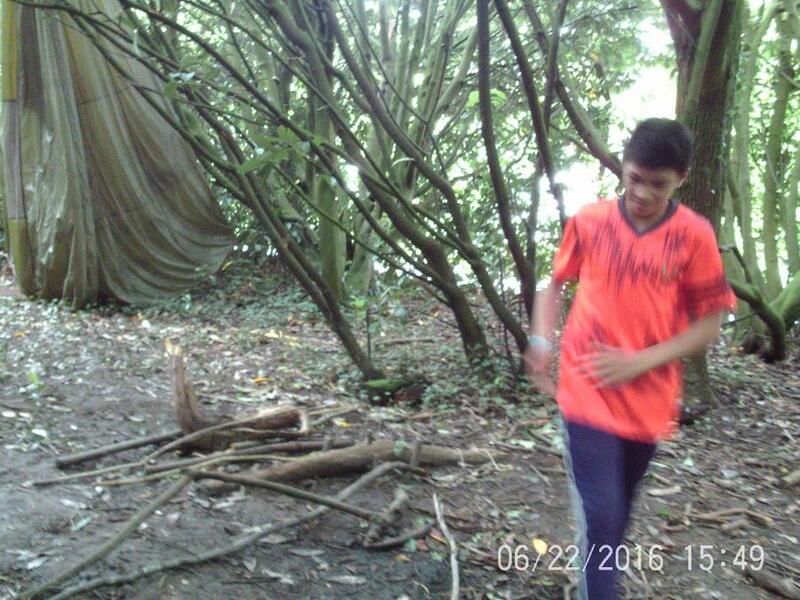 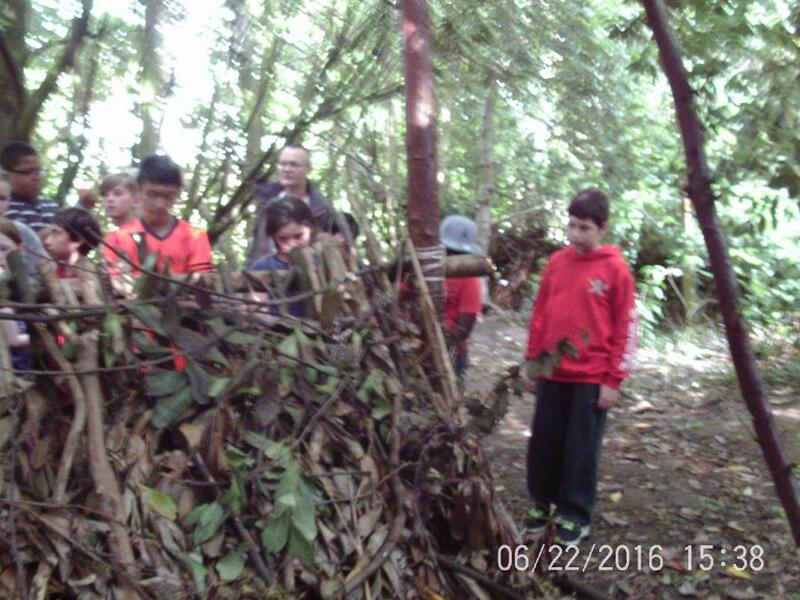 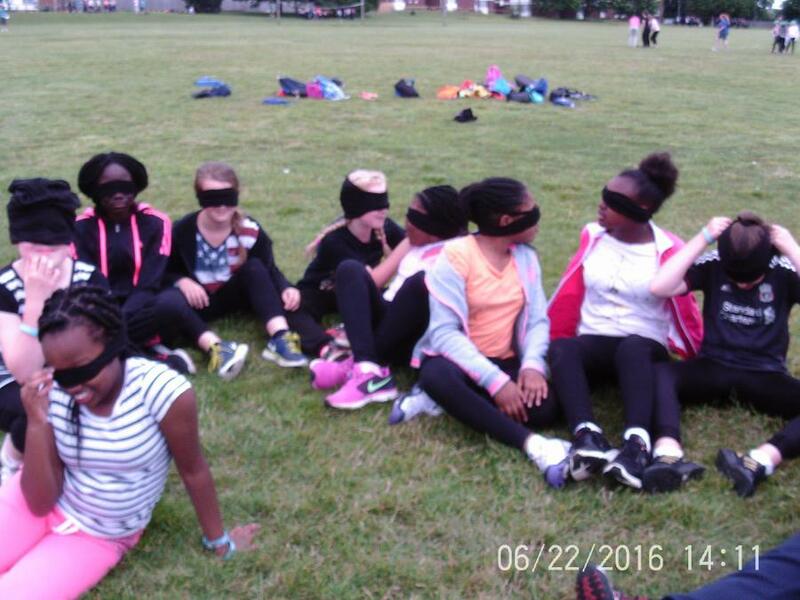 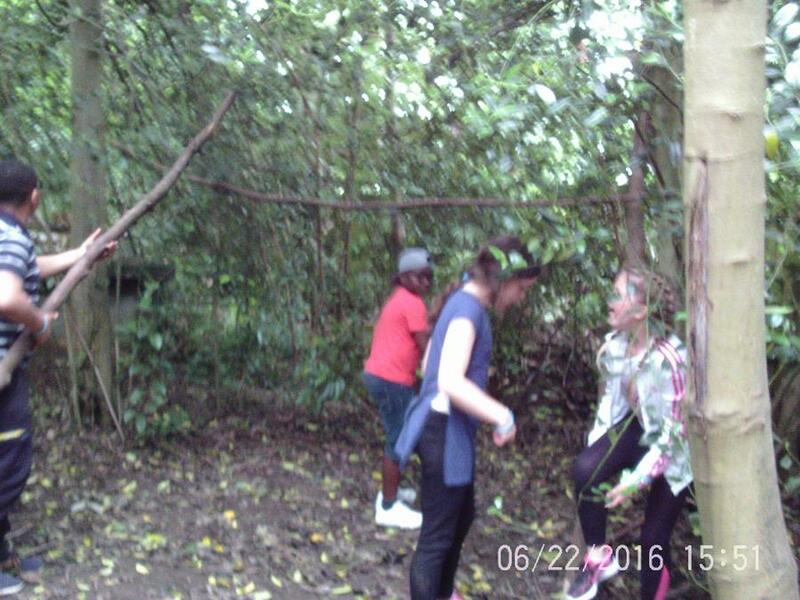 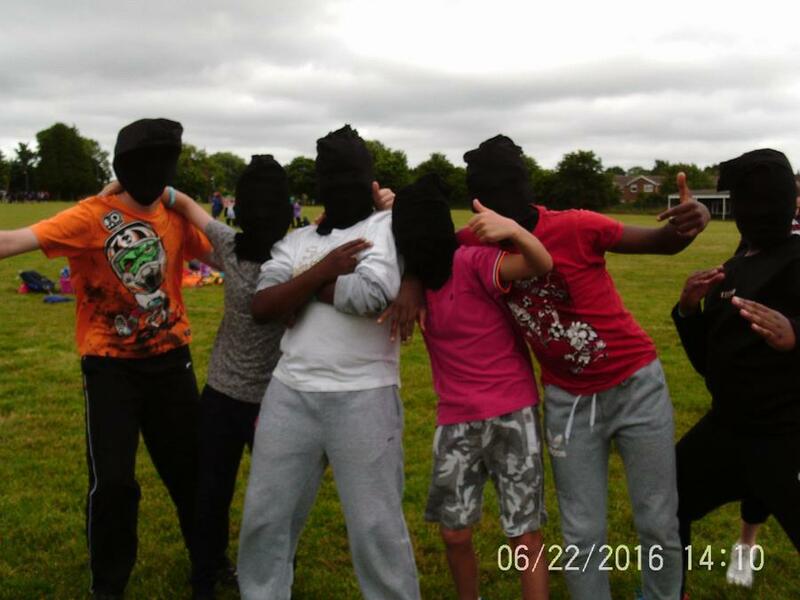 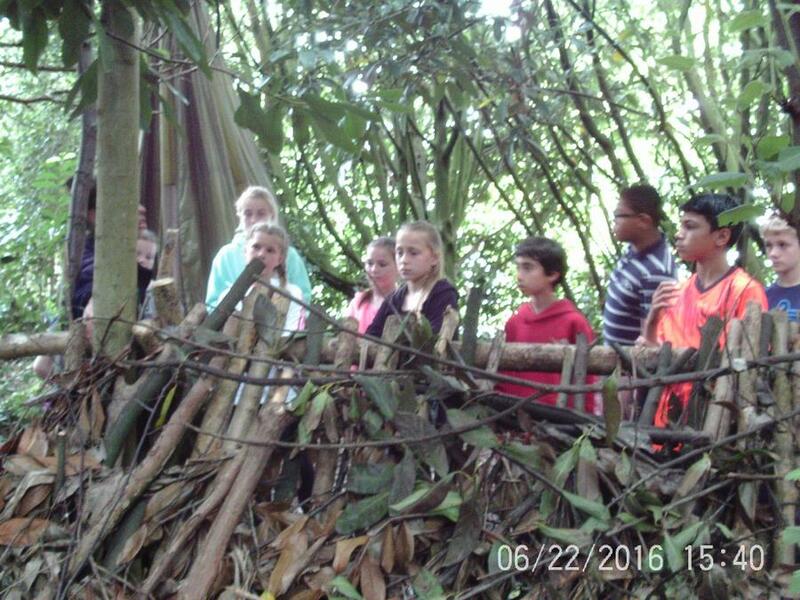 They've also experienced being blindfolded for nightline and learnt how to build shelters in the bushcraft. 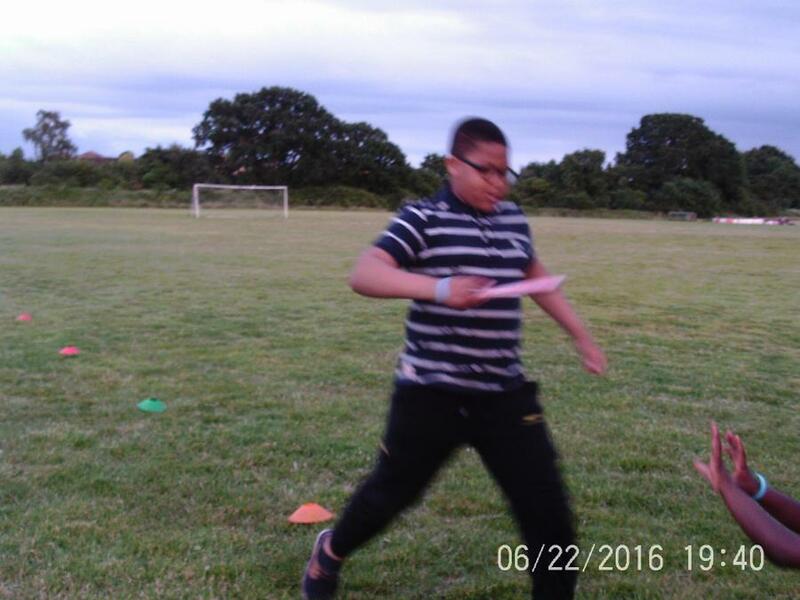 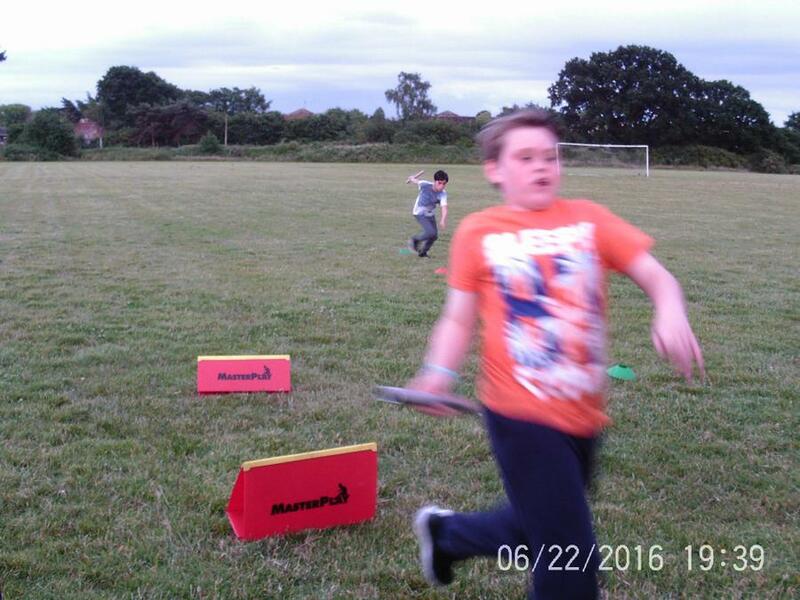 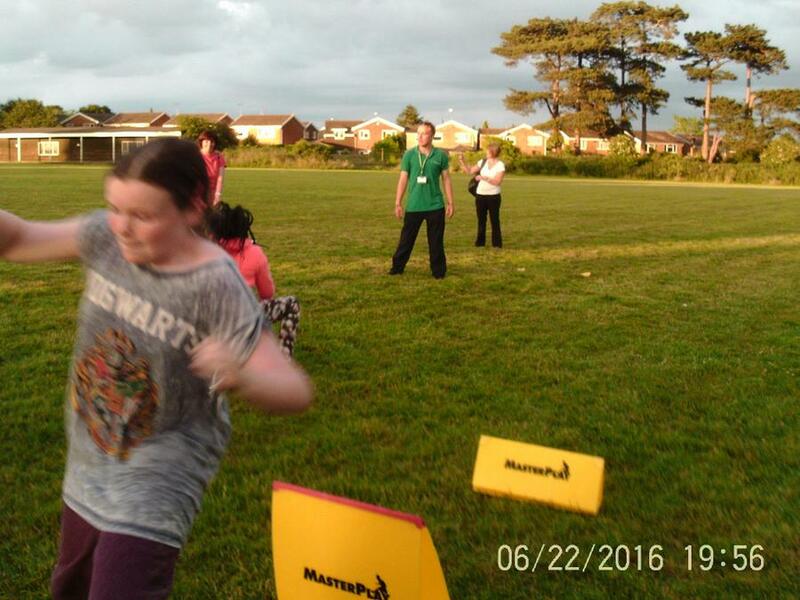 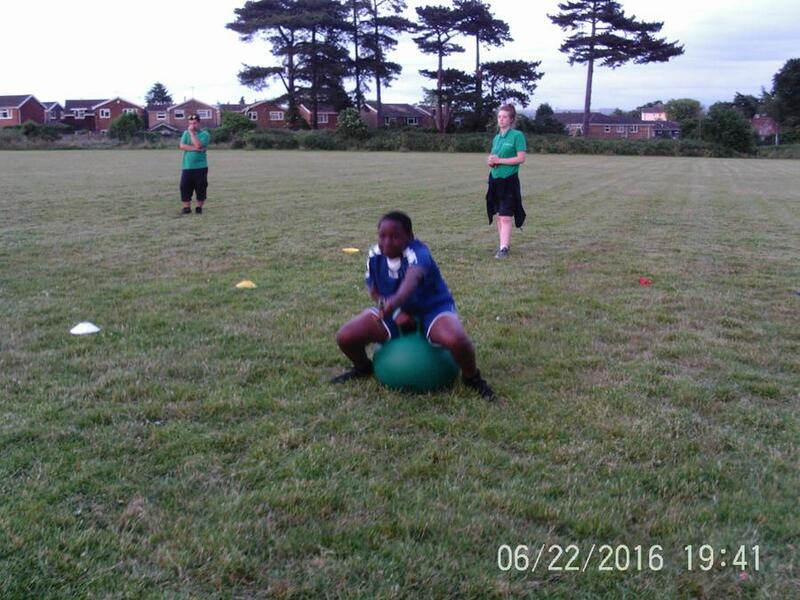 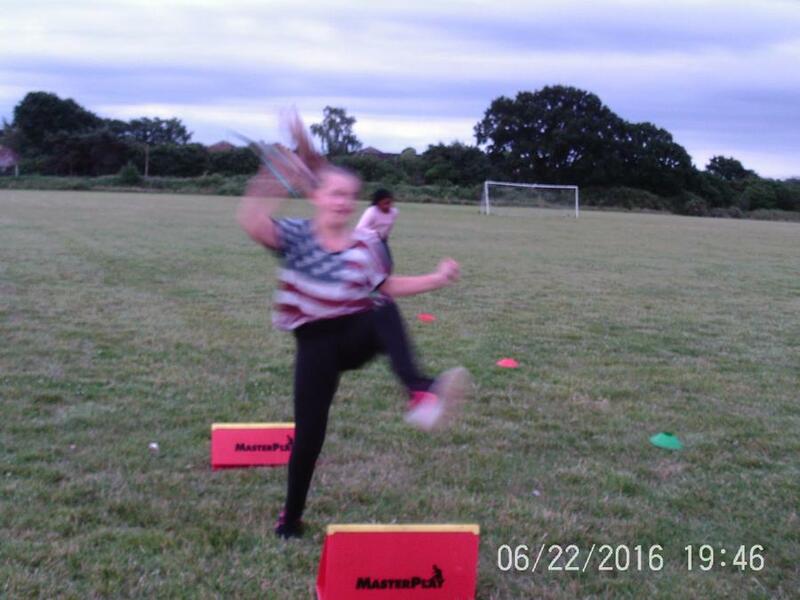 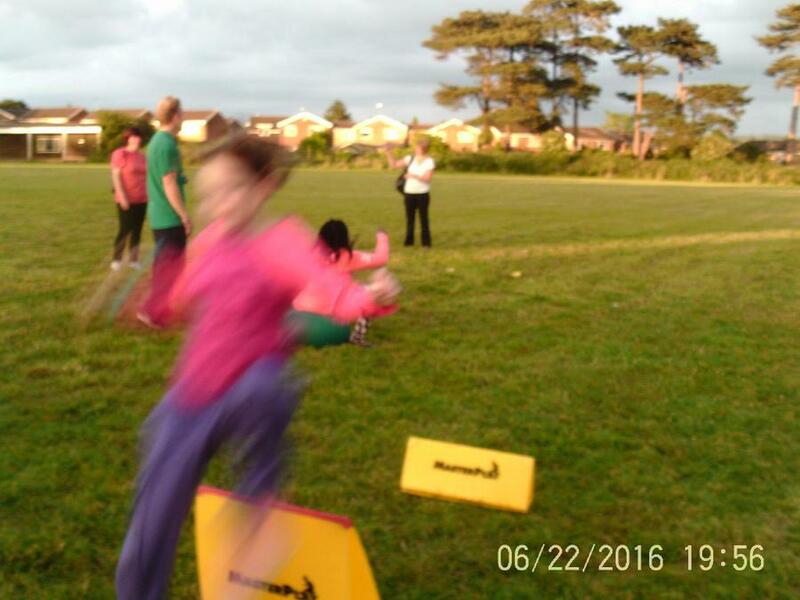 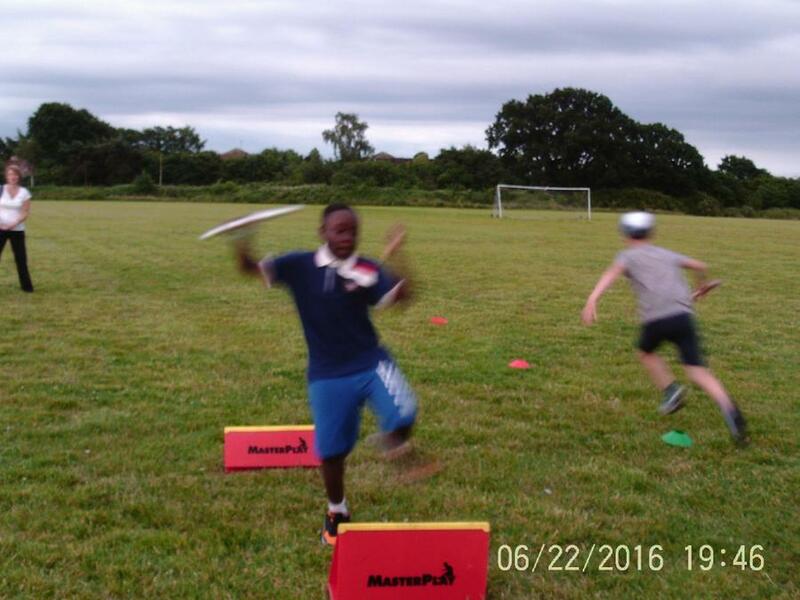 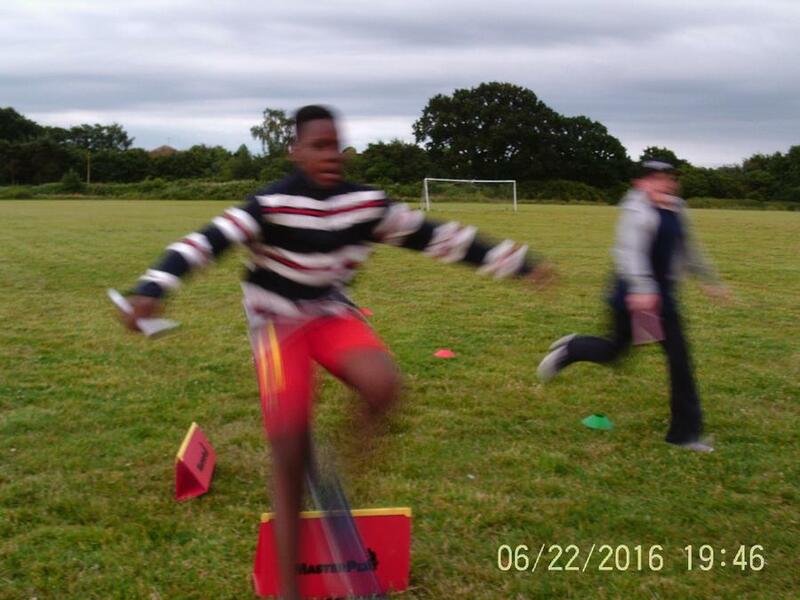 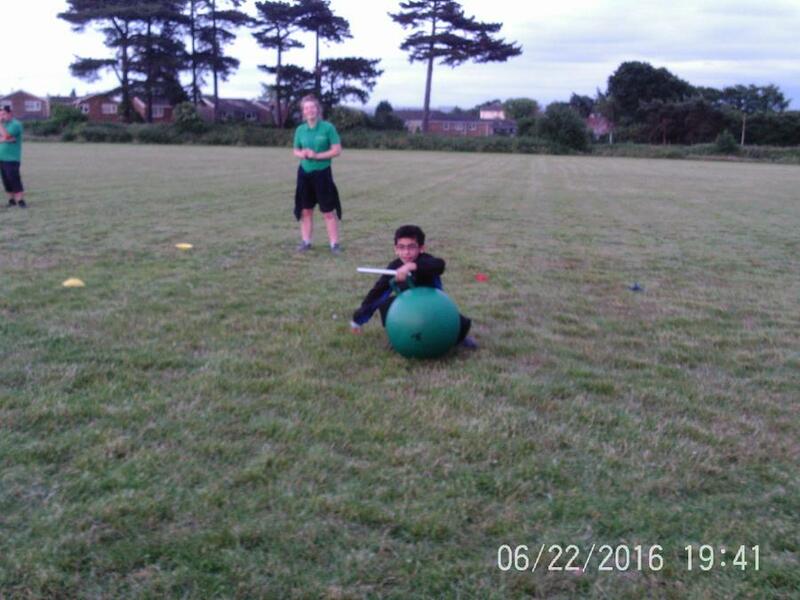 There are also some brilliant action shots of the hilarious olympics! 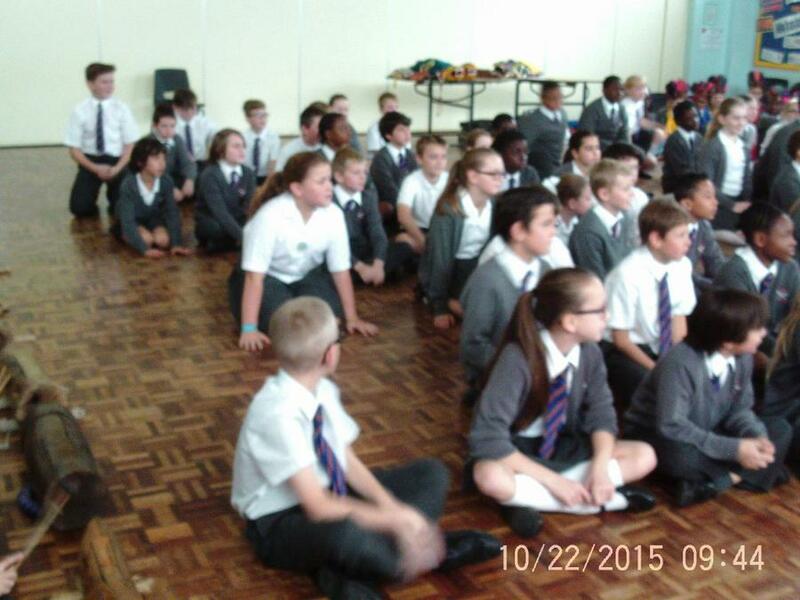 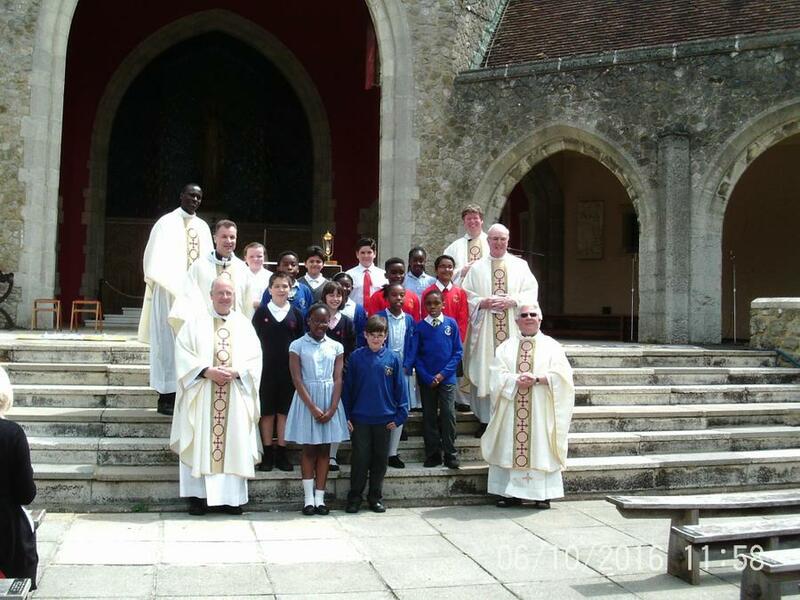 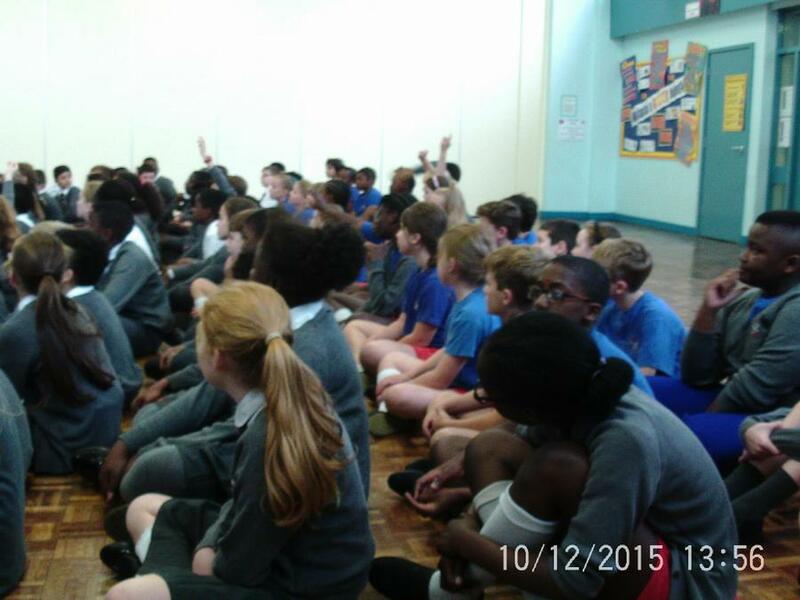 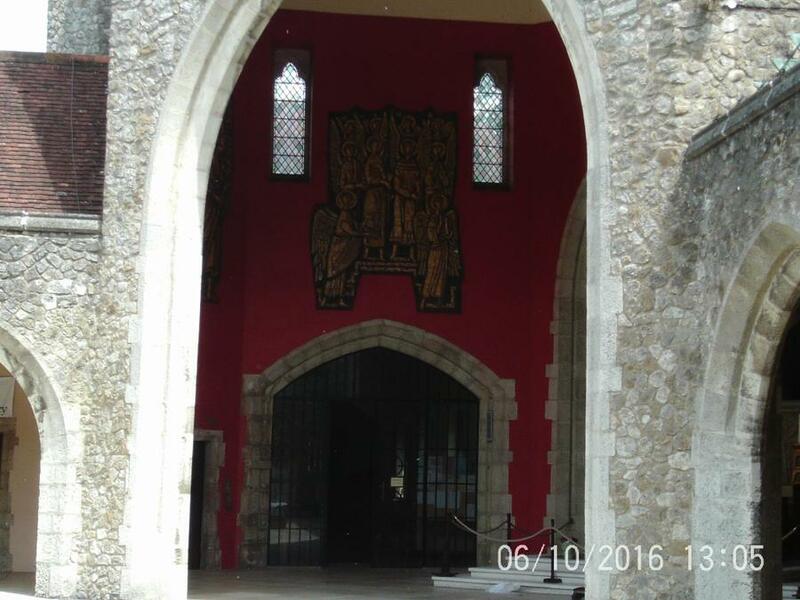 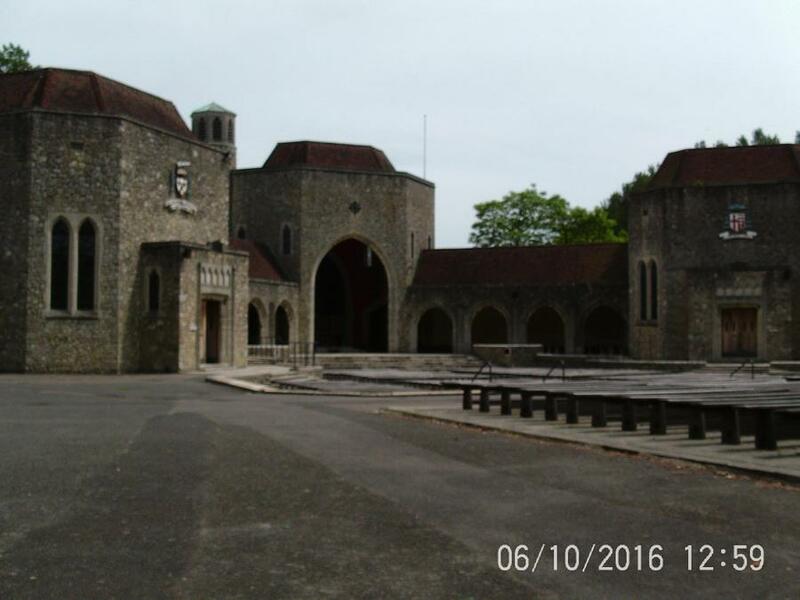 Year six joined other Deanery schools for a retreat day at Aylesford Priory. 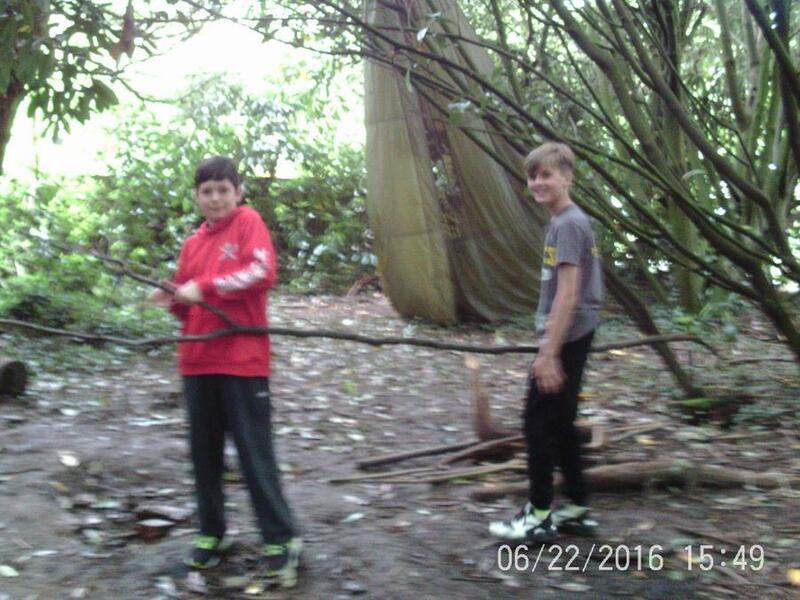 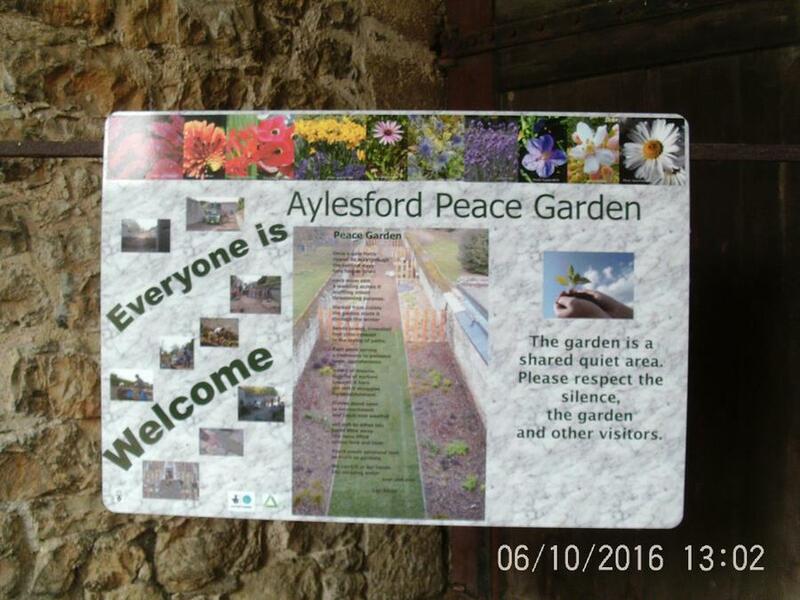 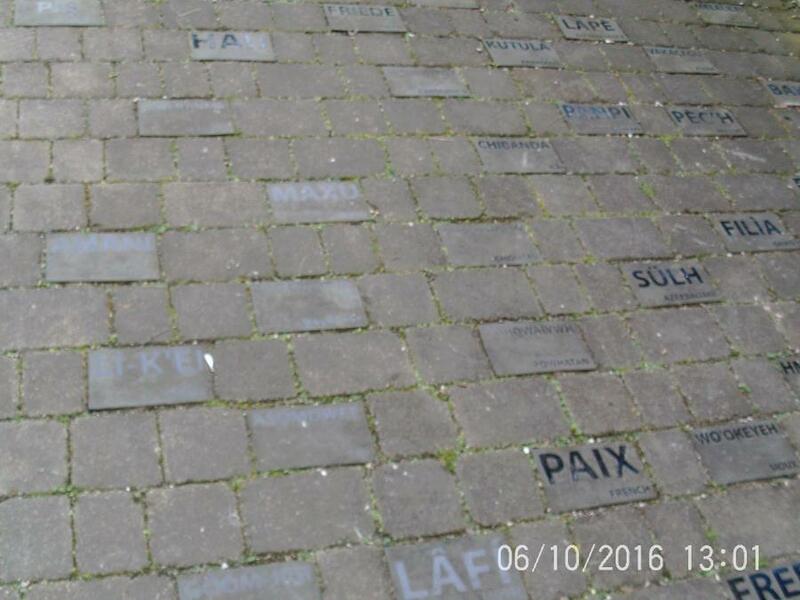 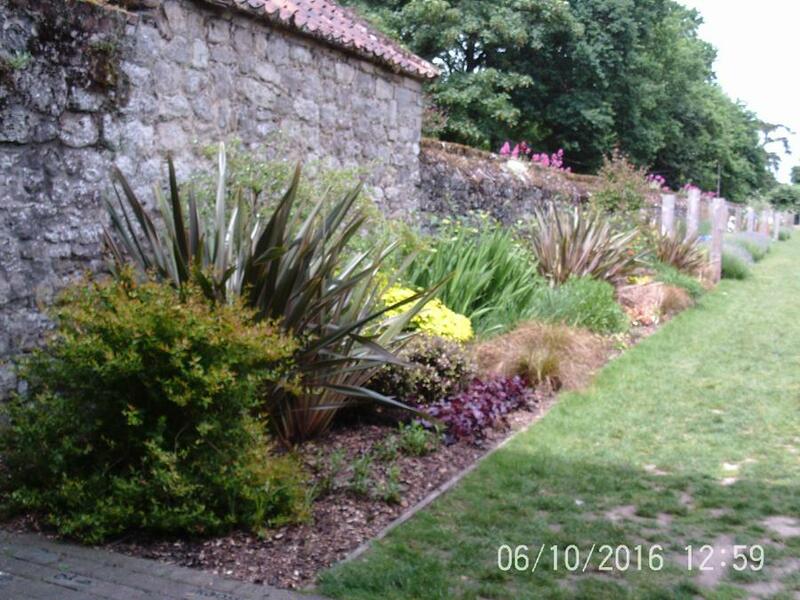 We spent some time exploring the Peace Garden and also working out the images of Jesus' life. 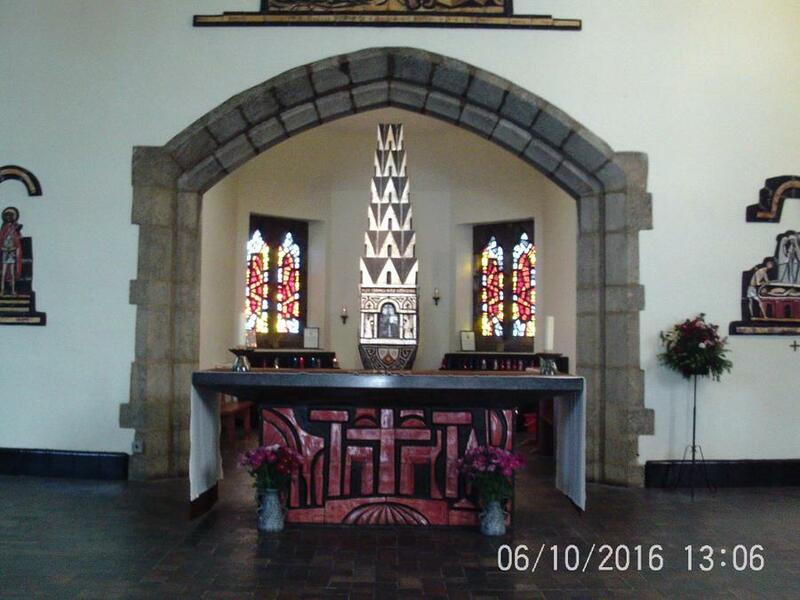 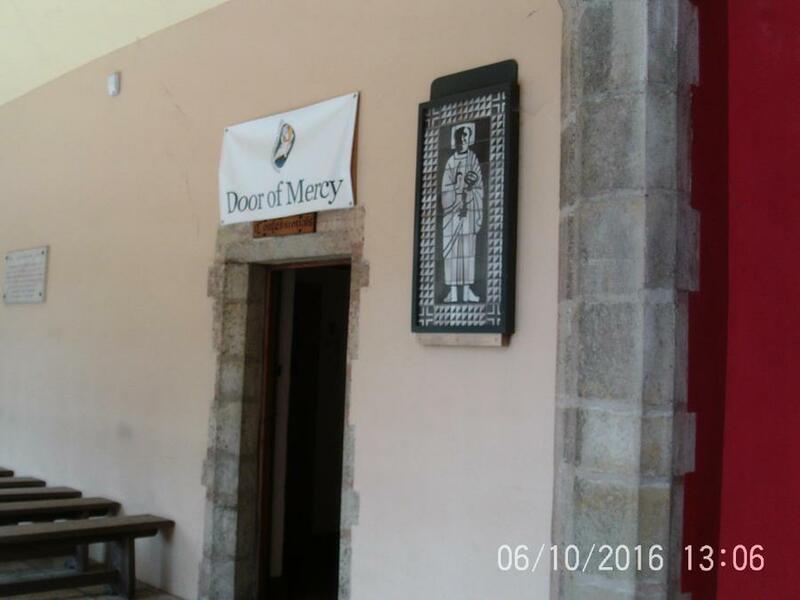 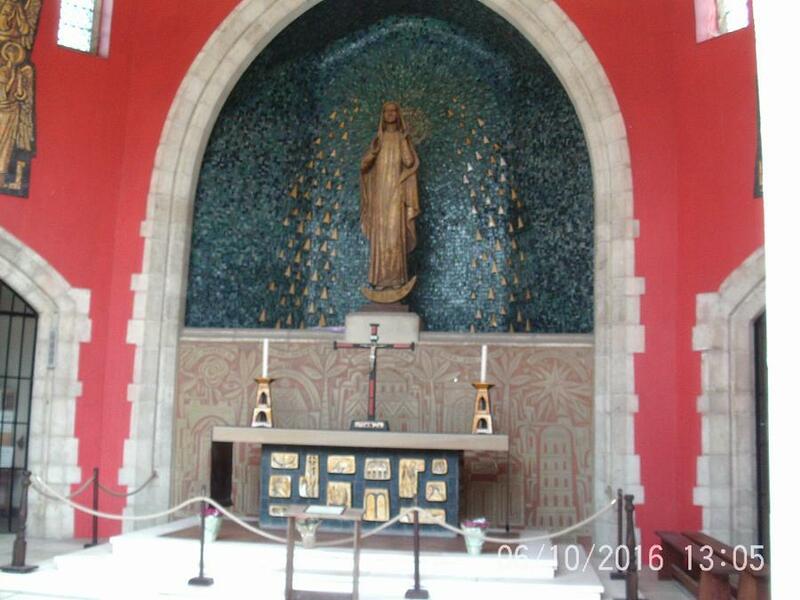 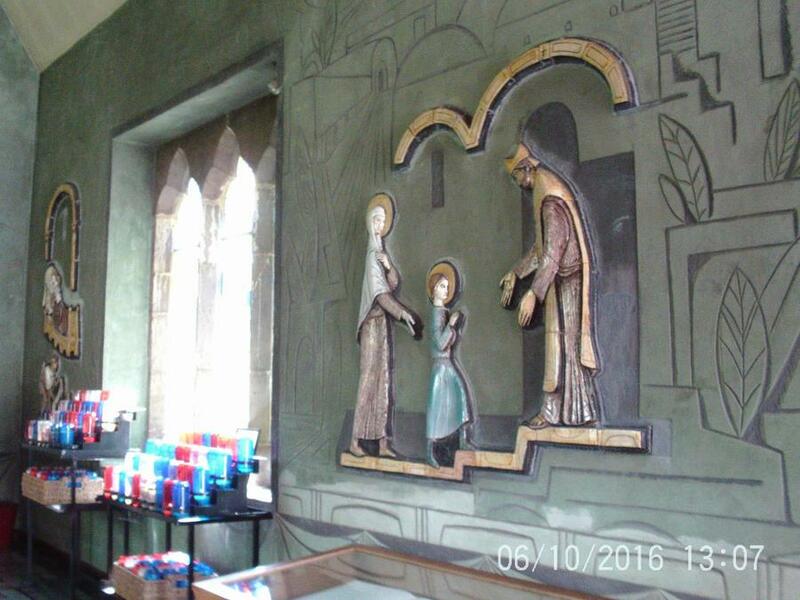 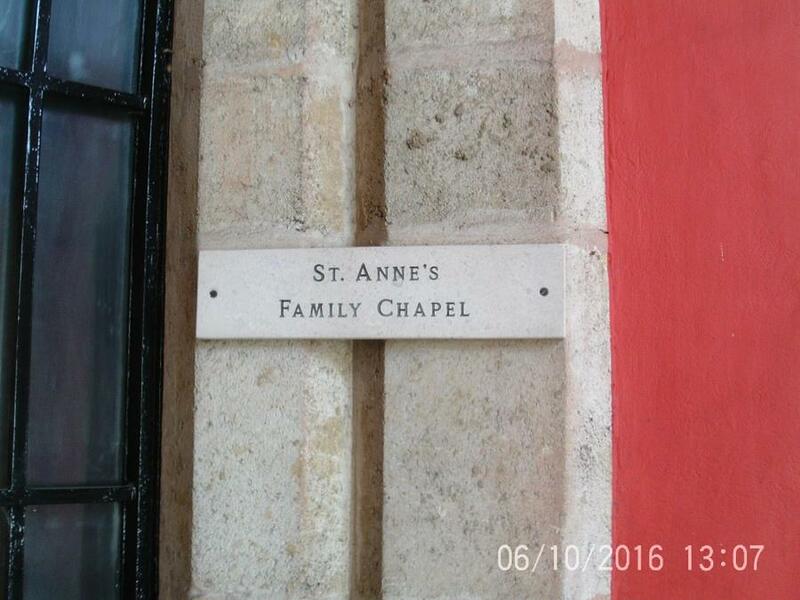 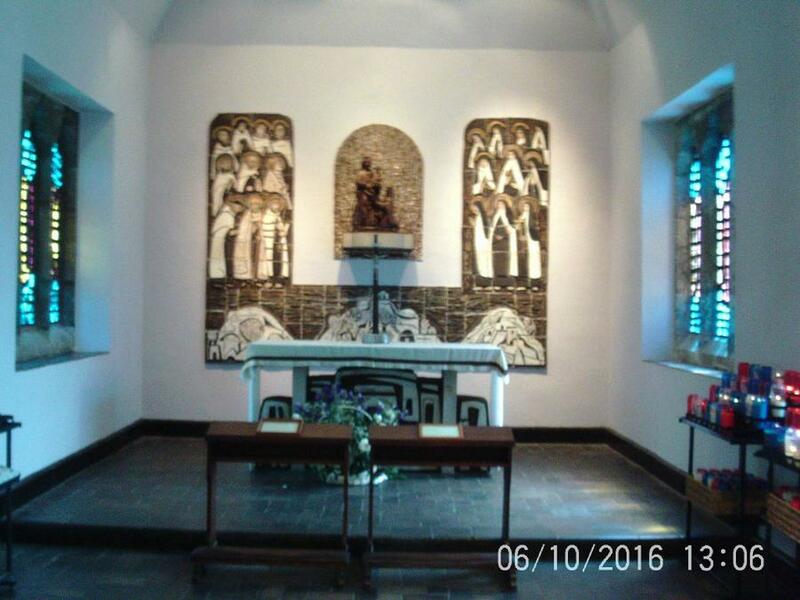 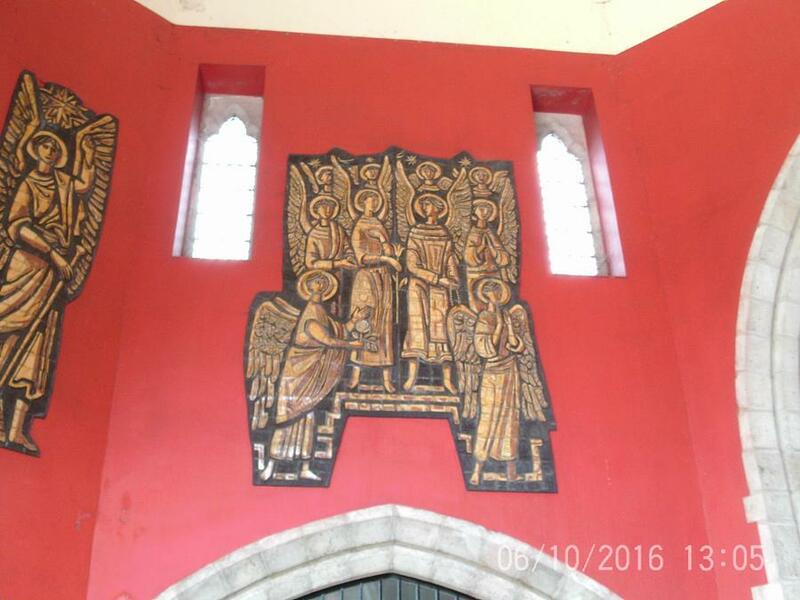 We particularly appreciated the chance to enter the chapels, say a prayer and admire the statues and stained glass windows. 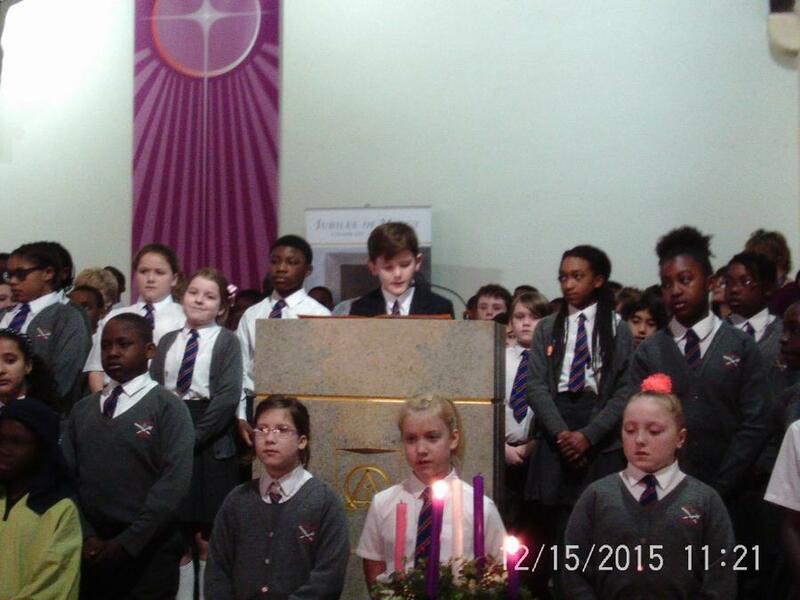 The open air mass was a great success, everyone joined in respectfully. 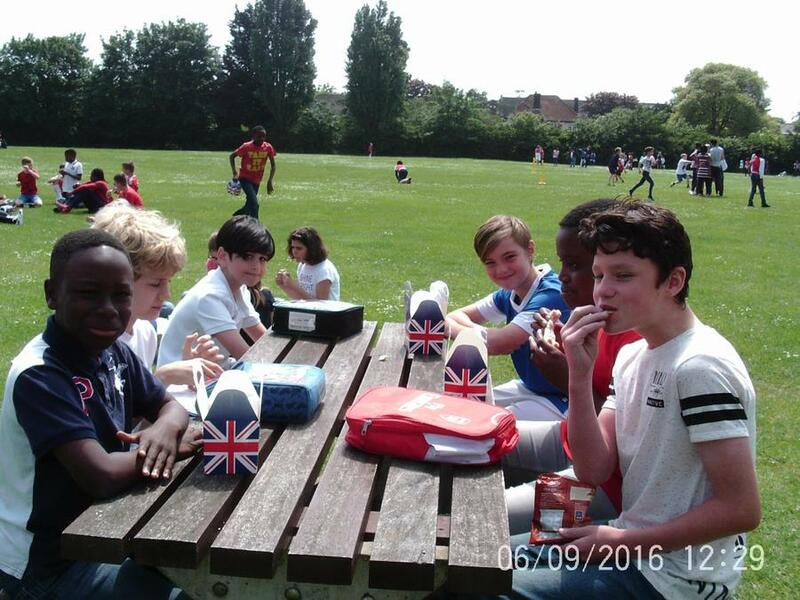 ​Finally we ate a picnic lunch together and socialised with the other schools. 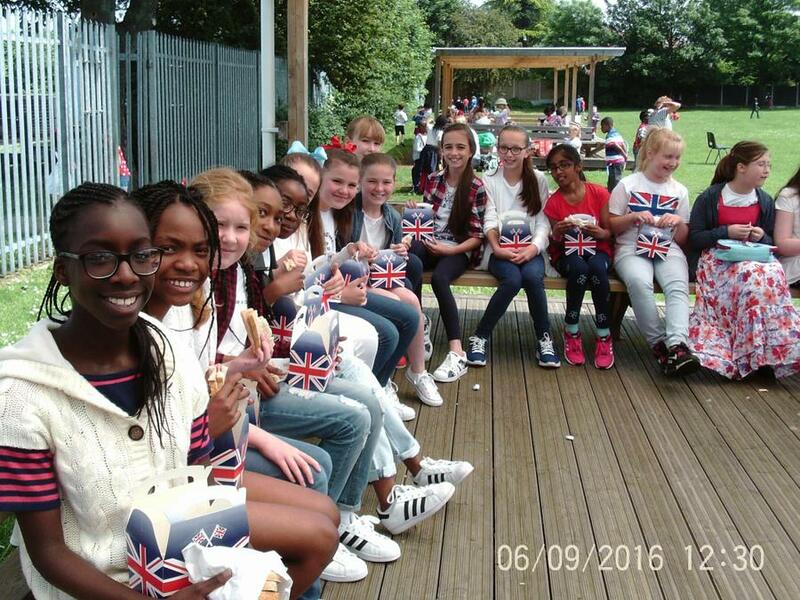 Celebrating the Queen's 90 years! 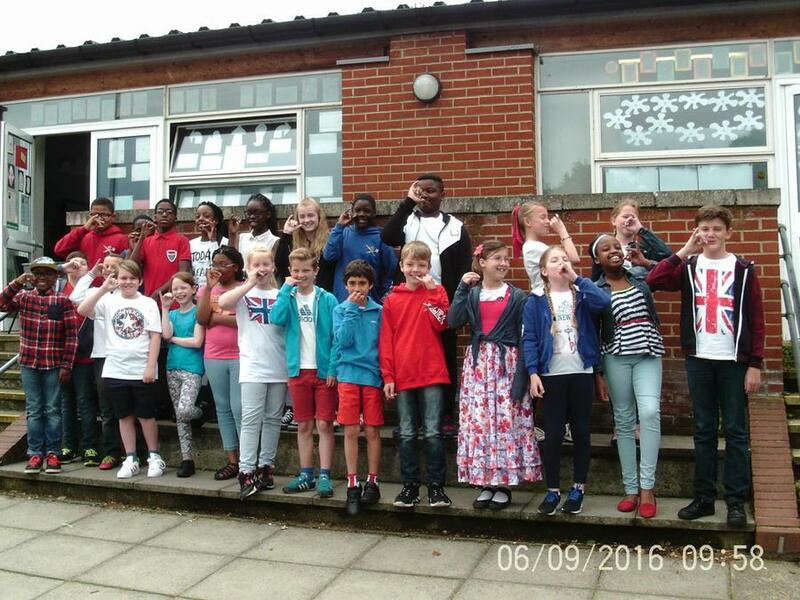 We really enjoyed wearing red, white and blue today. 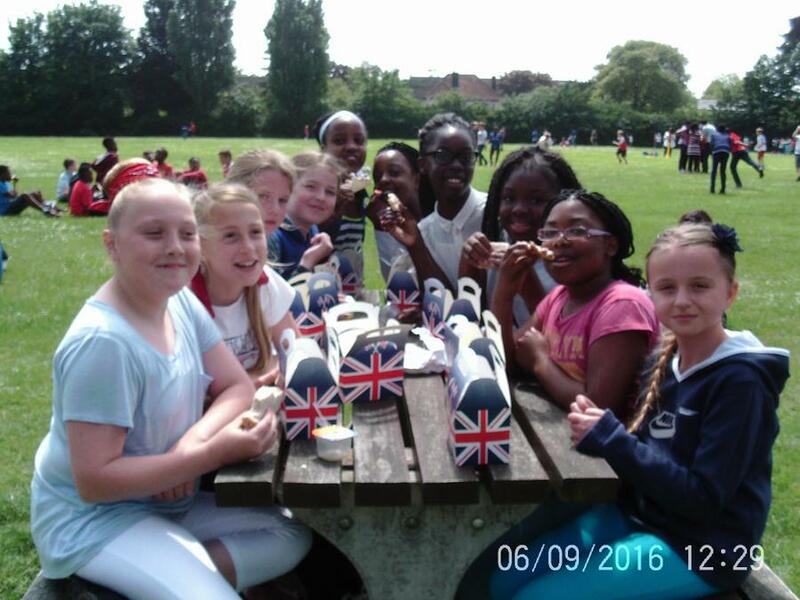 The picnic lunch was a great success. 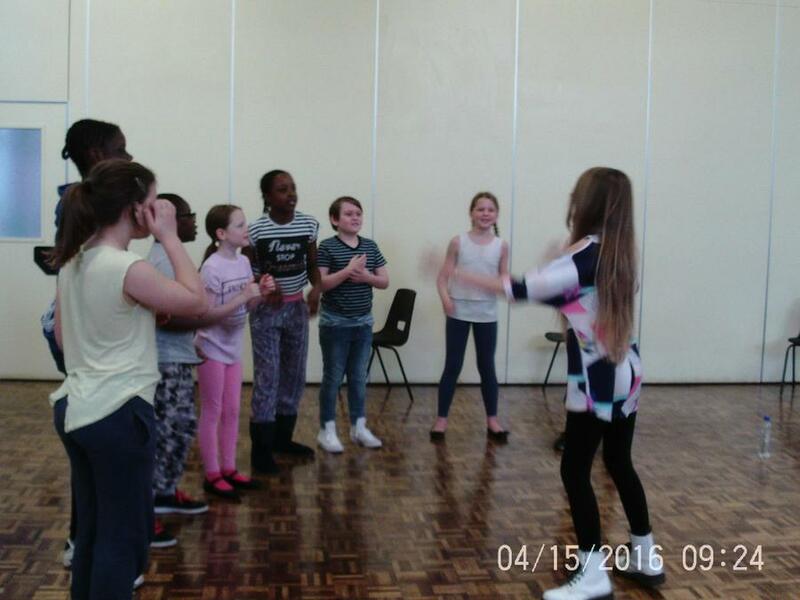 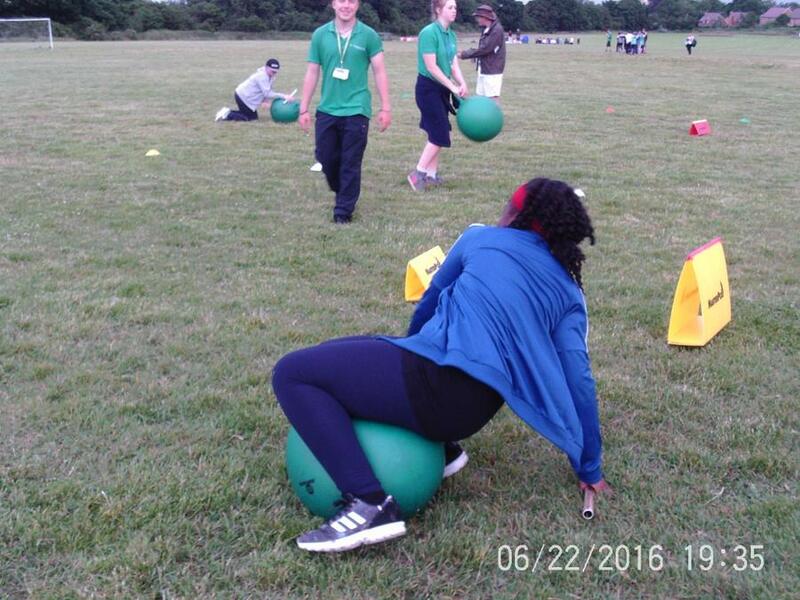 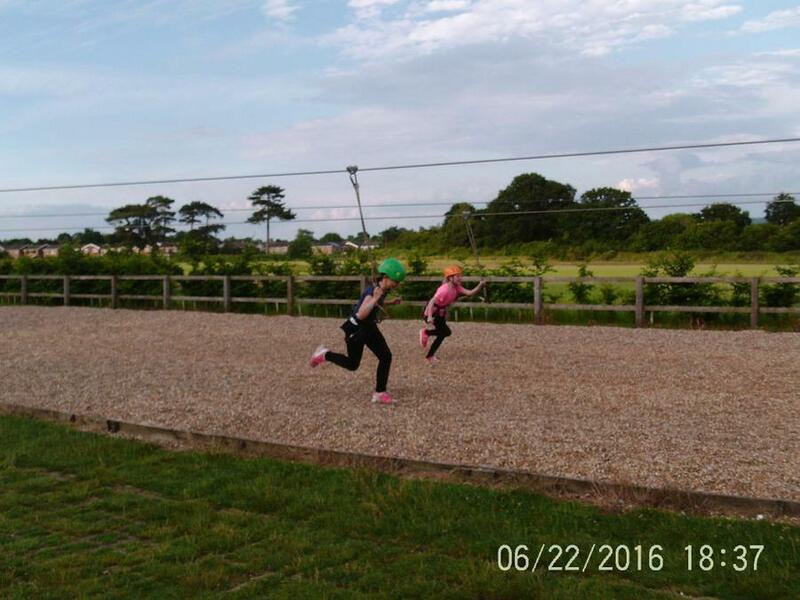 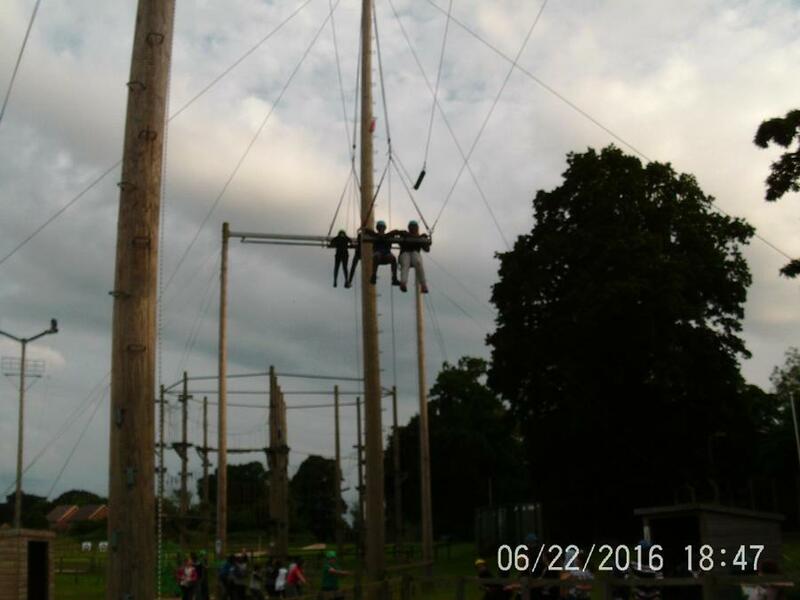 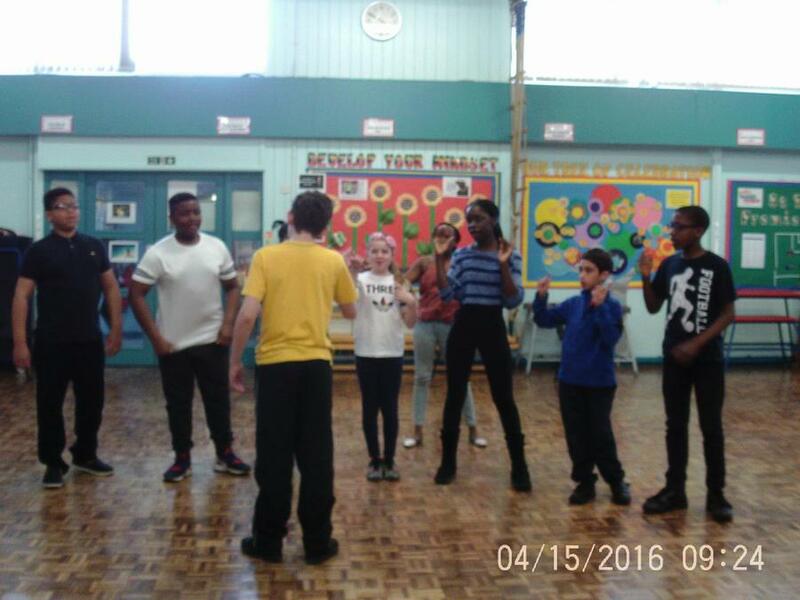 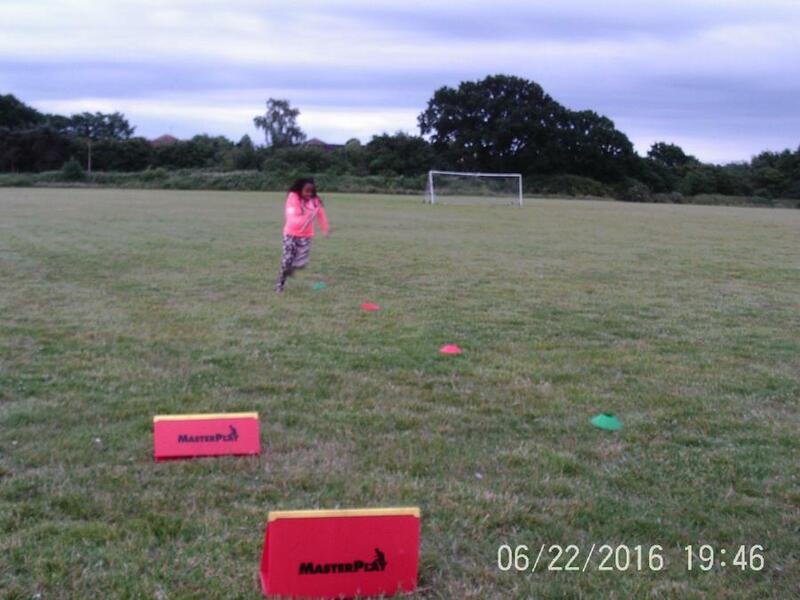 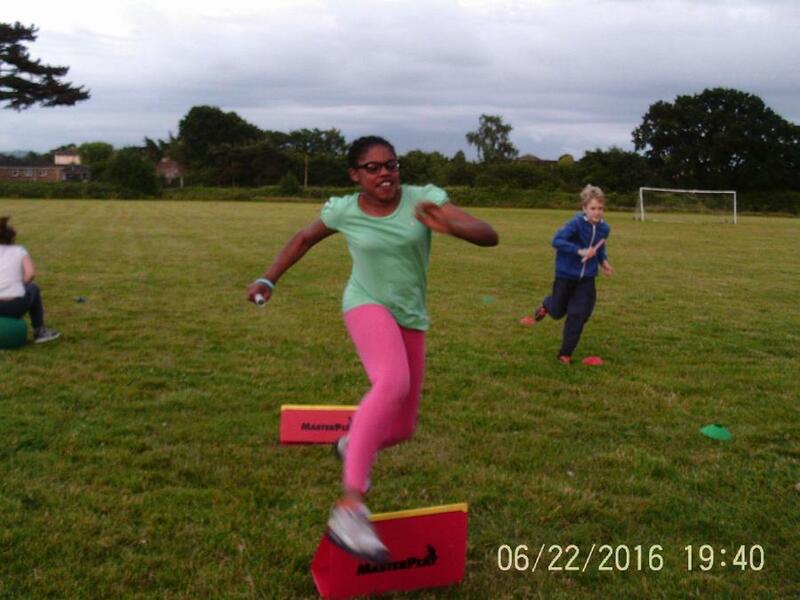 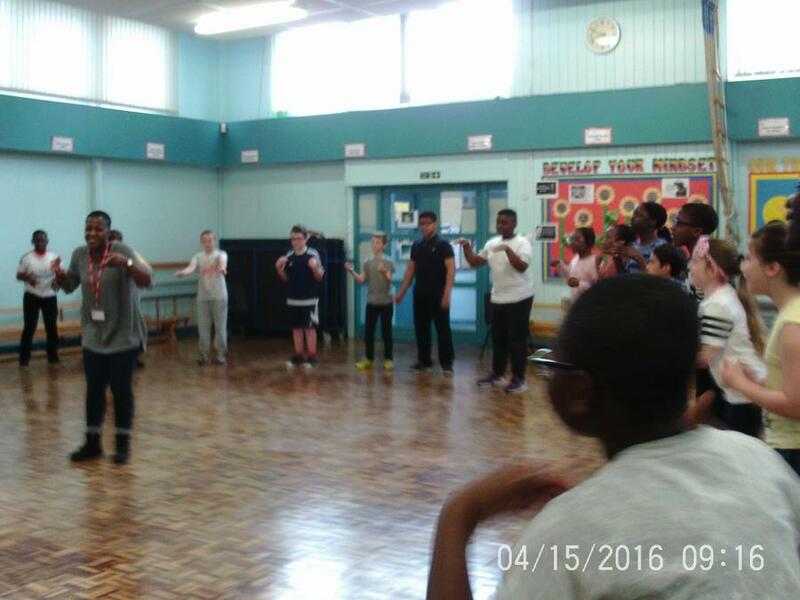 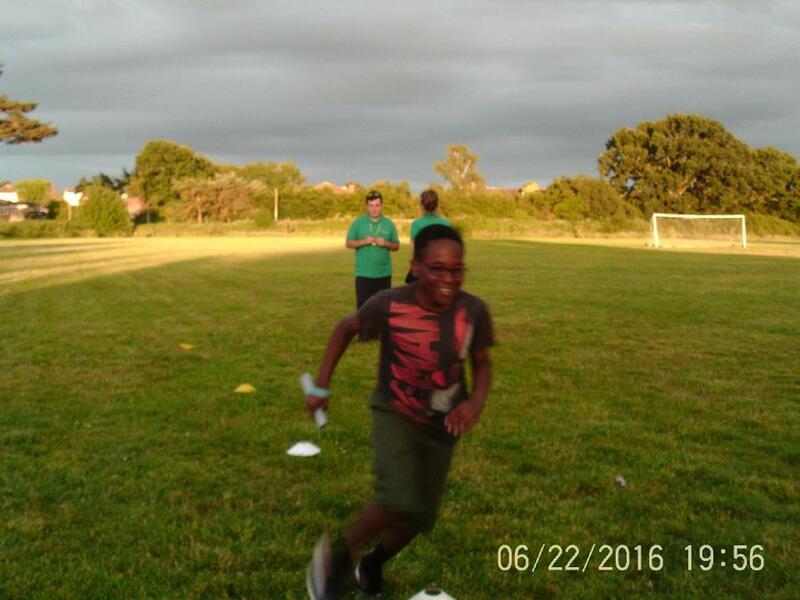 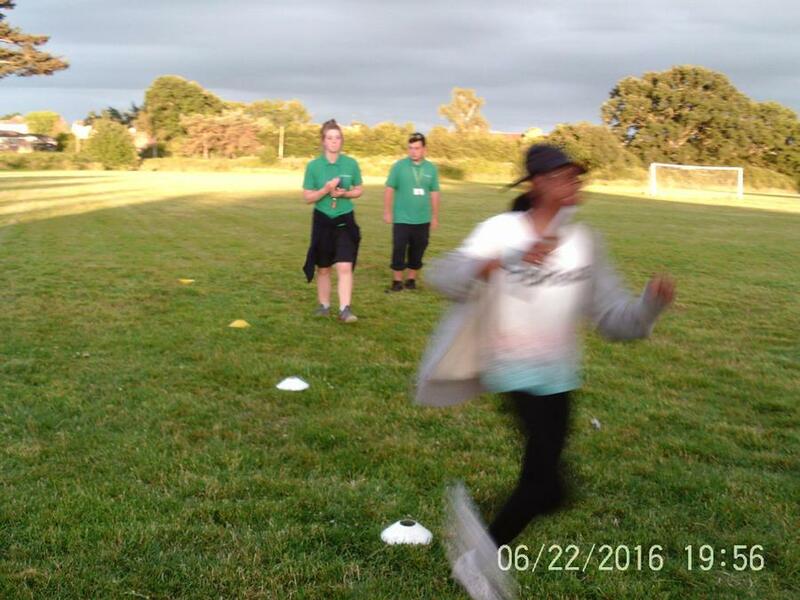 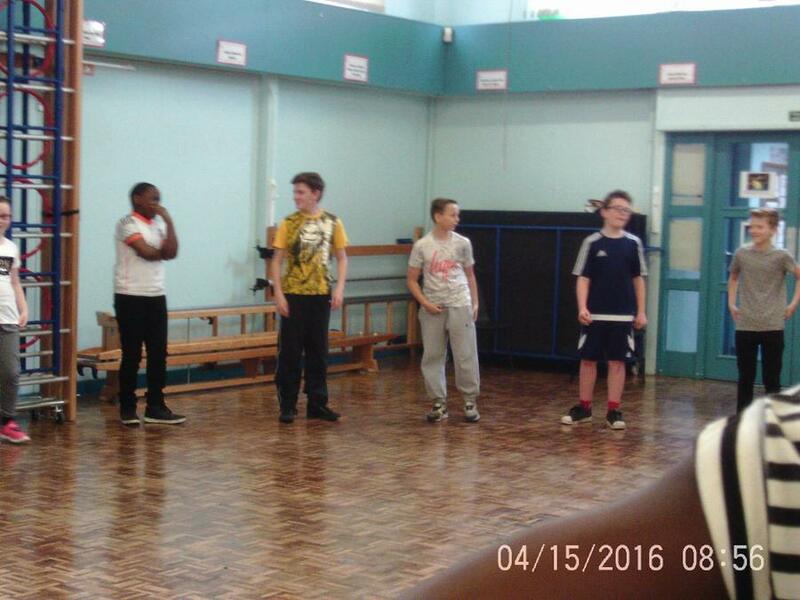 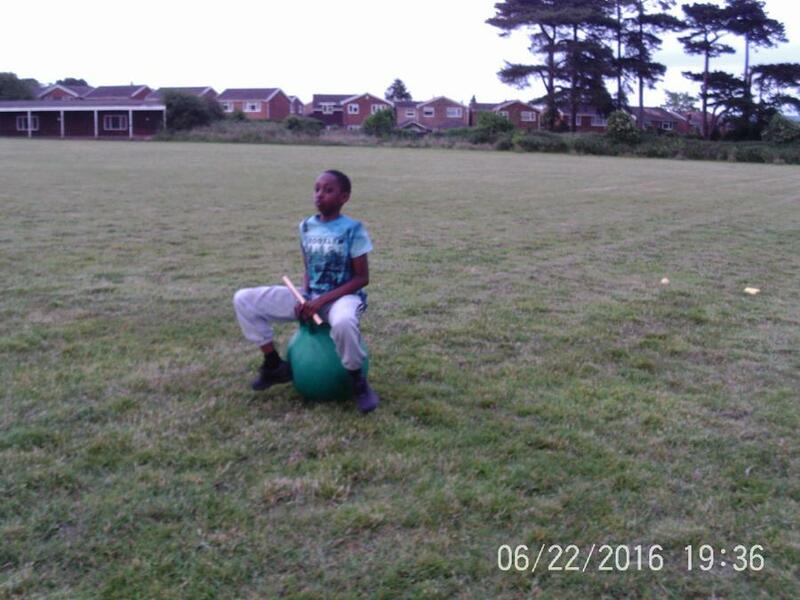 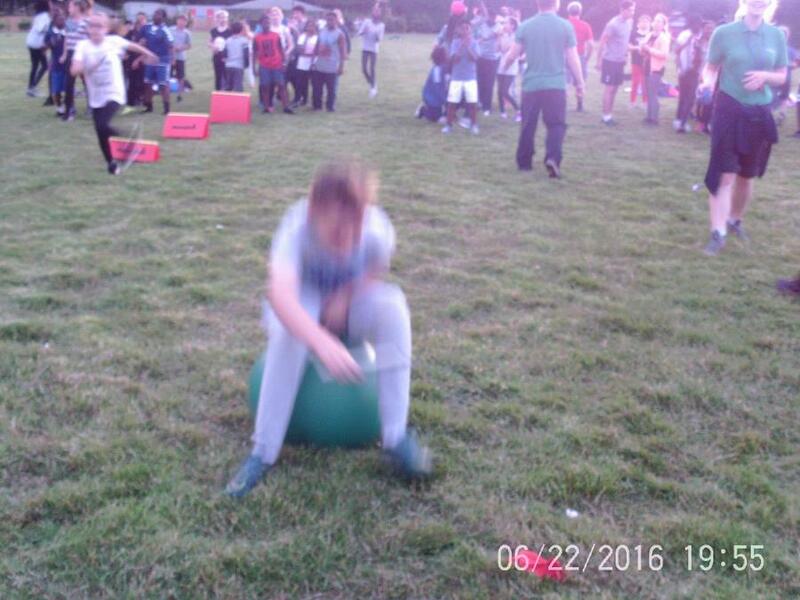 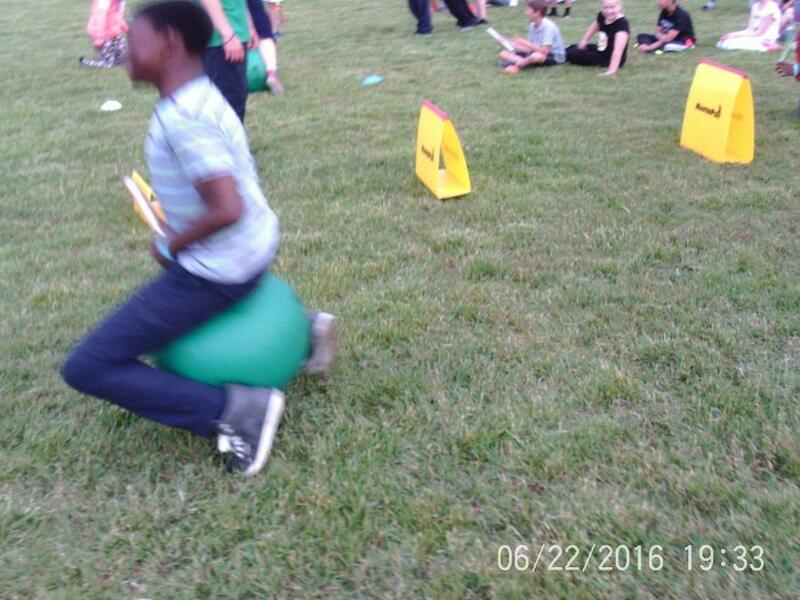 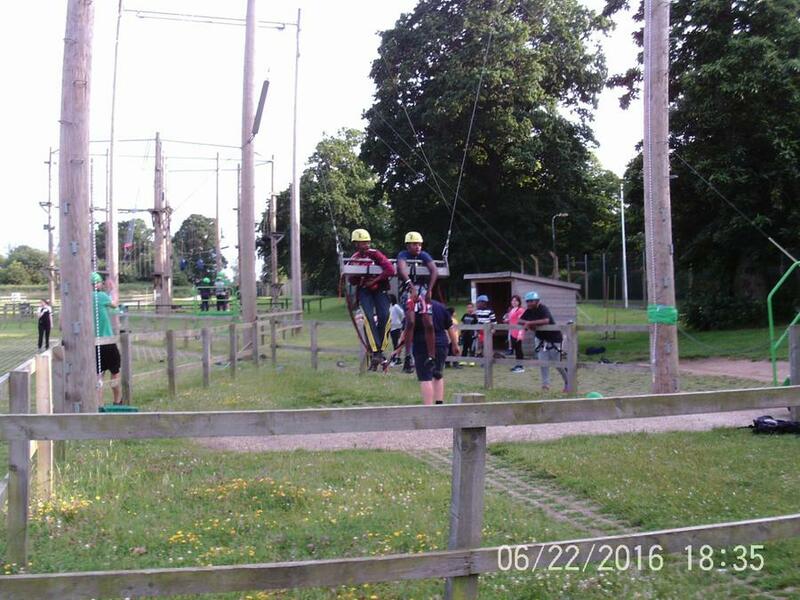 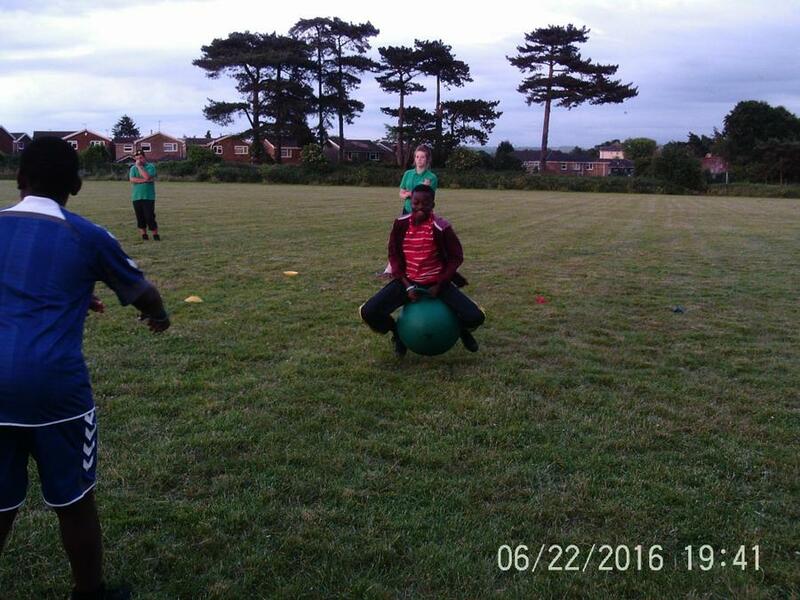 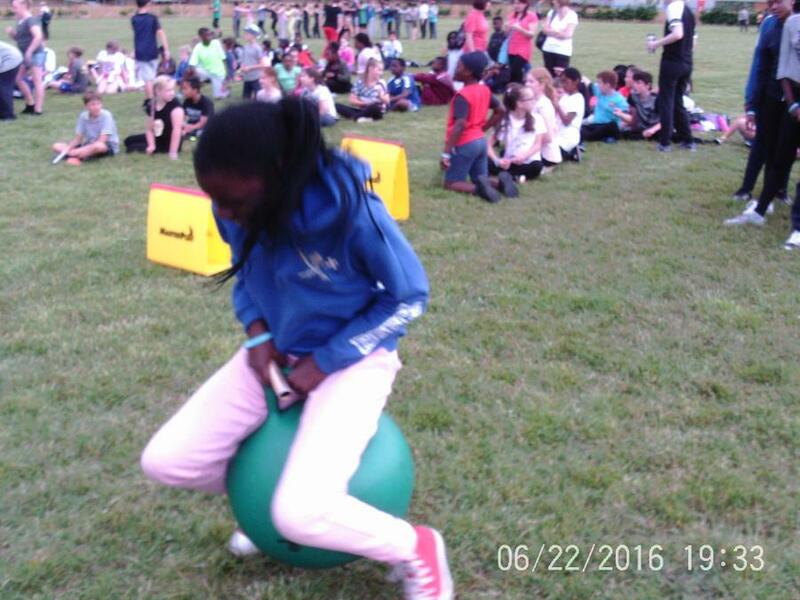 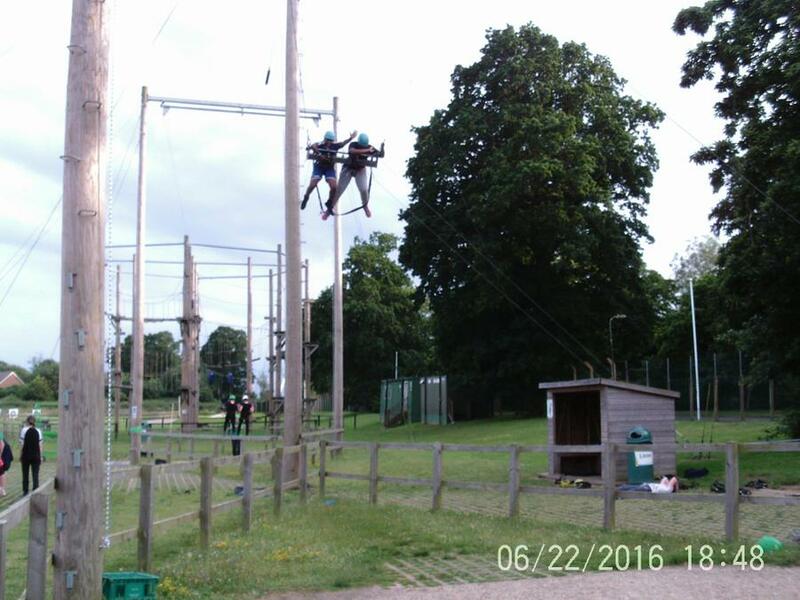 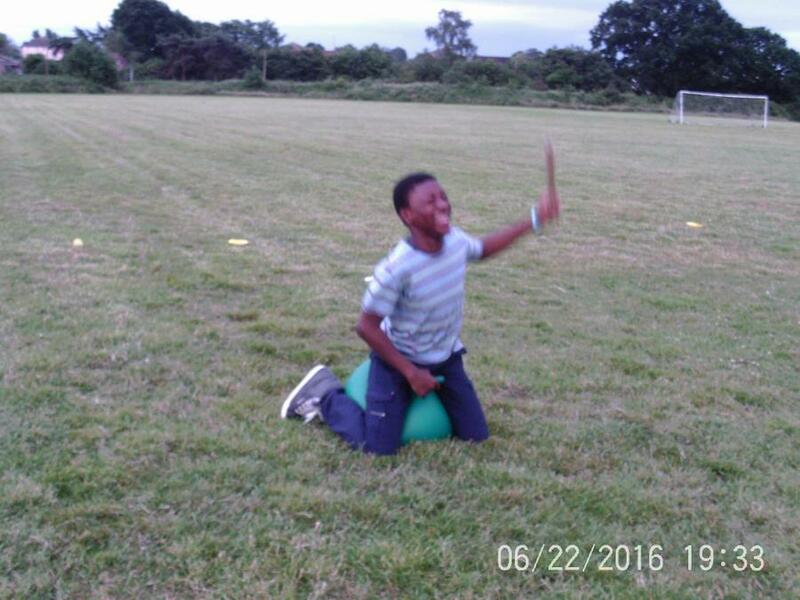 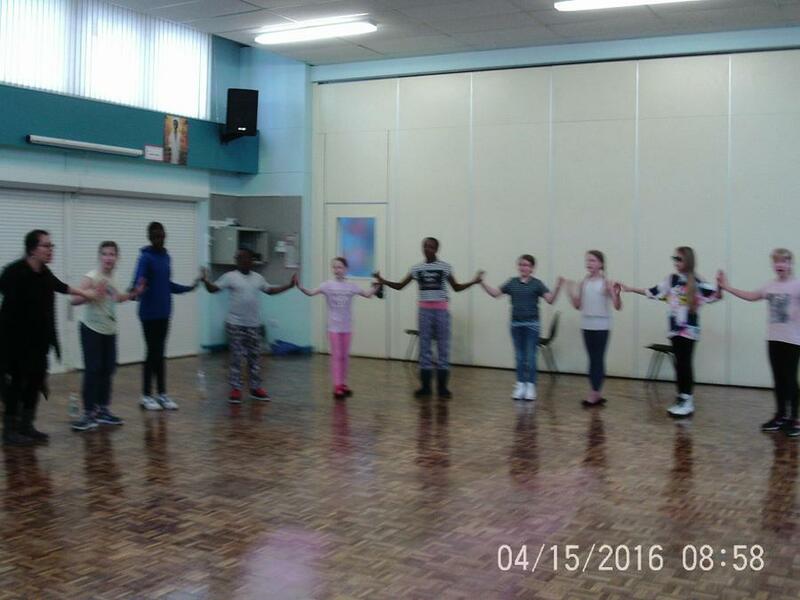 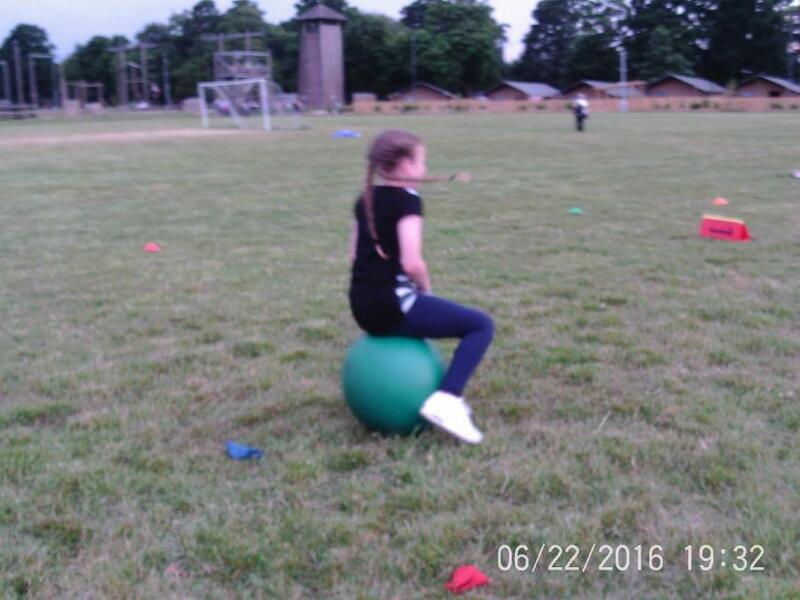 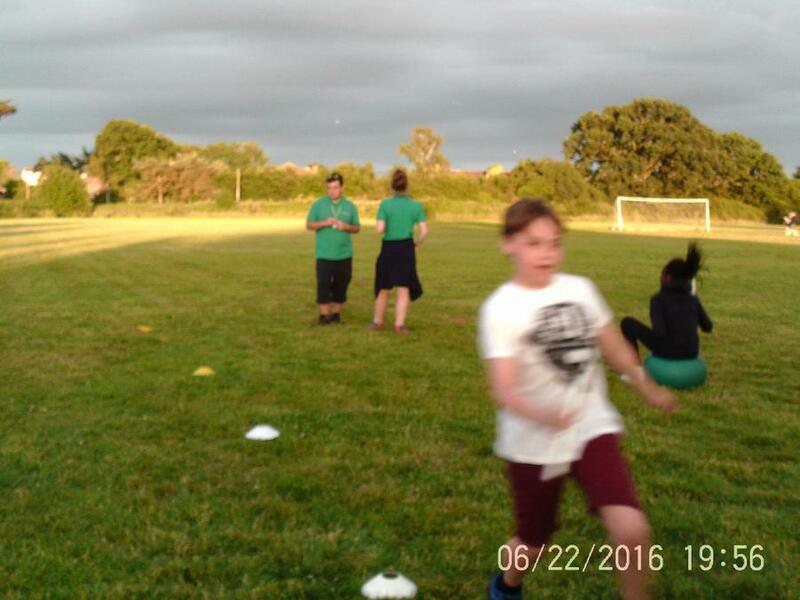 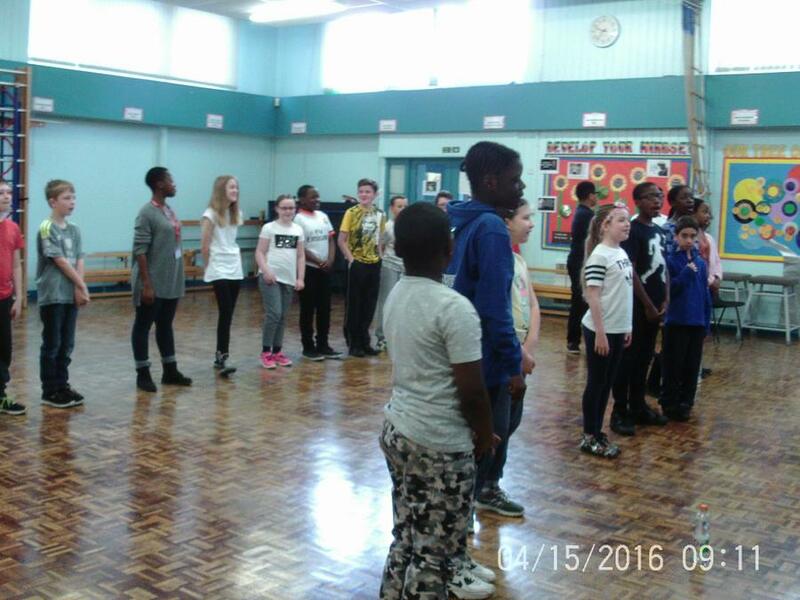 Our day was very different as we took part in different activities. 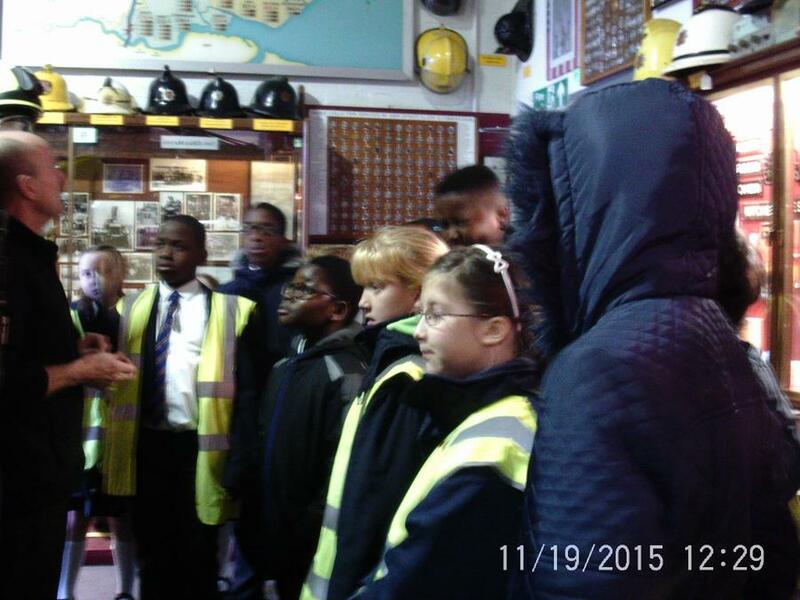 We learnt a lot about the Queen's life and dedication to the Country. 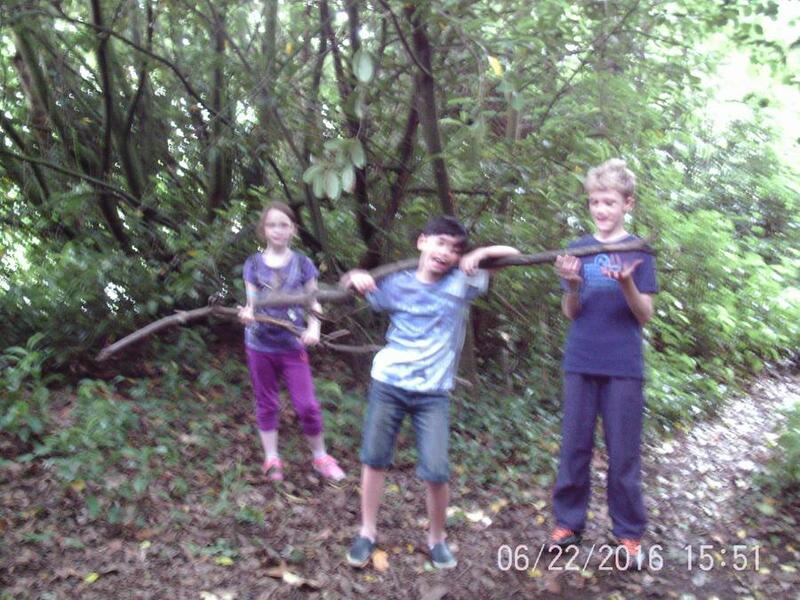 We finished portraits and planned a birthday. 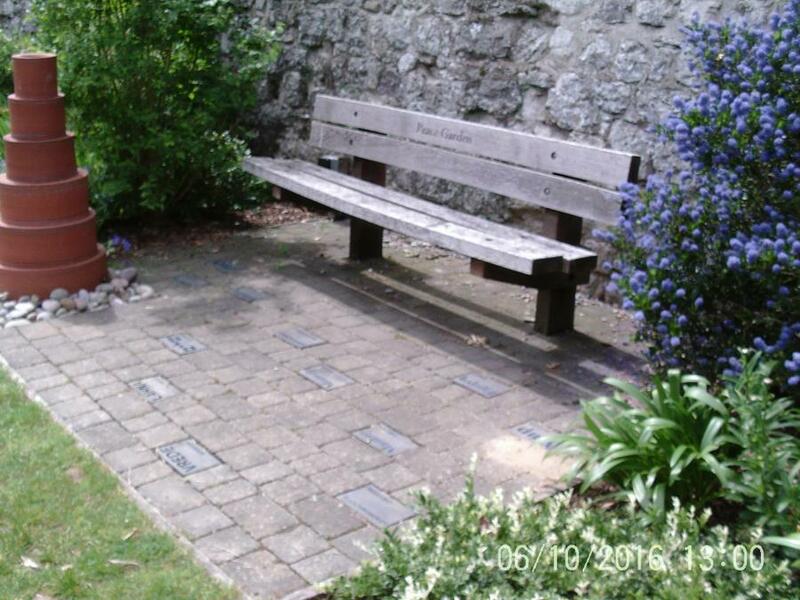 The interviews between the Queen and David Cameron were quite amusing. 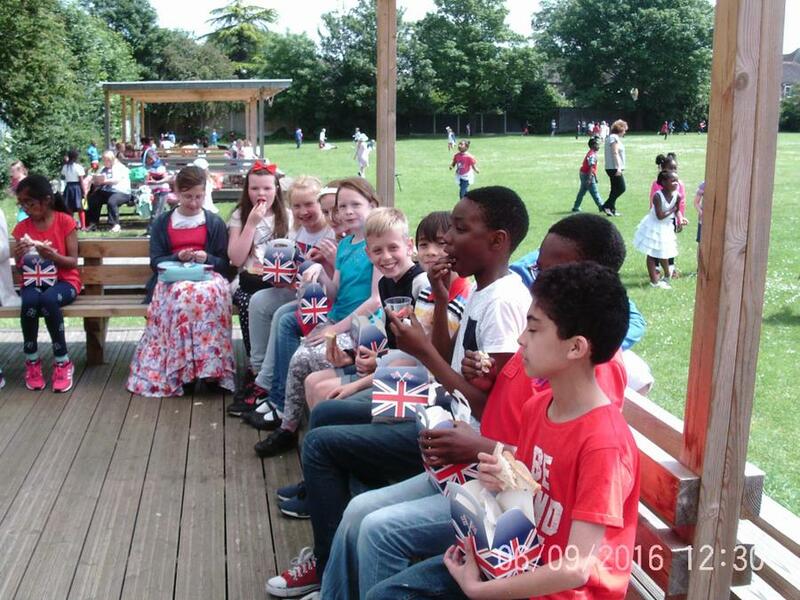 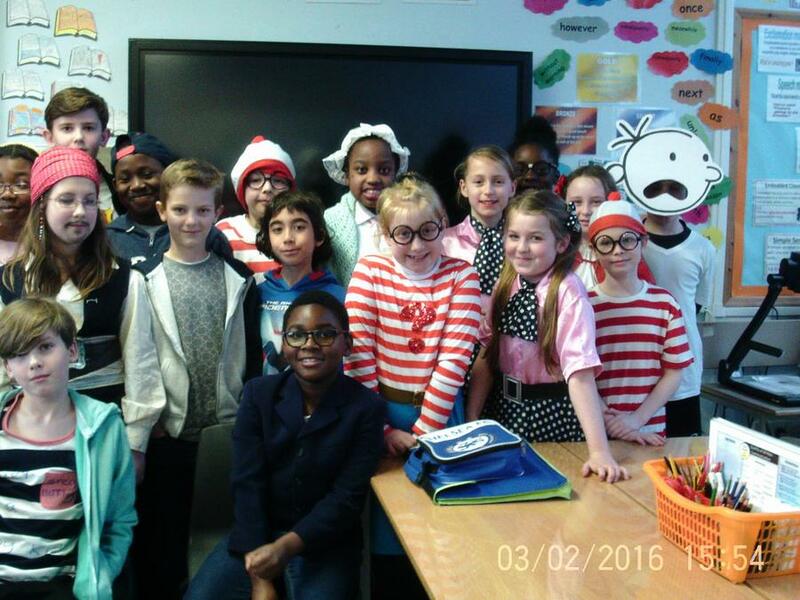 Year 6 enjoyed the party, congratulations Your Majesty! 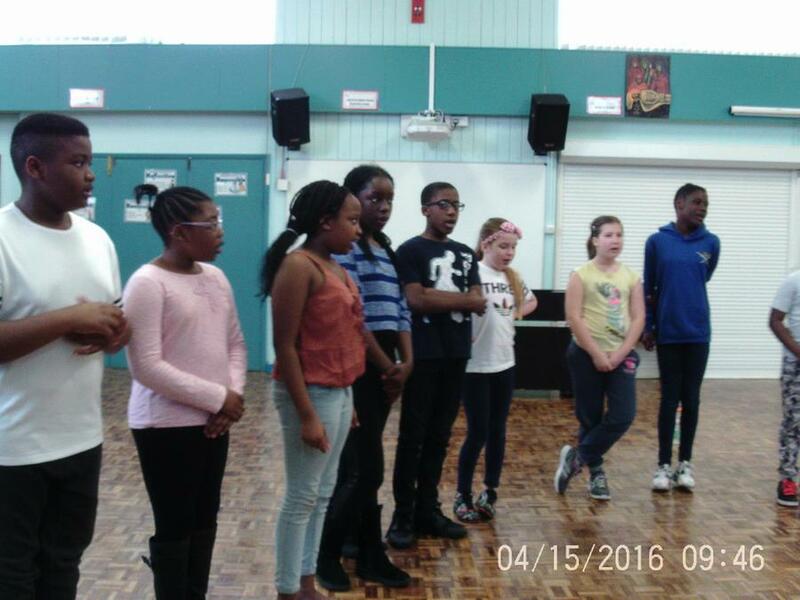 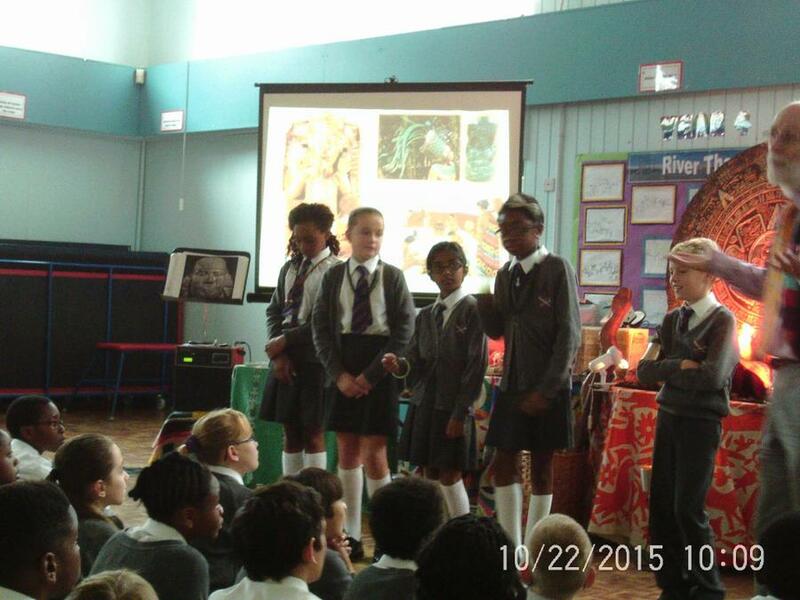 Maya and Zola helped us use our voices in different ways. 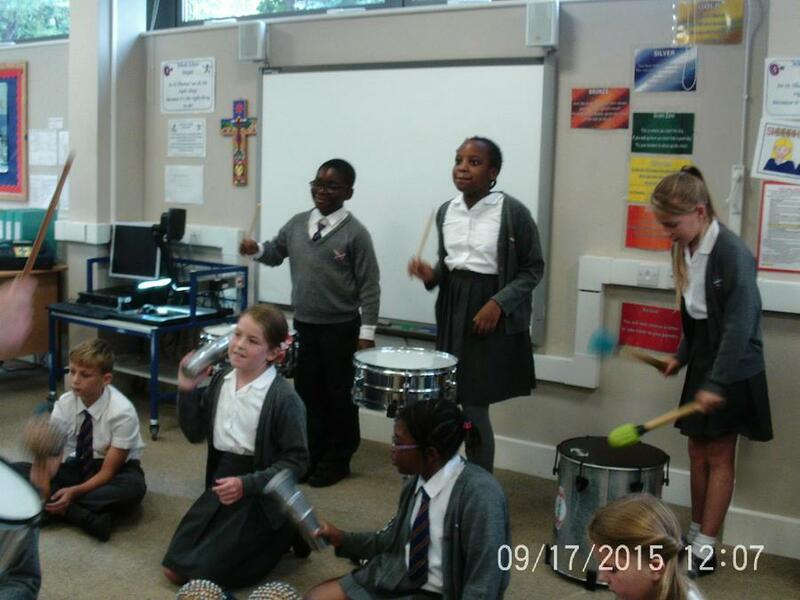 We worked on singing in rounds and making different sounds. 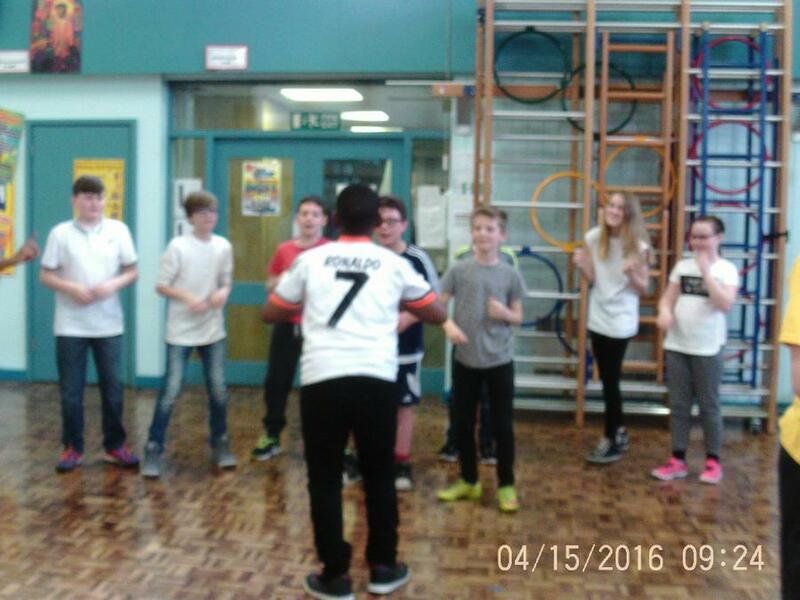 It was great fun learning the actions. 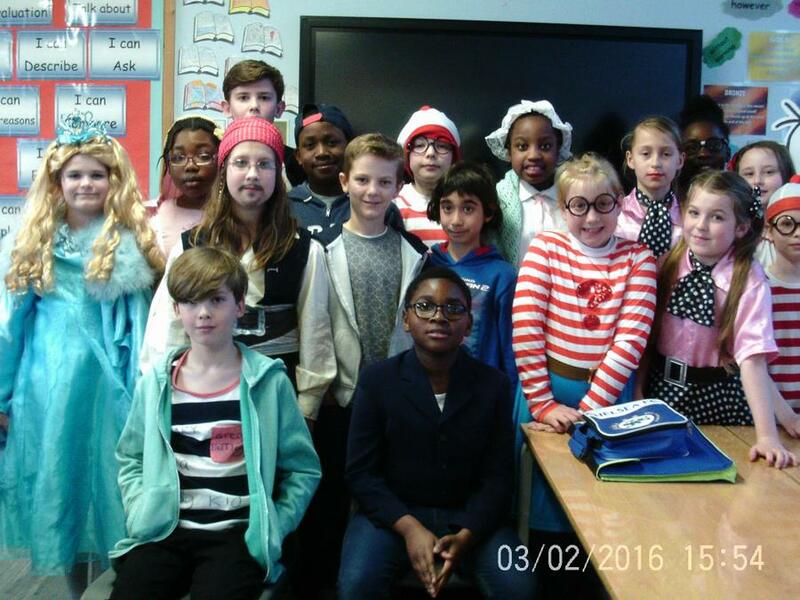 We enjoyed dressing up and working out who our friends were dressed as. 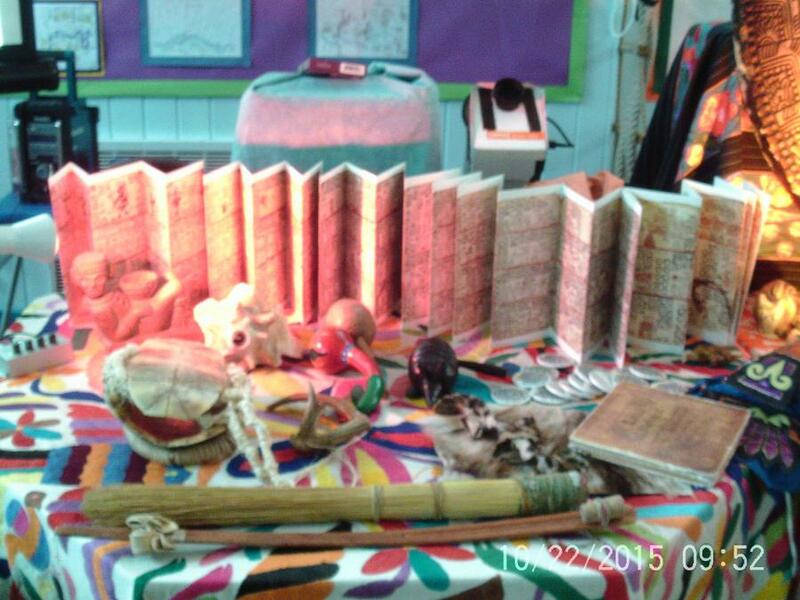 During the day we had some quizzes and designed our own books. 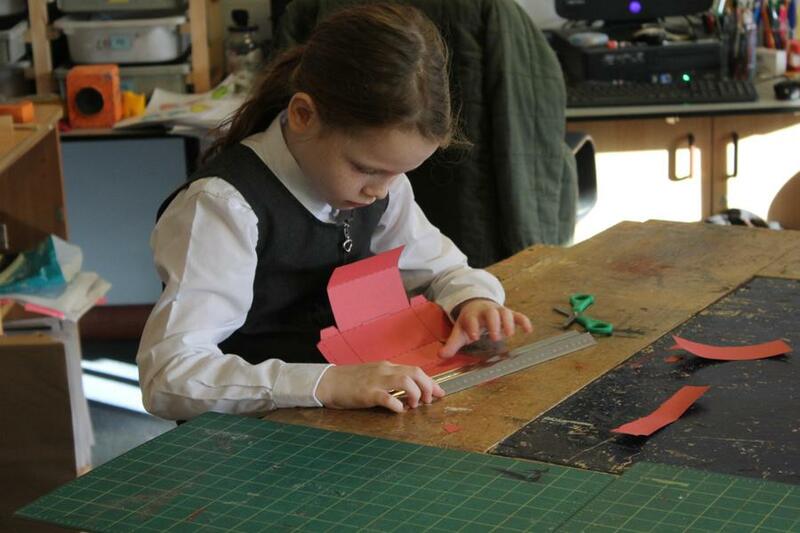 We enjoy reading and are in the process of creating some of our favourite books for display. 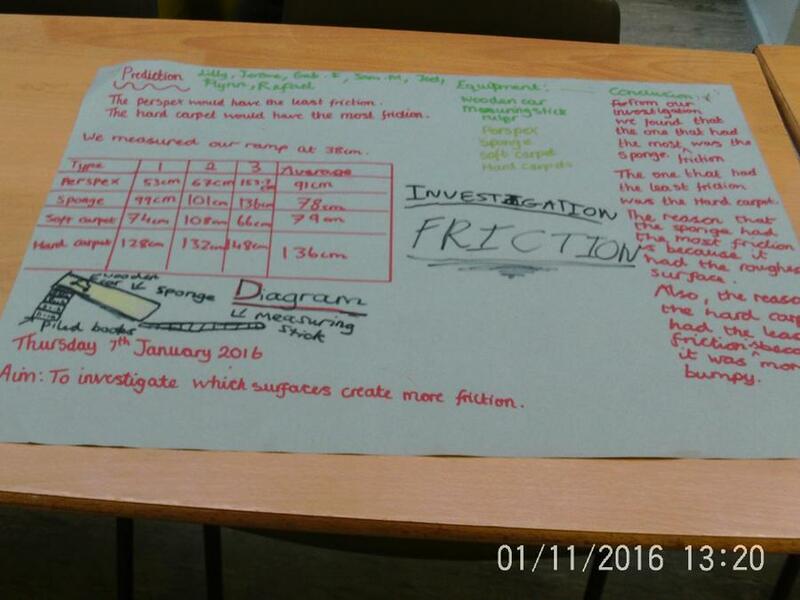 Science- 6C Friction investigation. 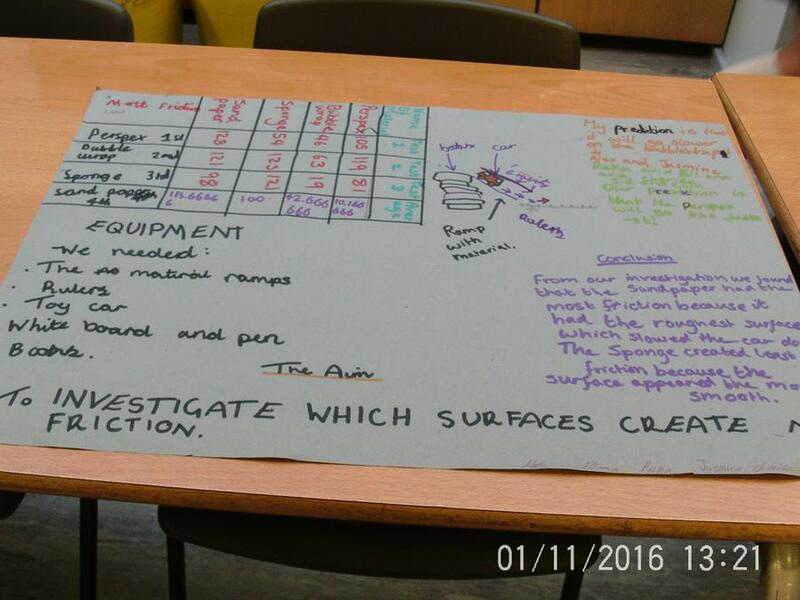 We conducted an investigation into which surfaces create more friction. 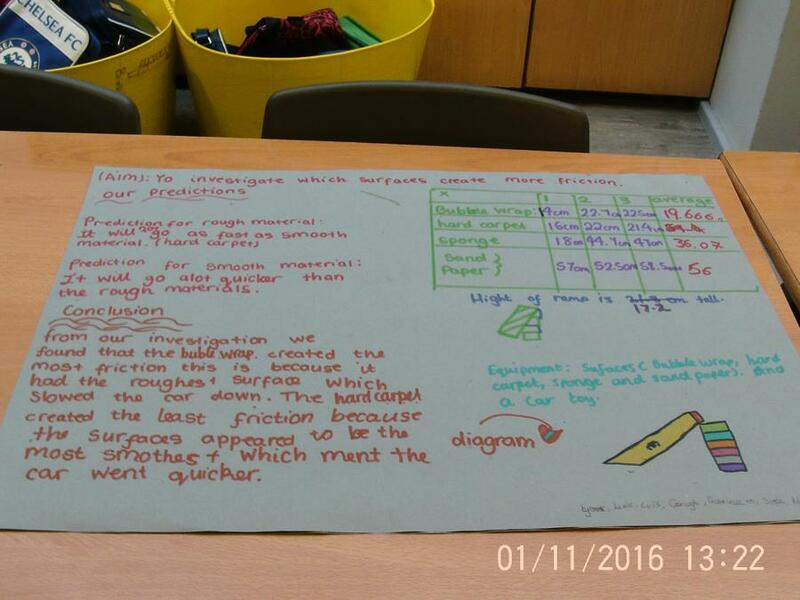 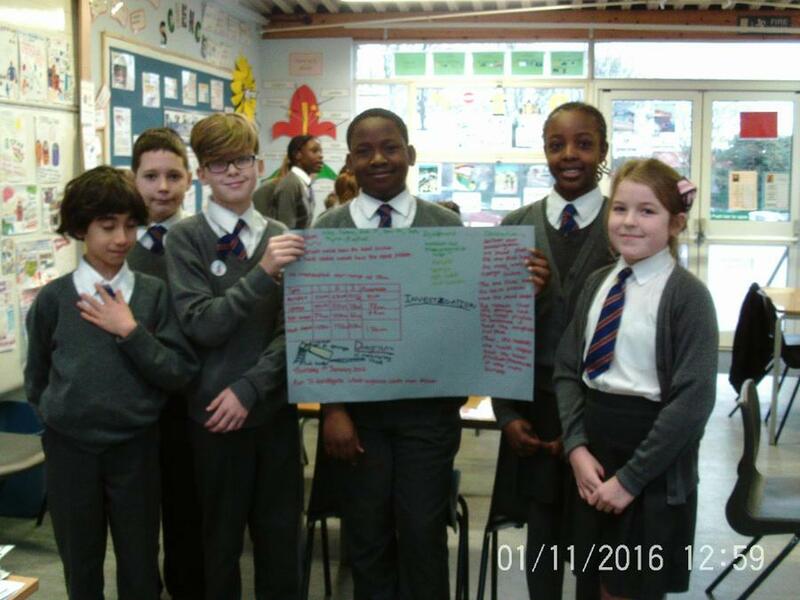 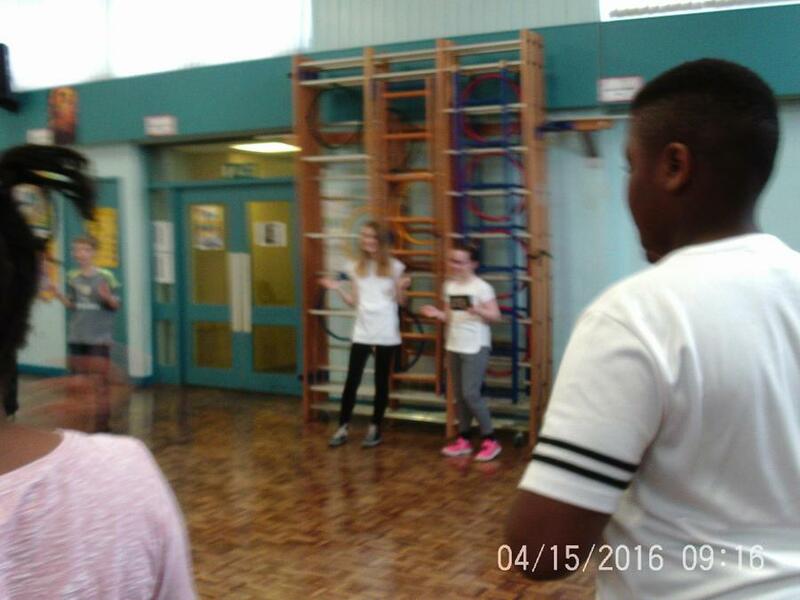 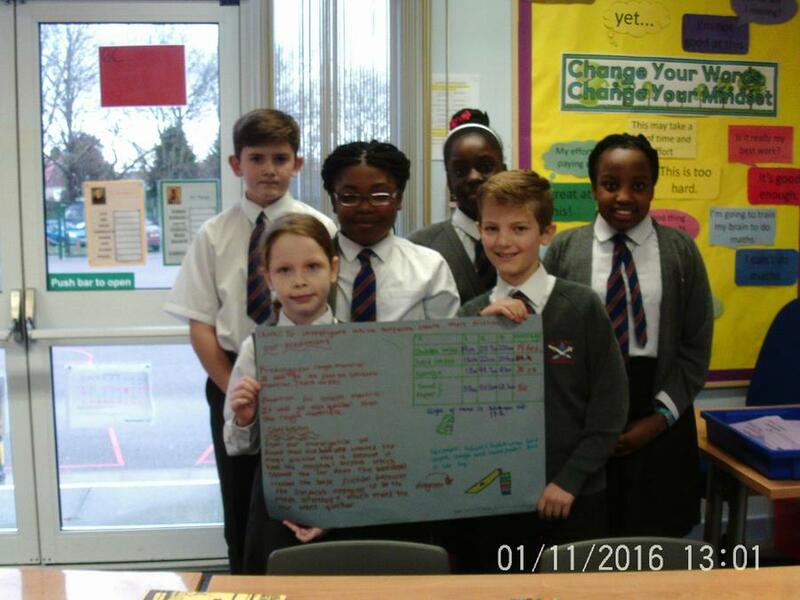 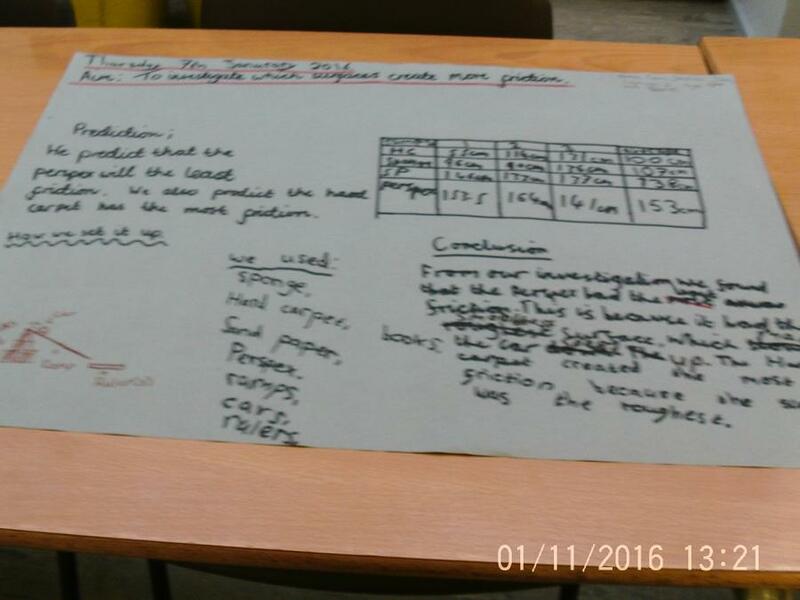 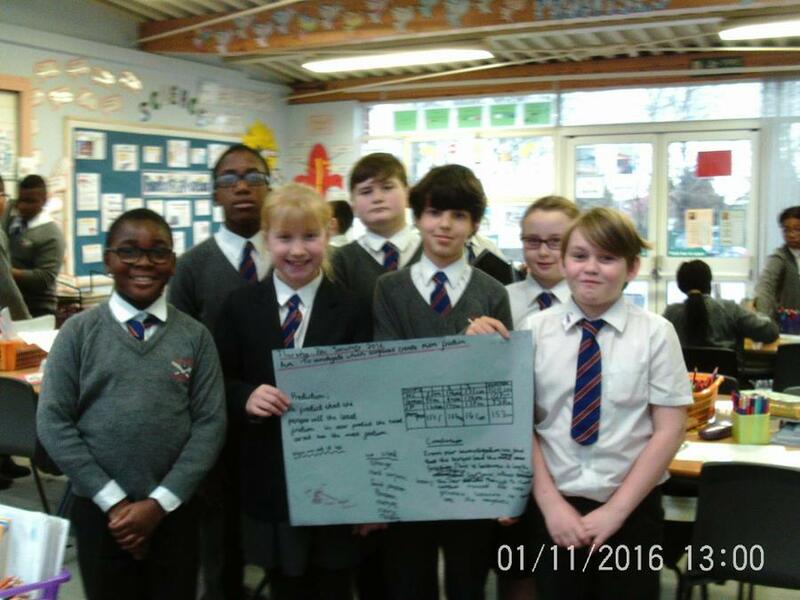 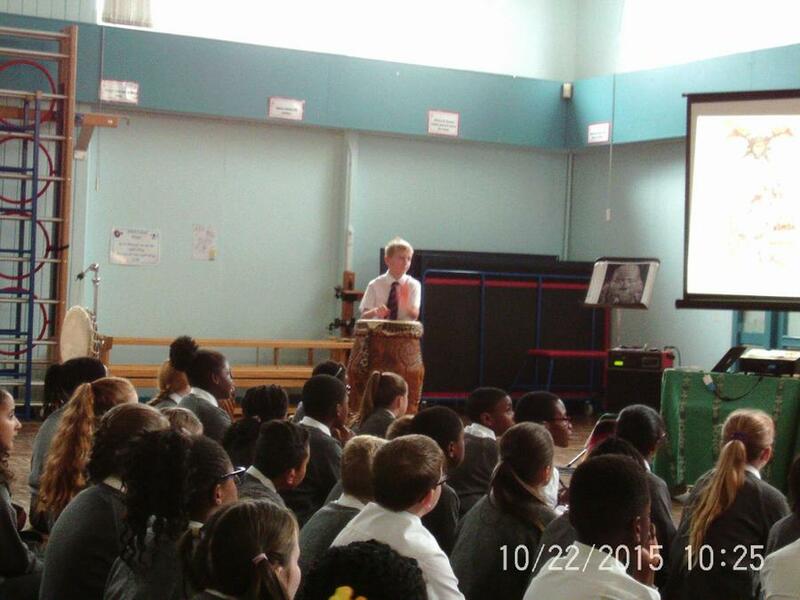 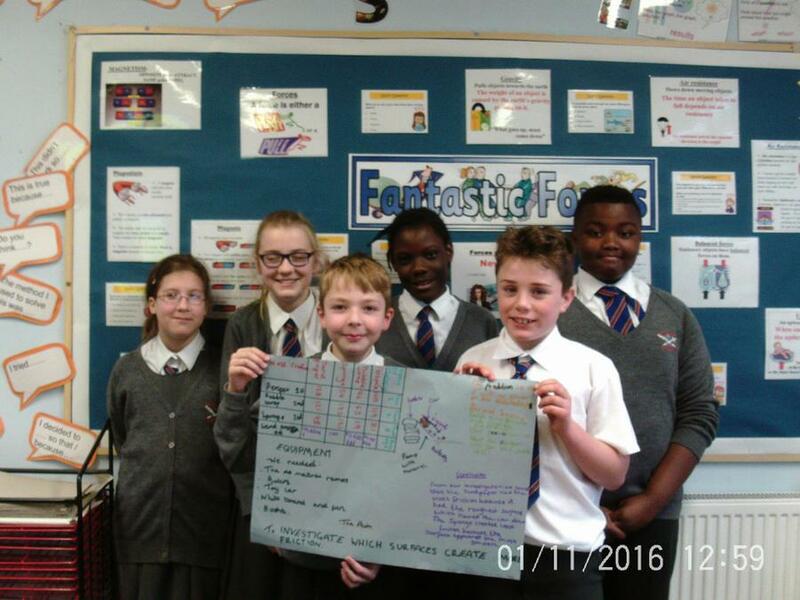 We then recorded our method and the results on a large poster and presented to the class. 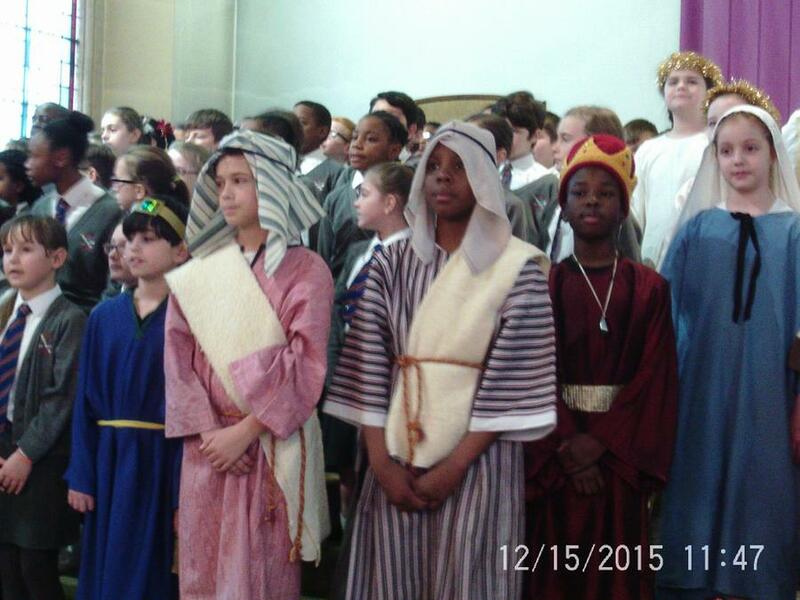 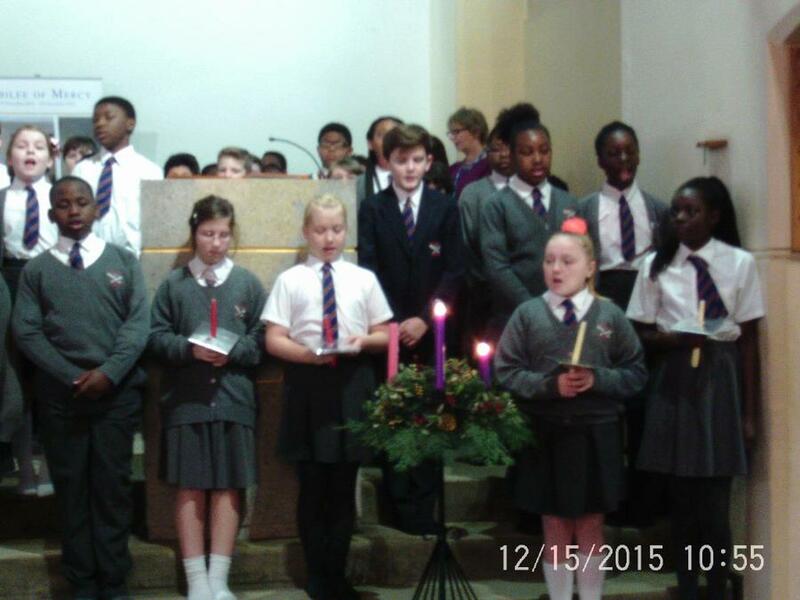 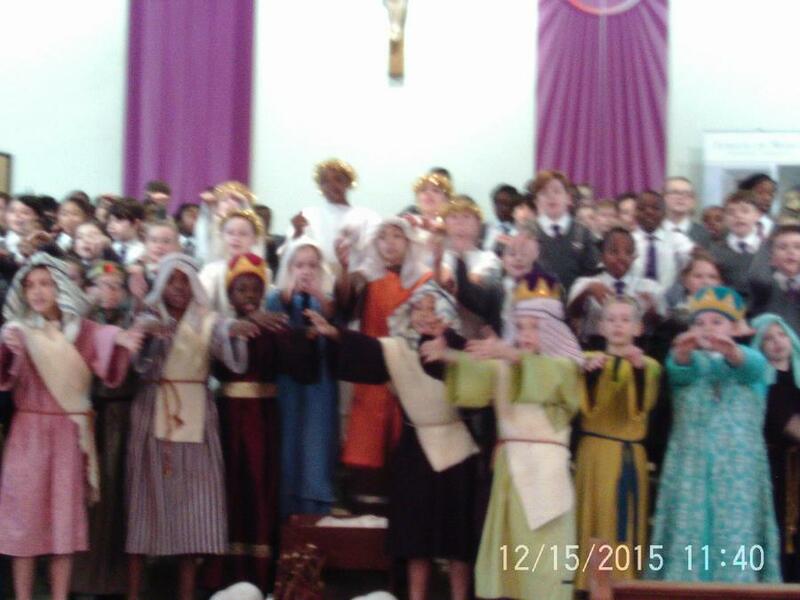 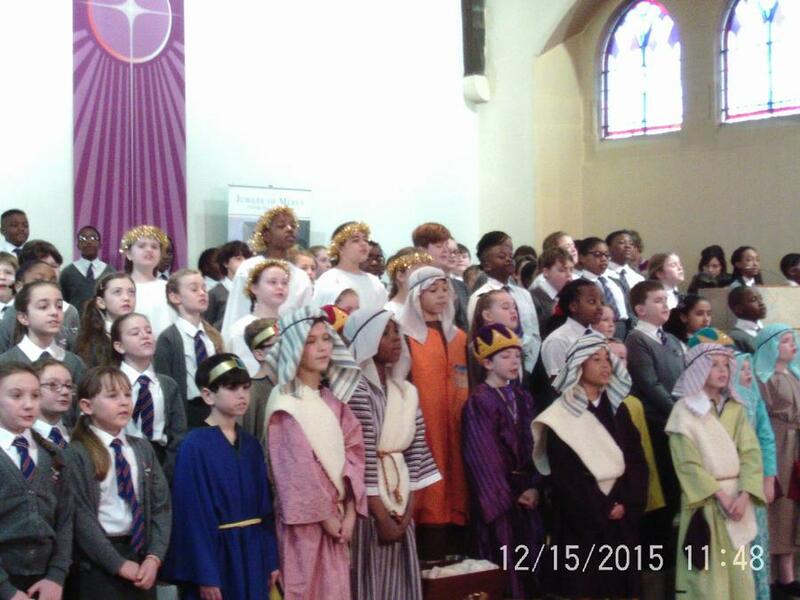 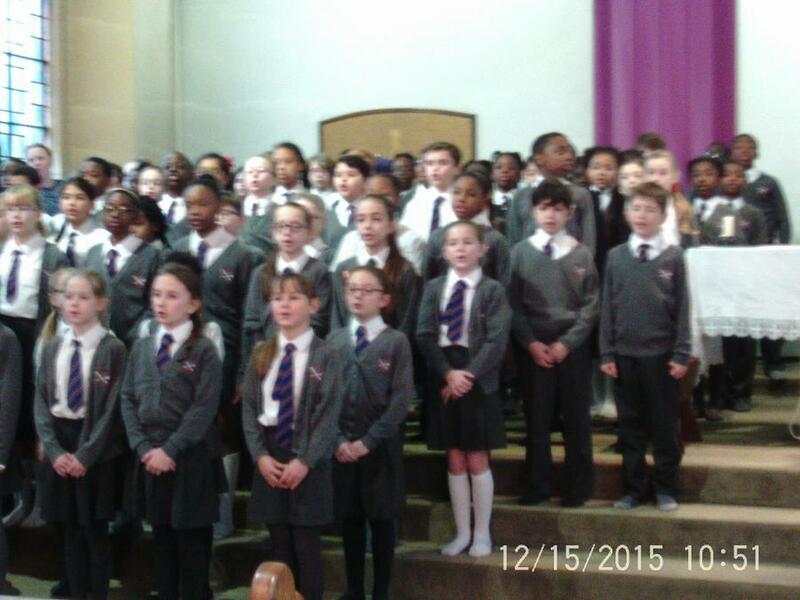 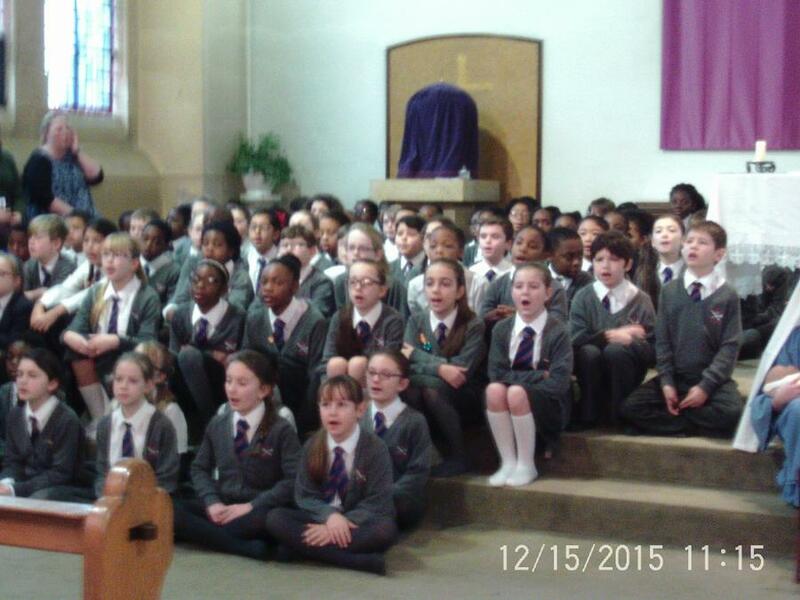 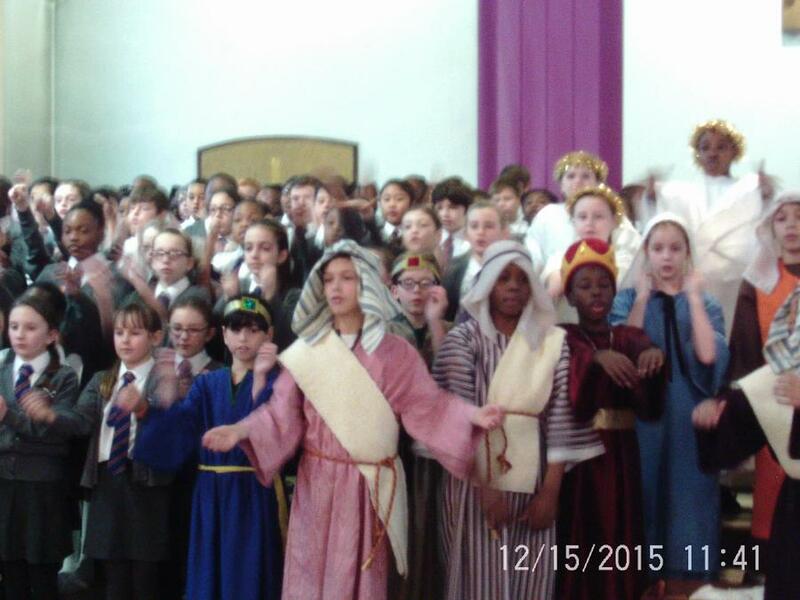 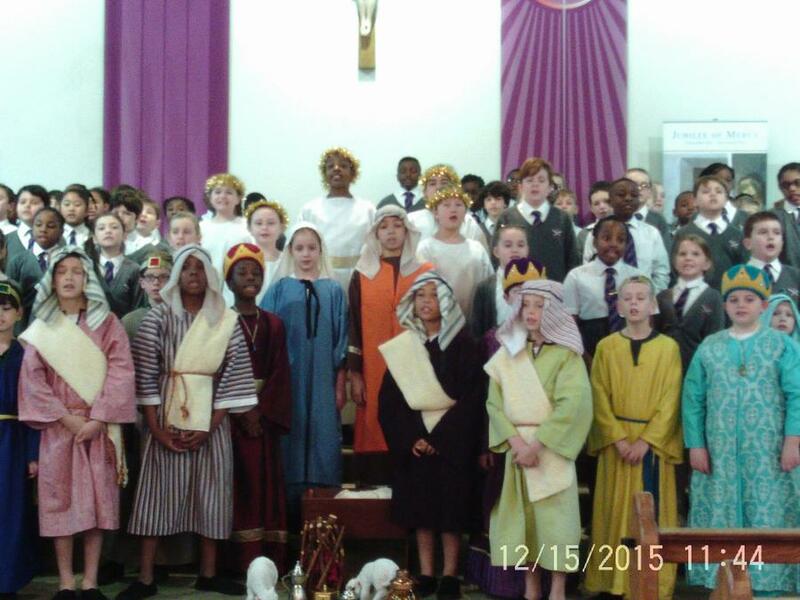 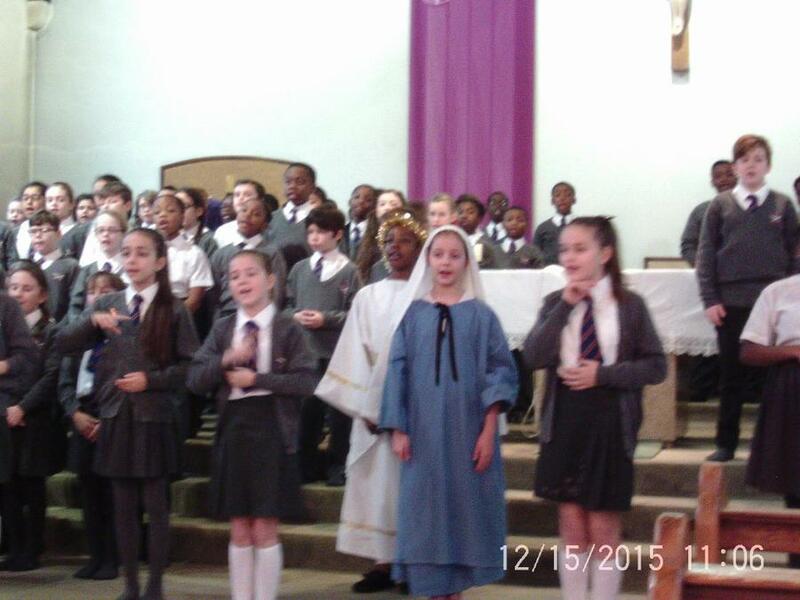 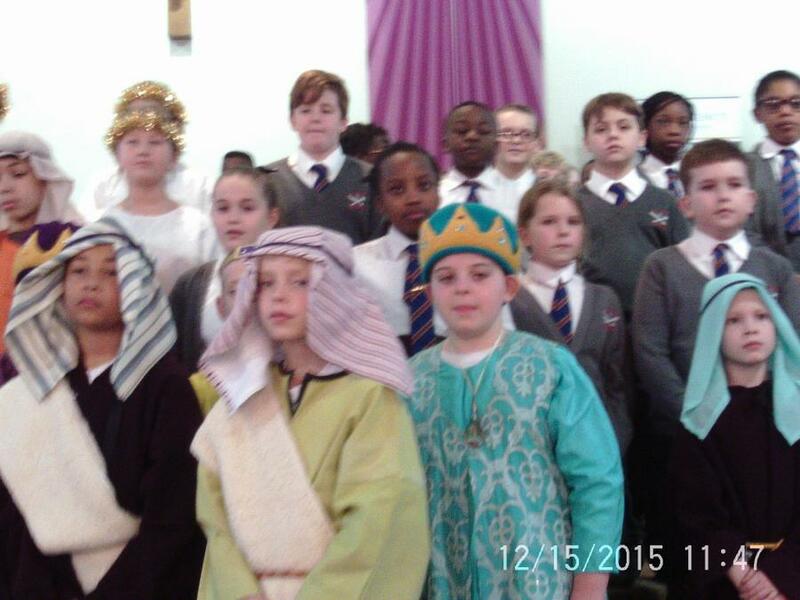 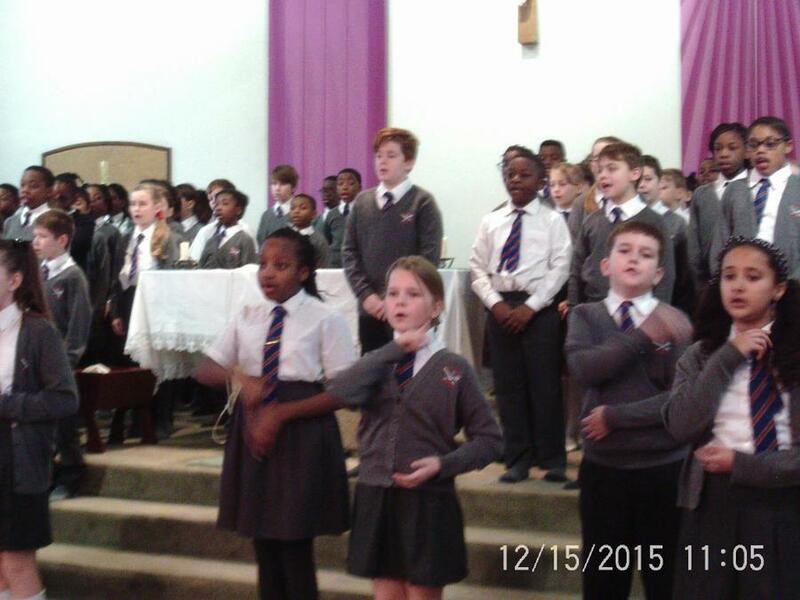 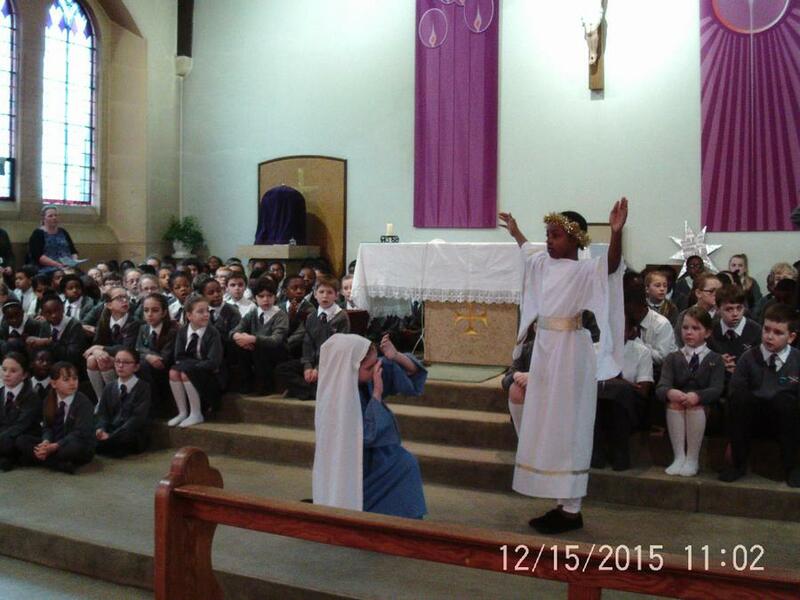 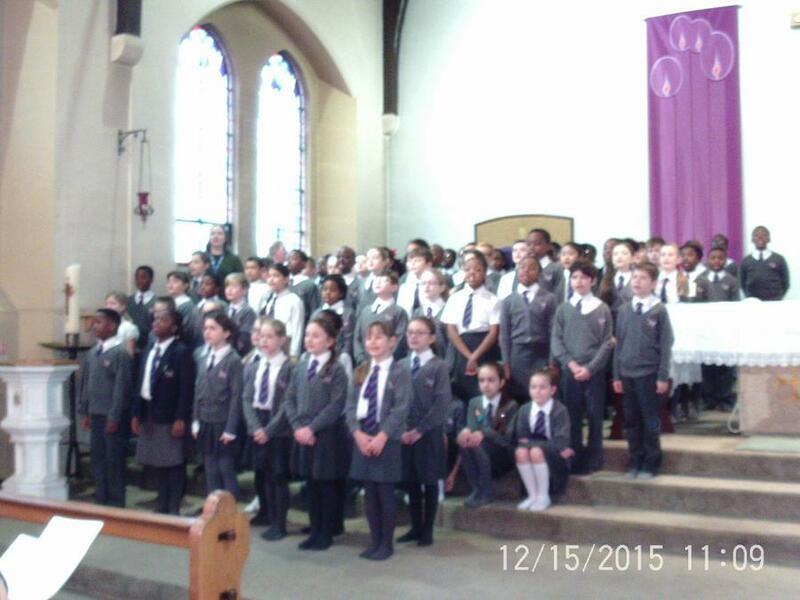 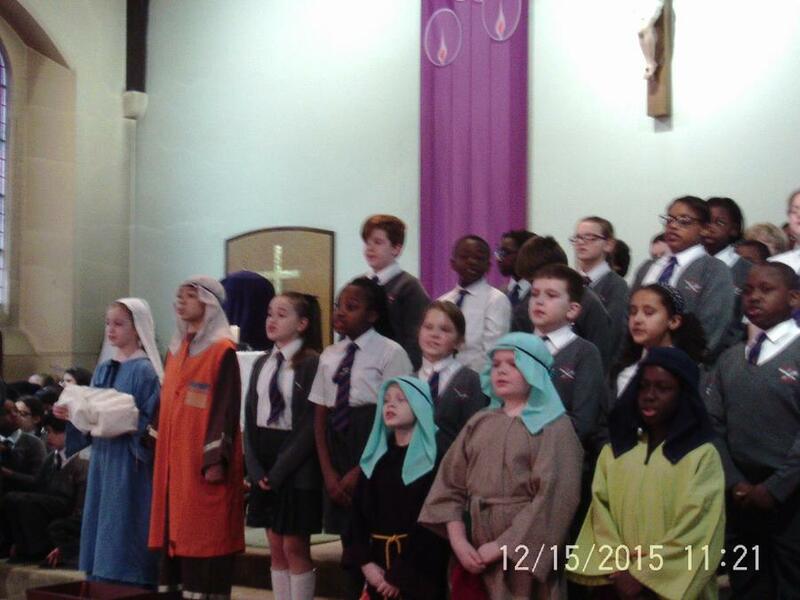 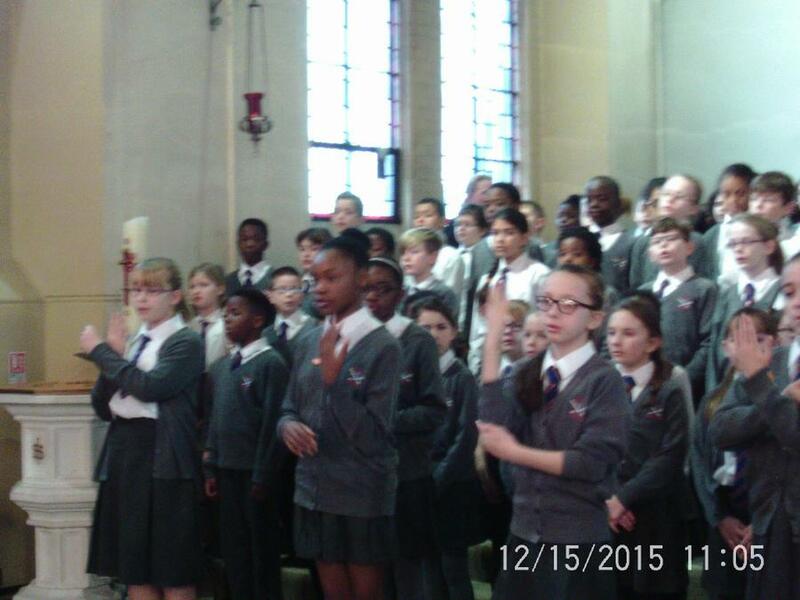 Year 5 and 6 performed their Christmas Carol Concert at St Thomas' Church last night. 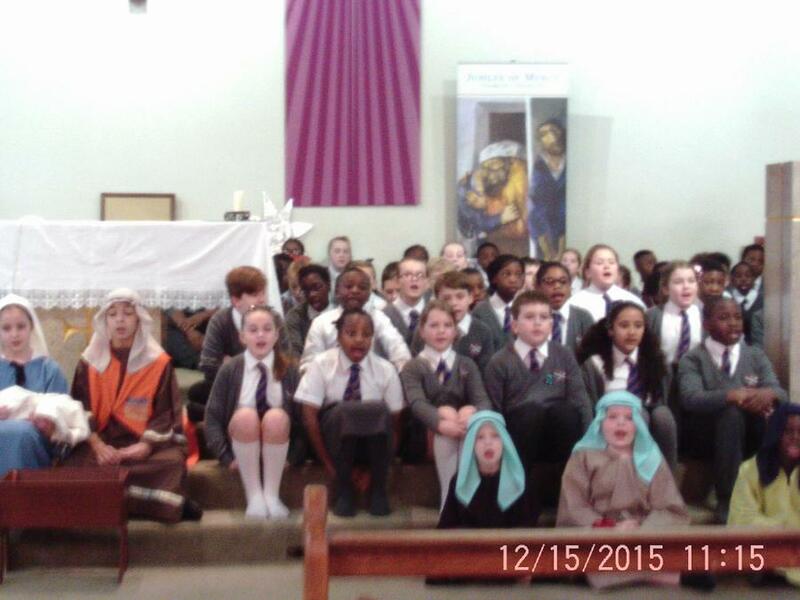 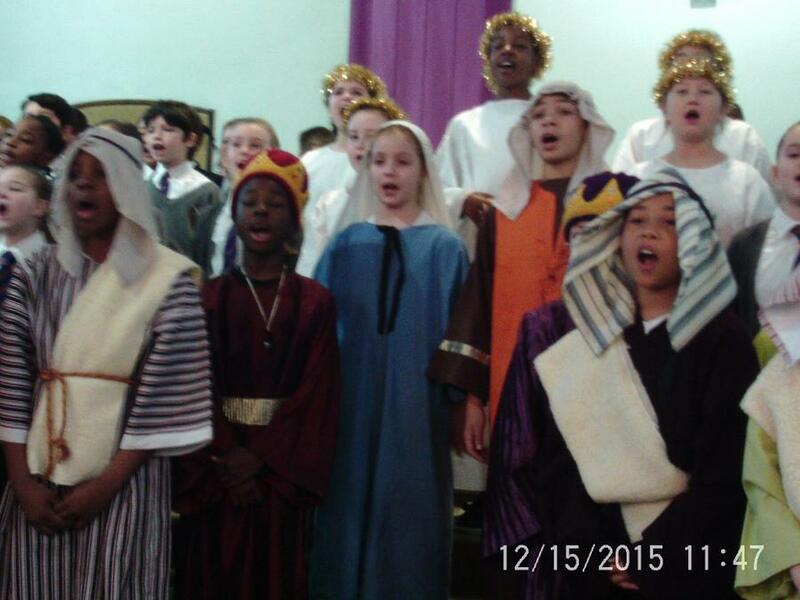 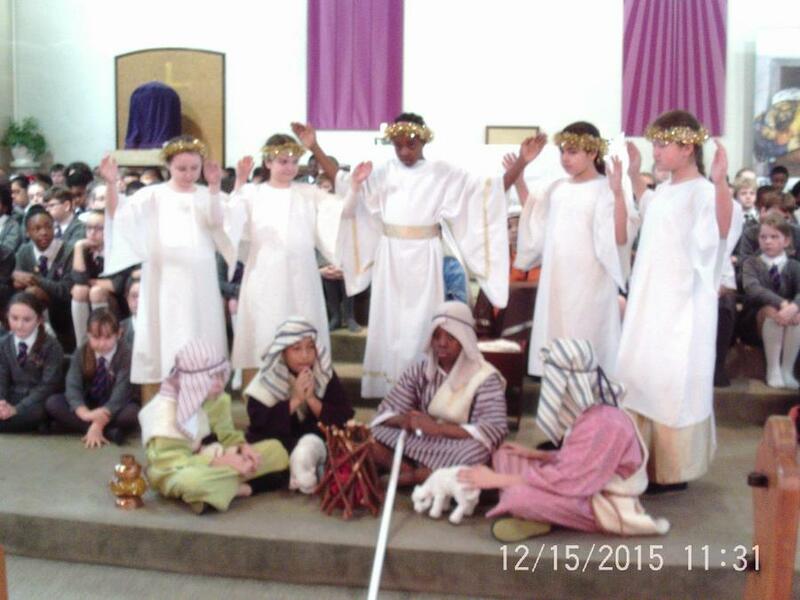 The singing, narrating, acting and signing were fantastic. 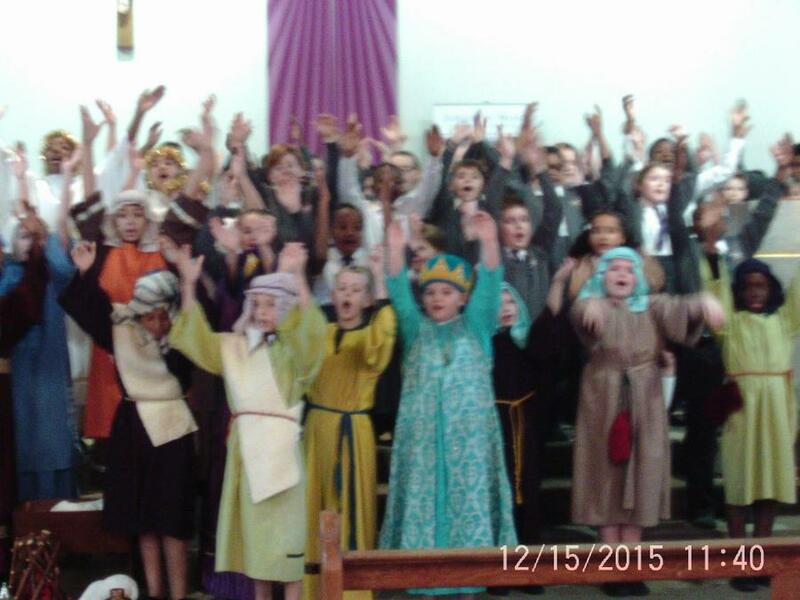 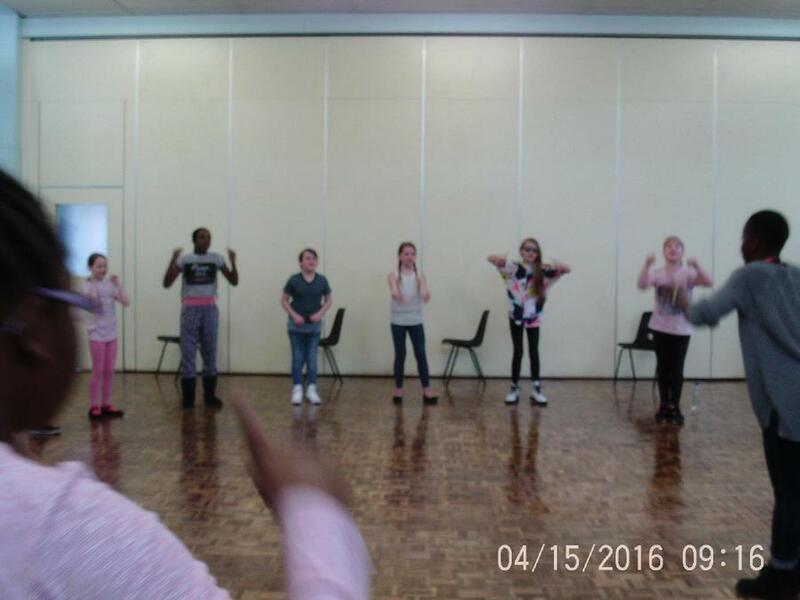 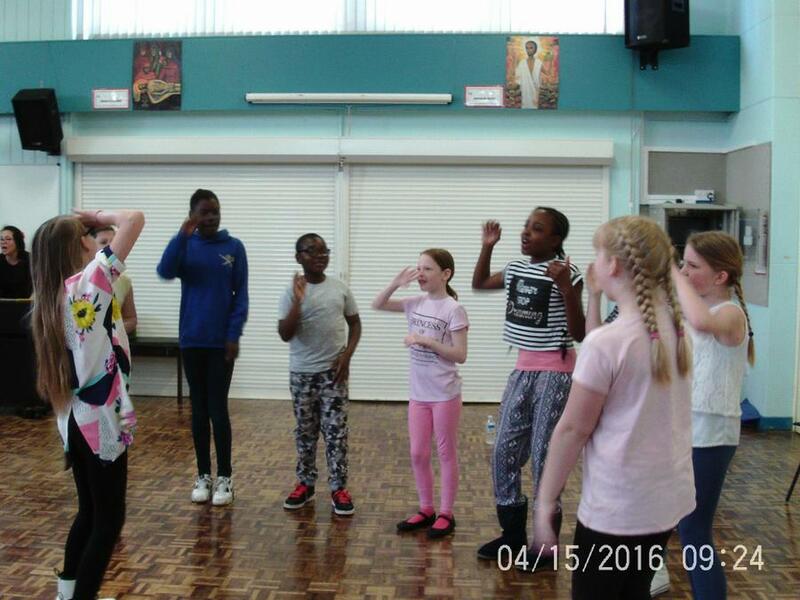 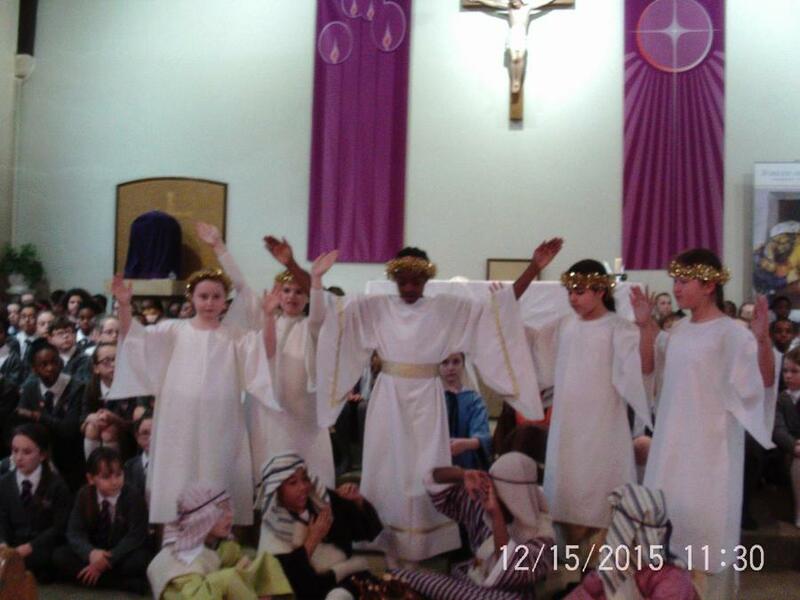 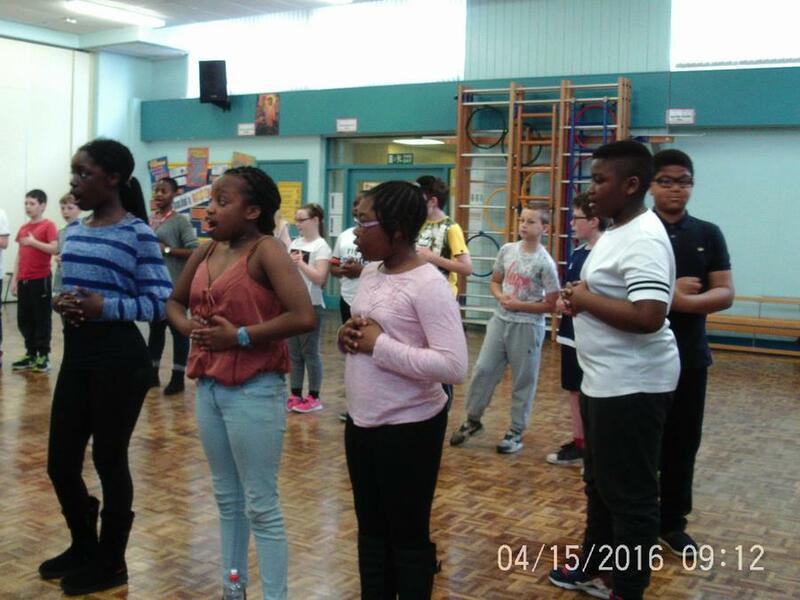 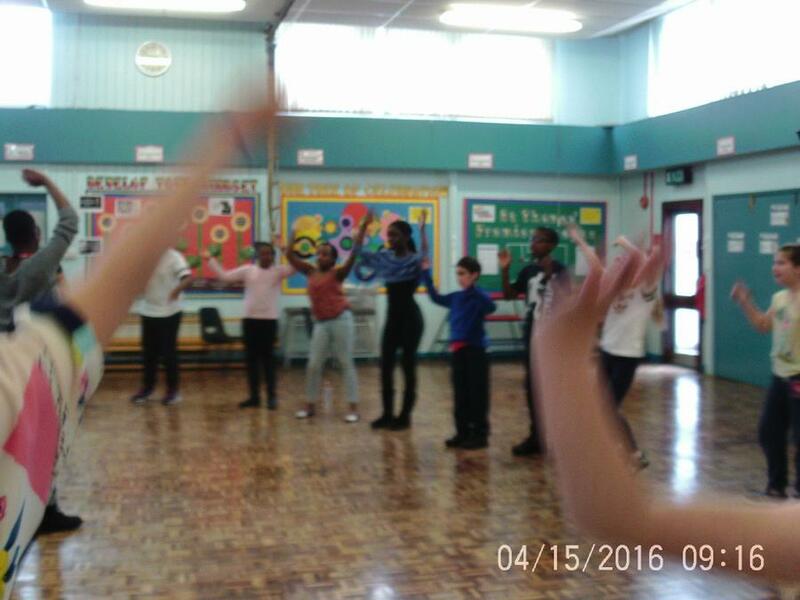 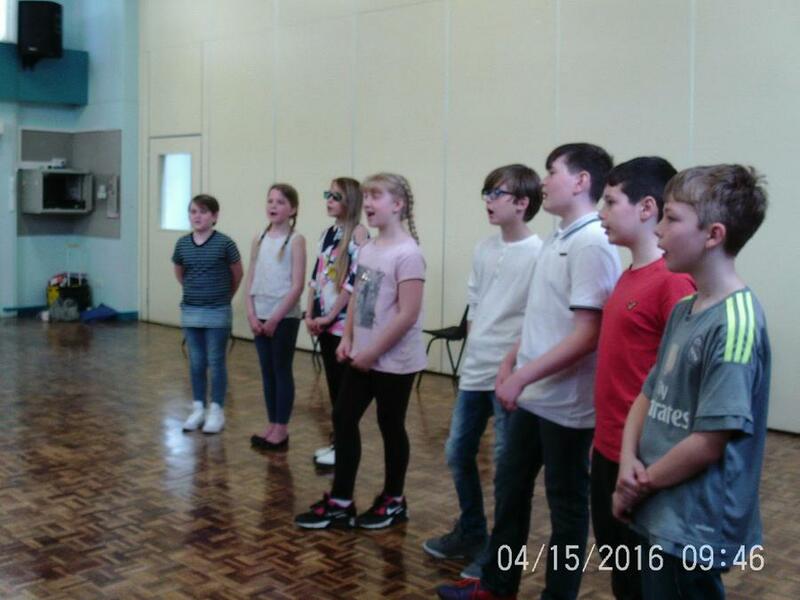 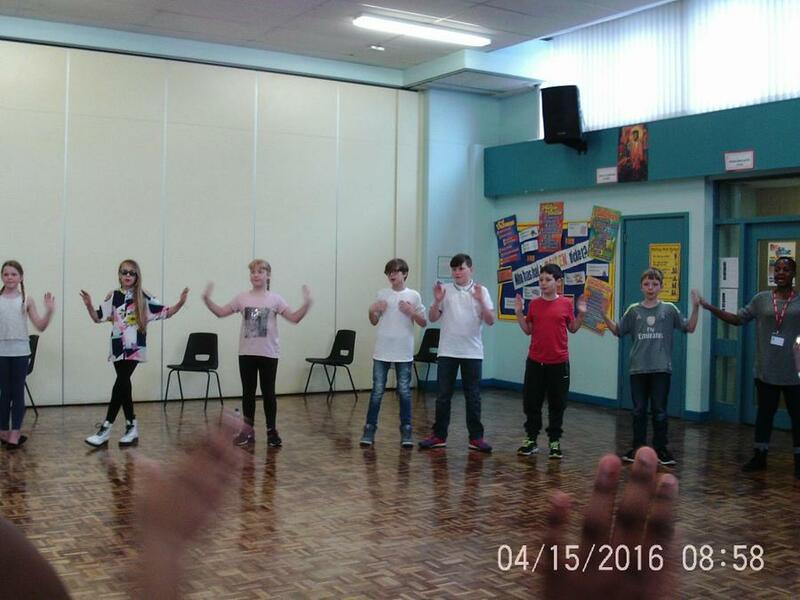 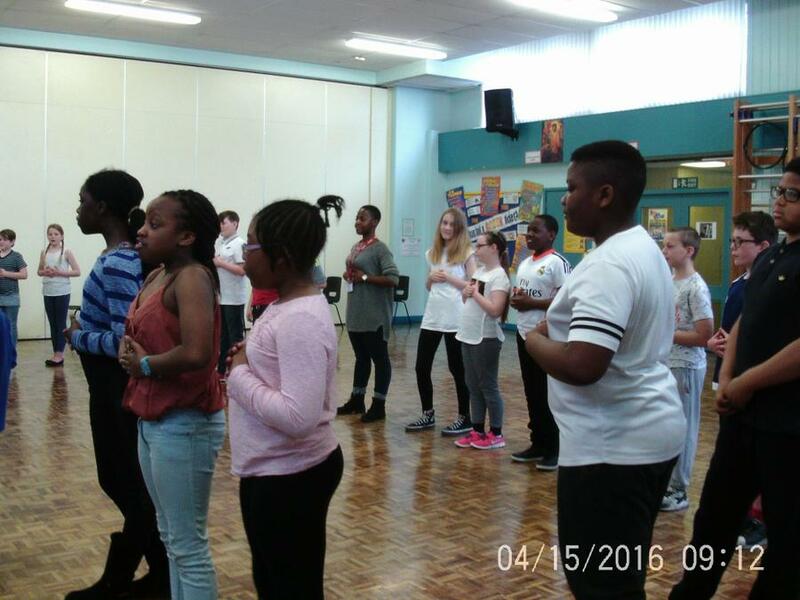 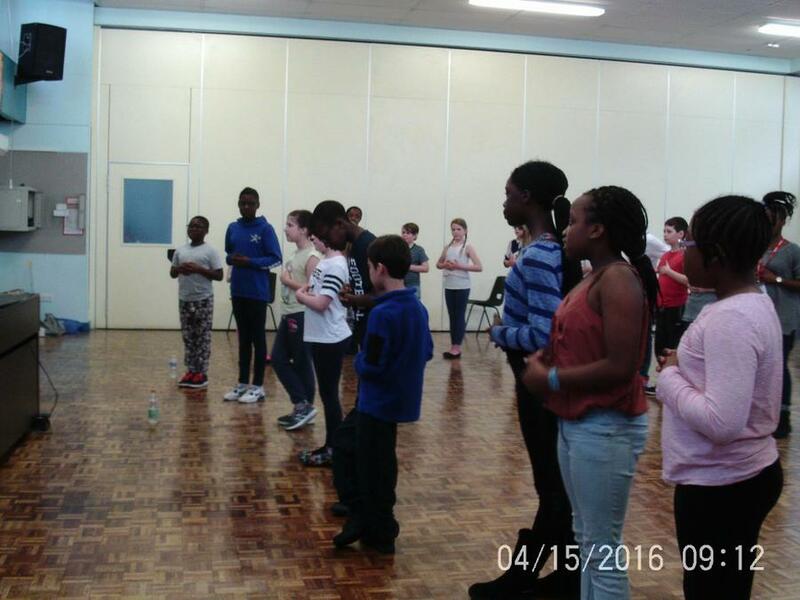 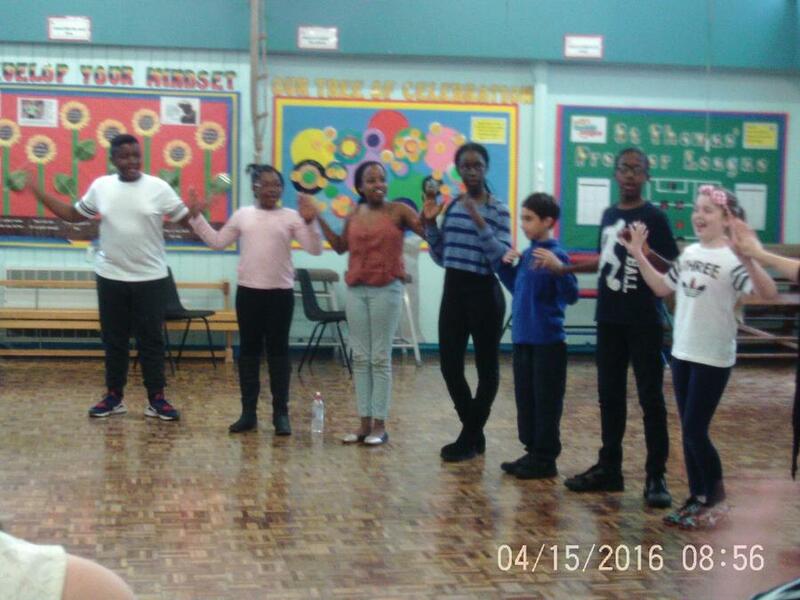 Everybody worked extremely hard to learn all the songs and Father Brian said that we, 'raised the roof!' 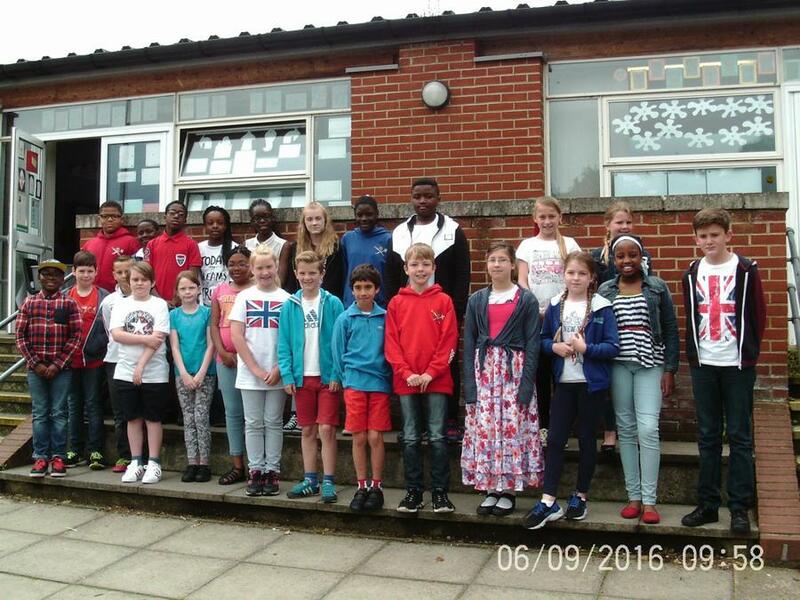 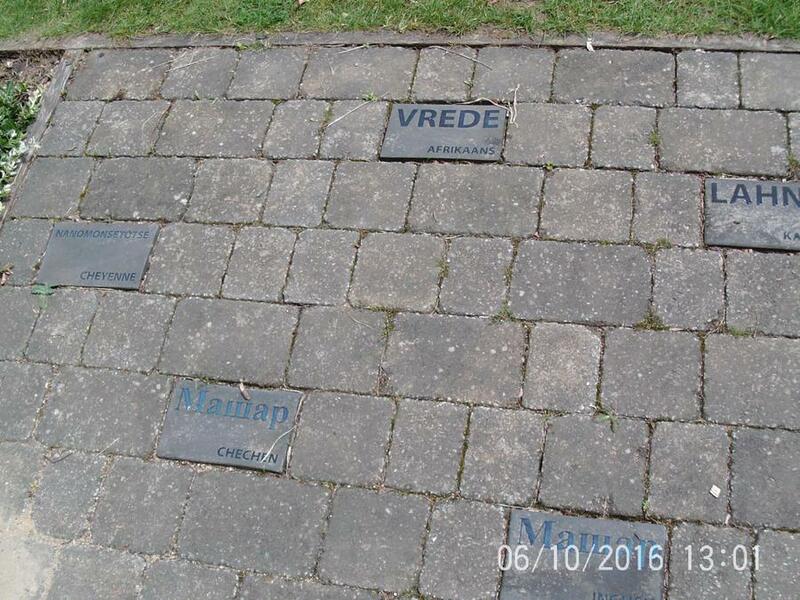 Well done everybody. 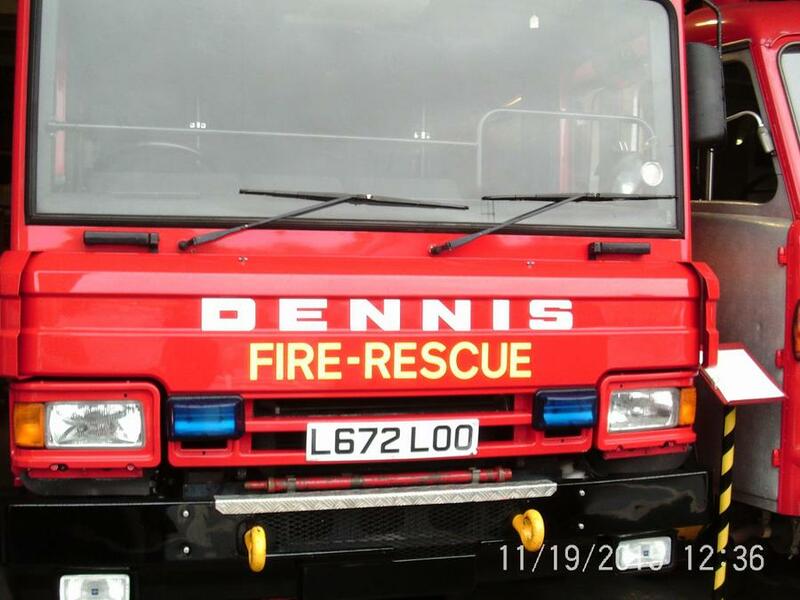 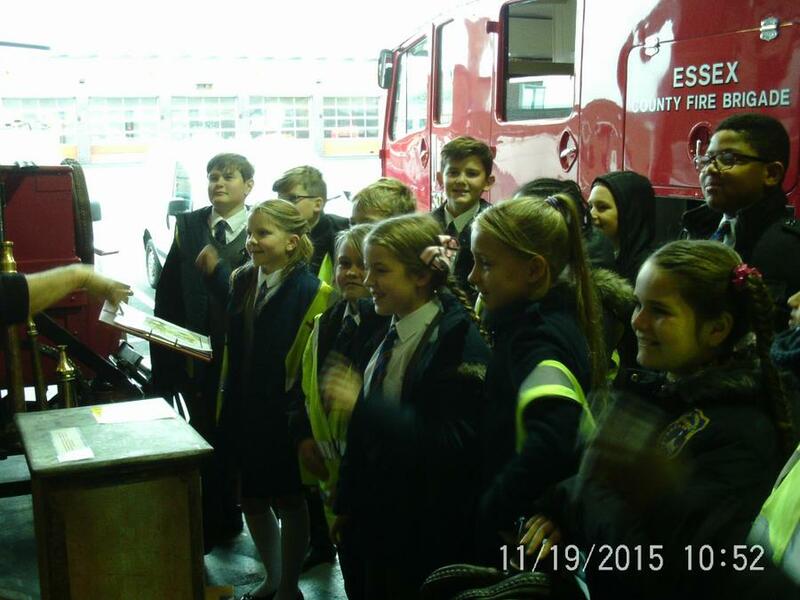 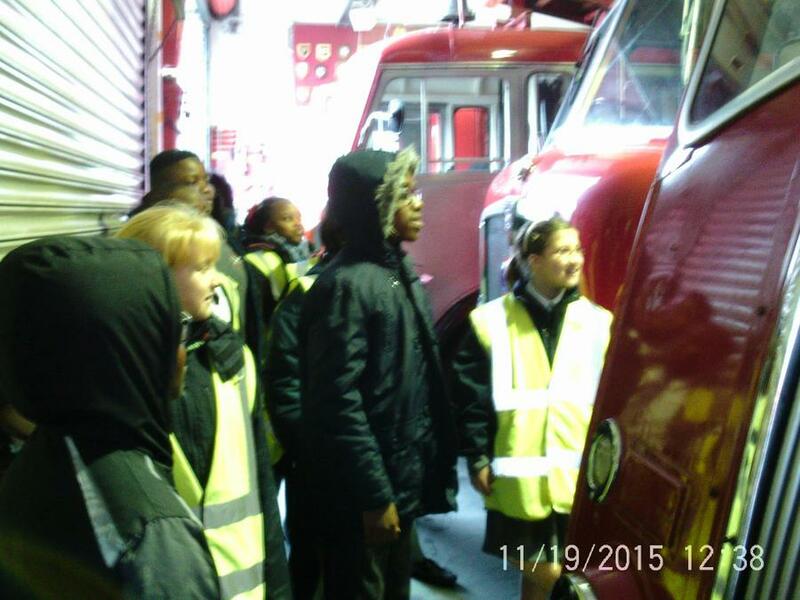 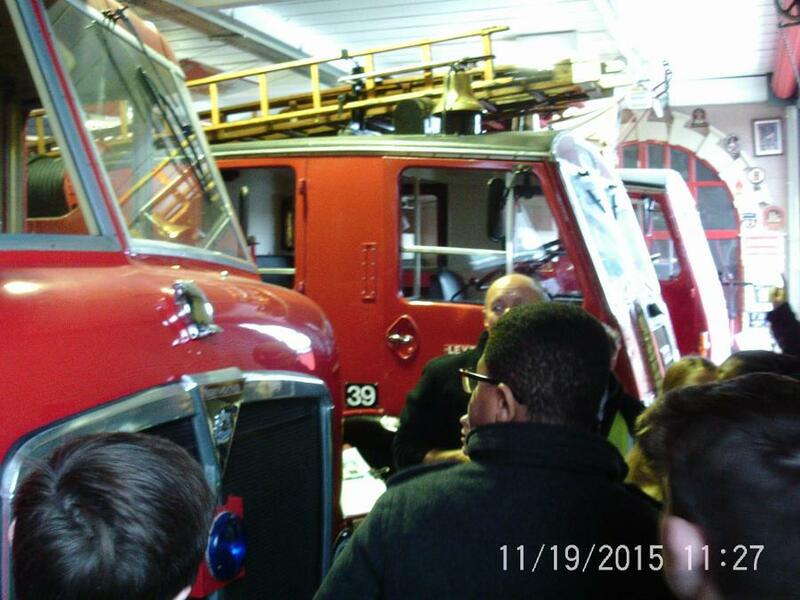 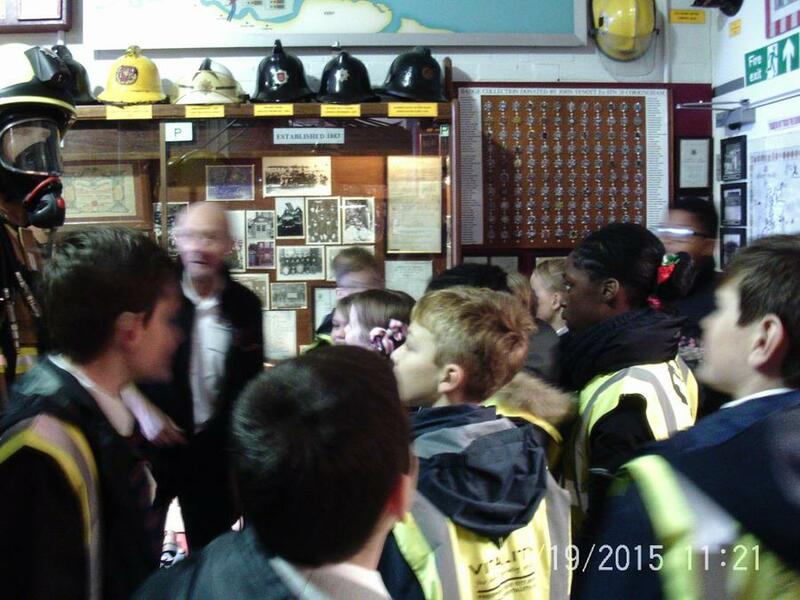 6C walked to the fire station this morning. 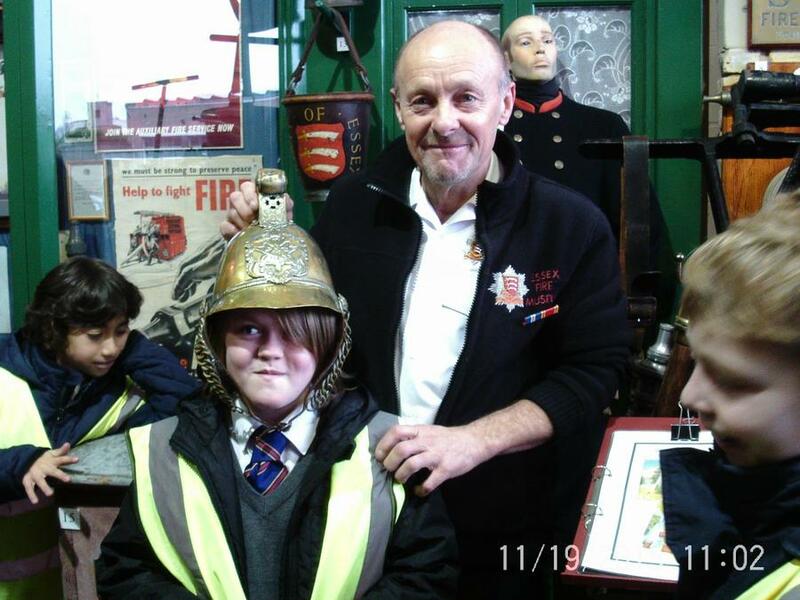 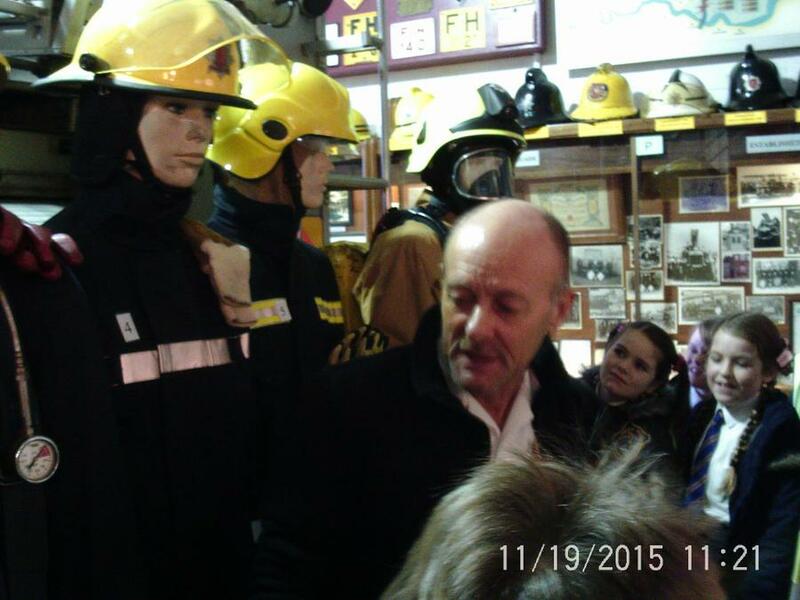 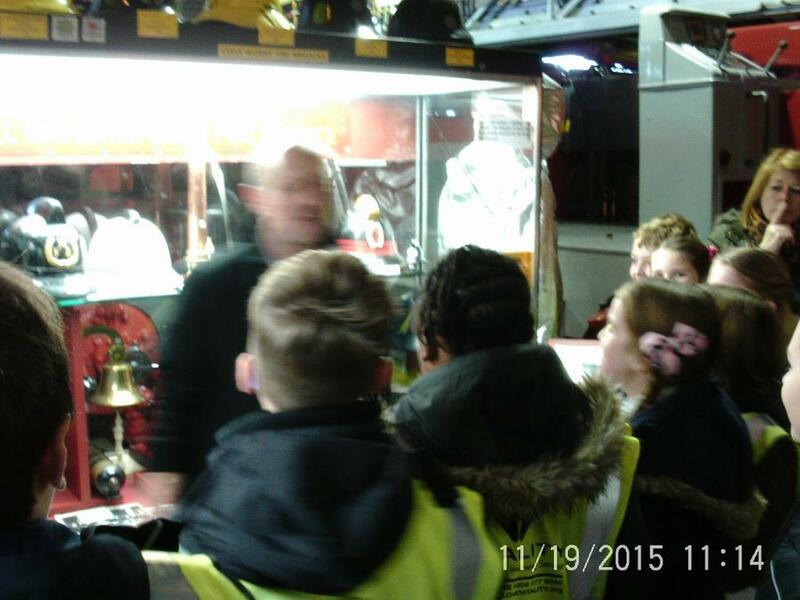 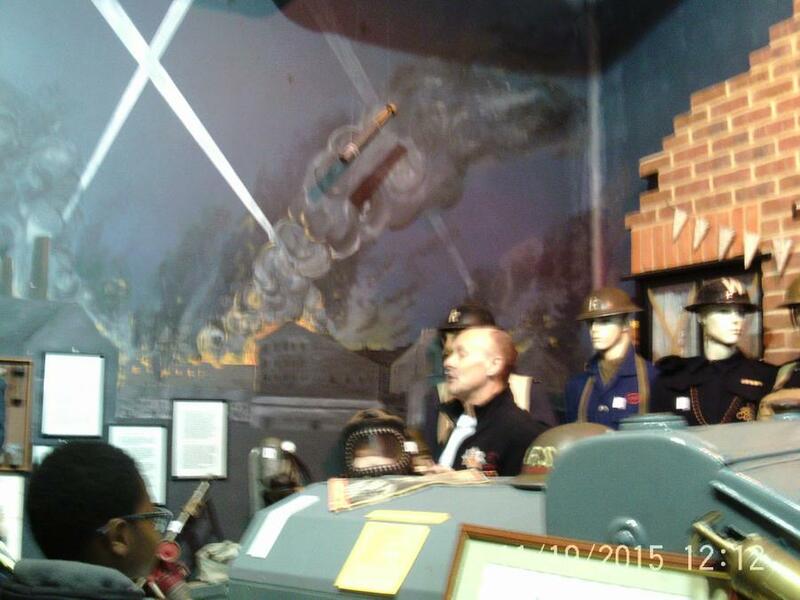 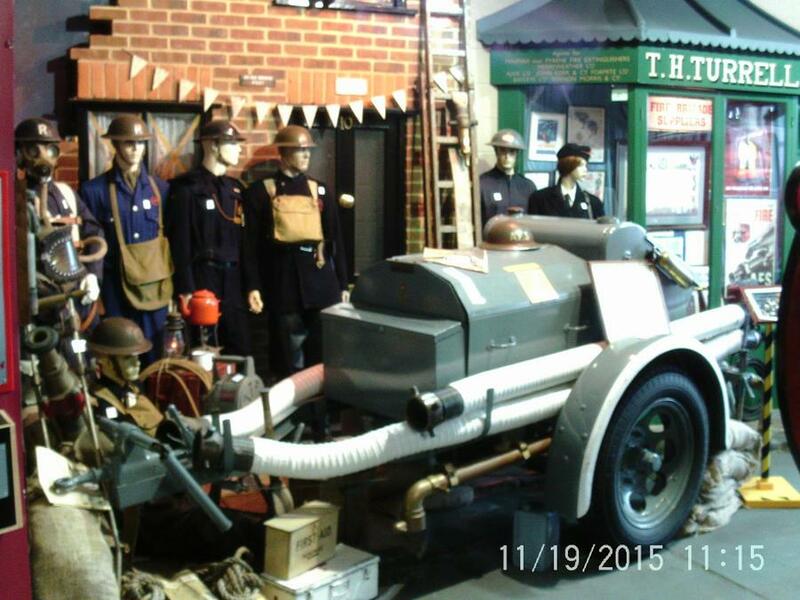 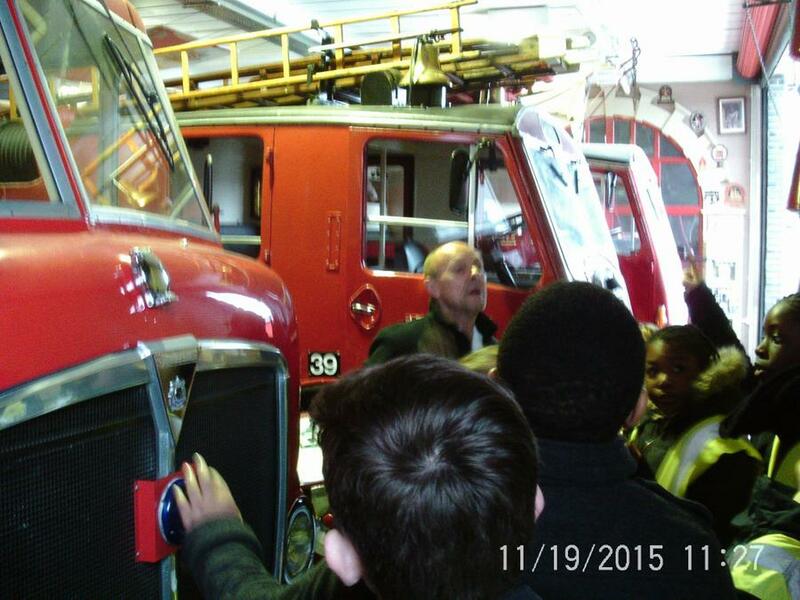 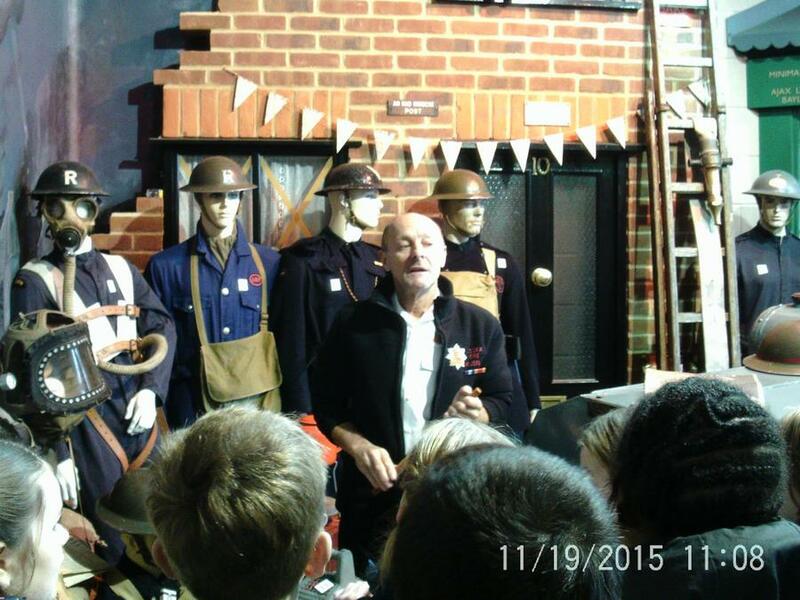 We met a very enthusiastic ex-firefighter, Roger, who created the museum. 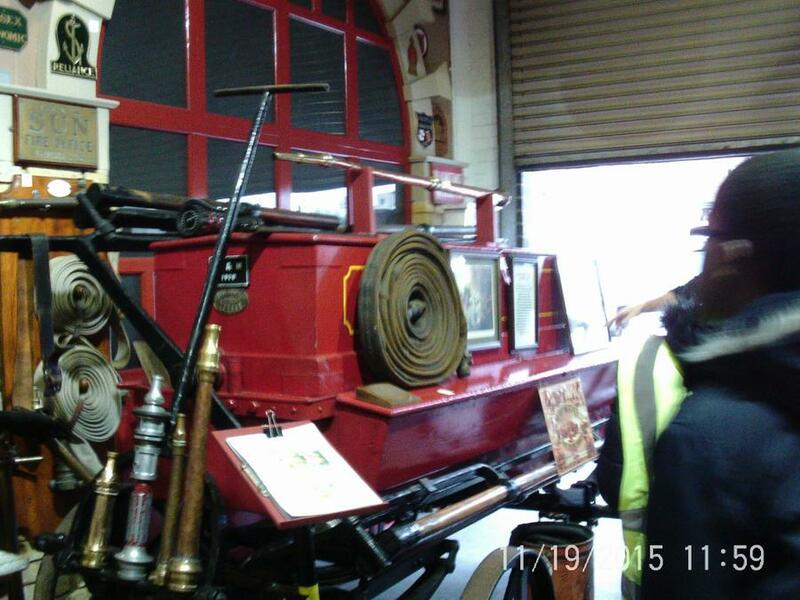 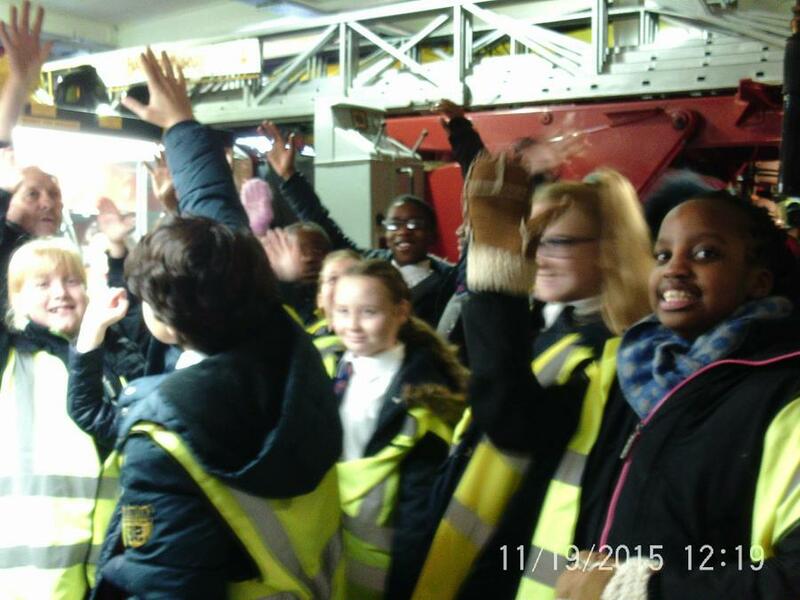 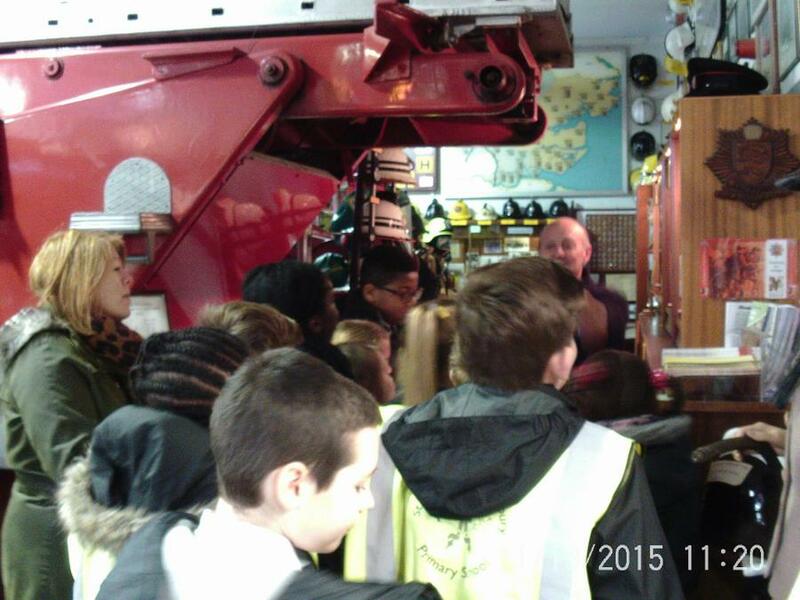 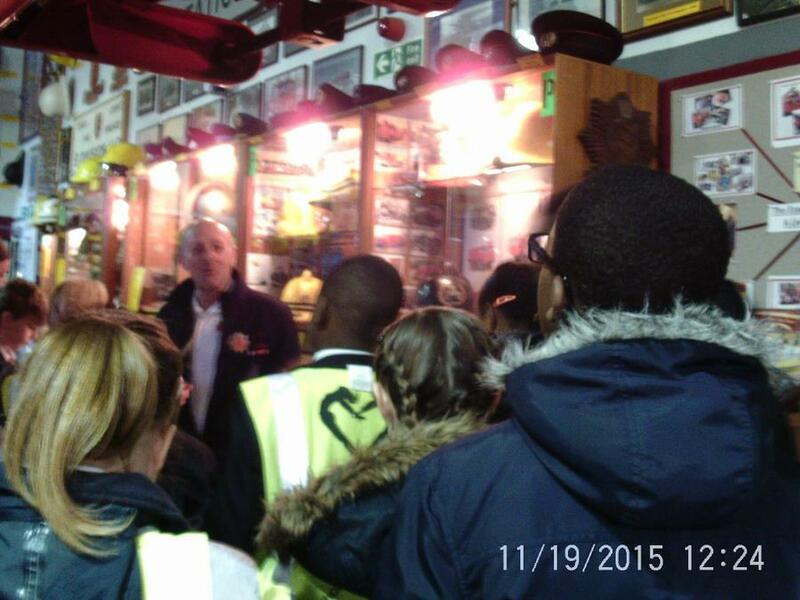 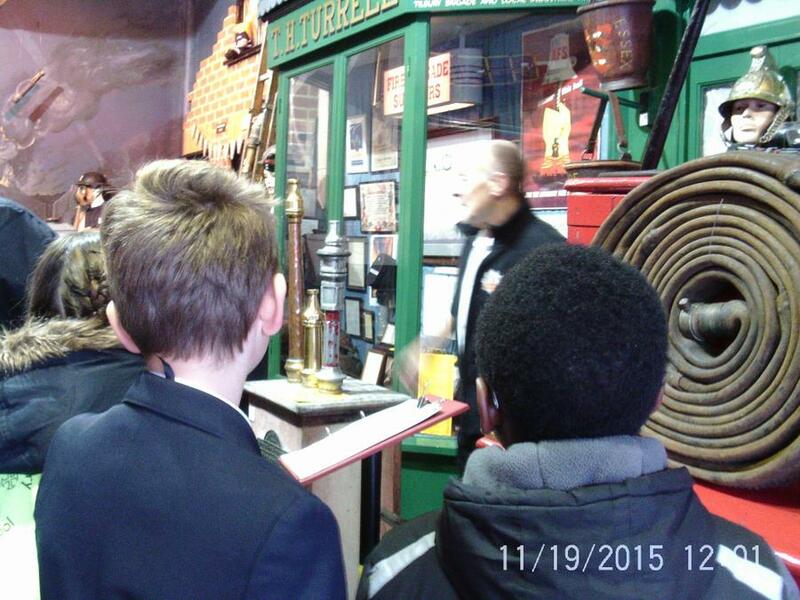 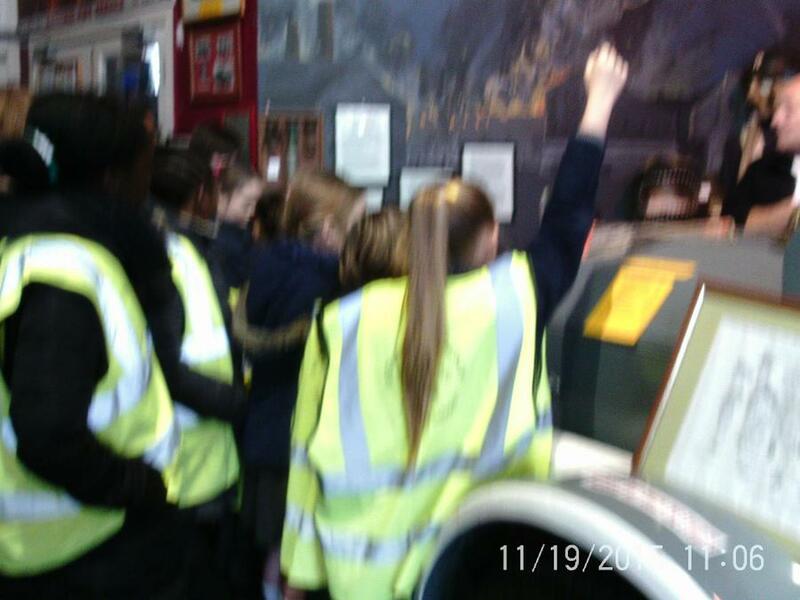 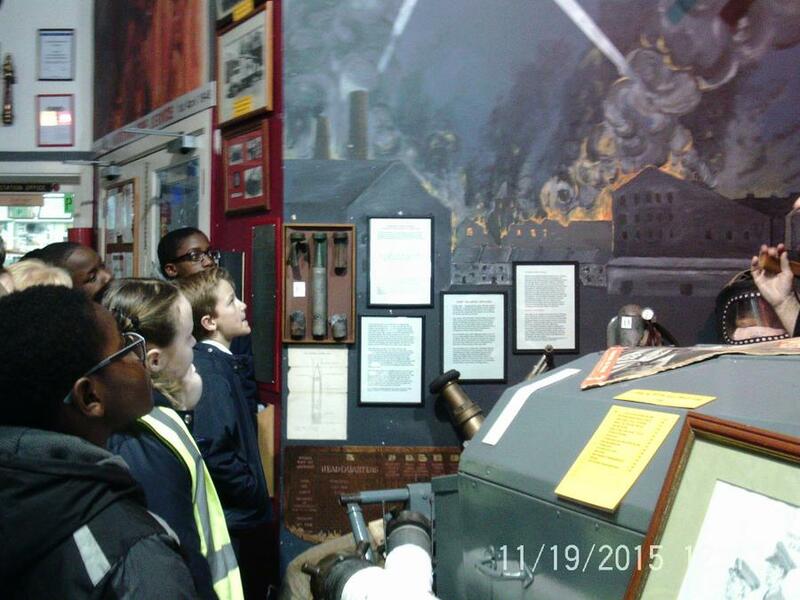 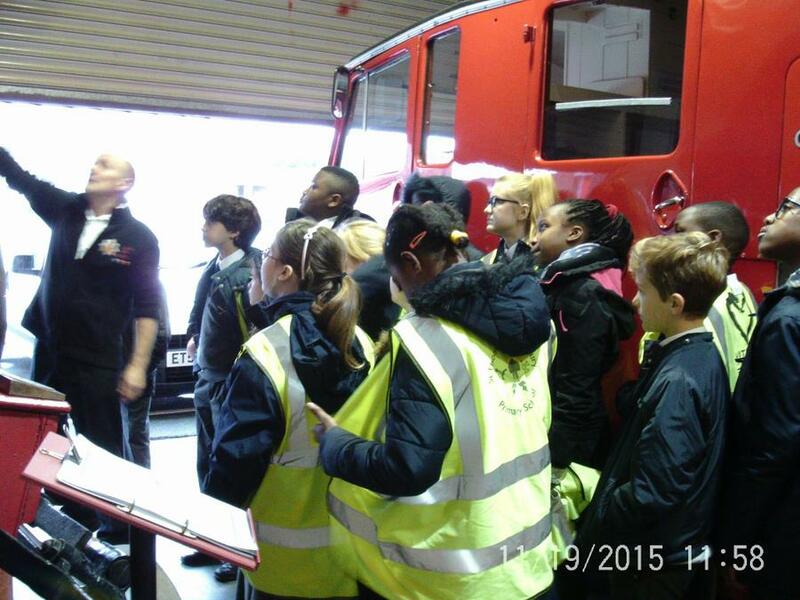 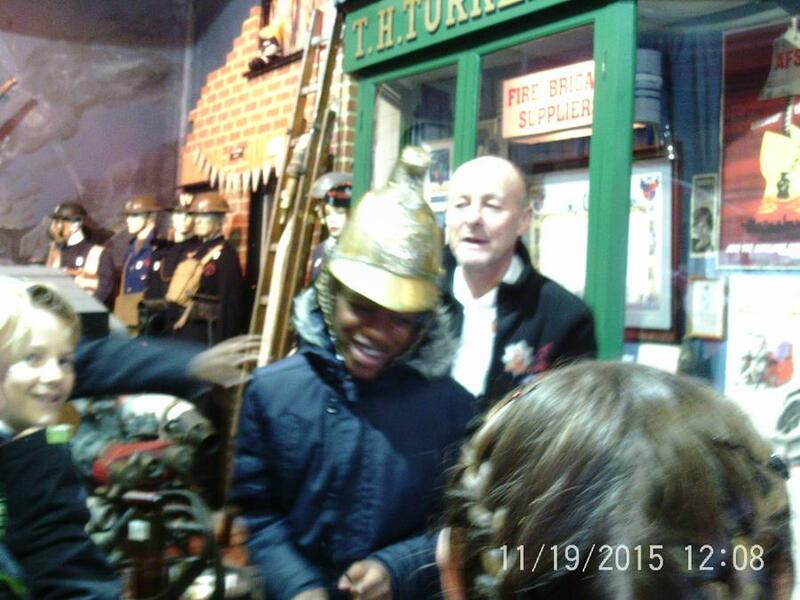 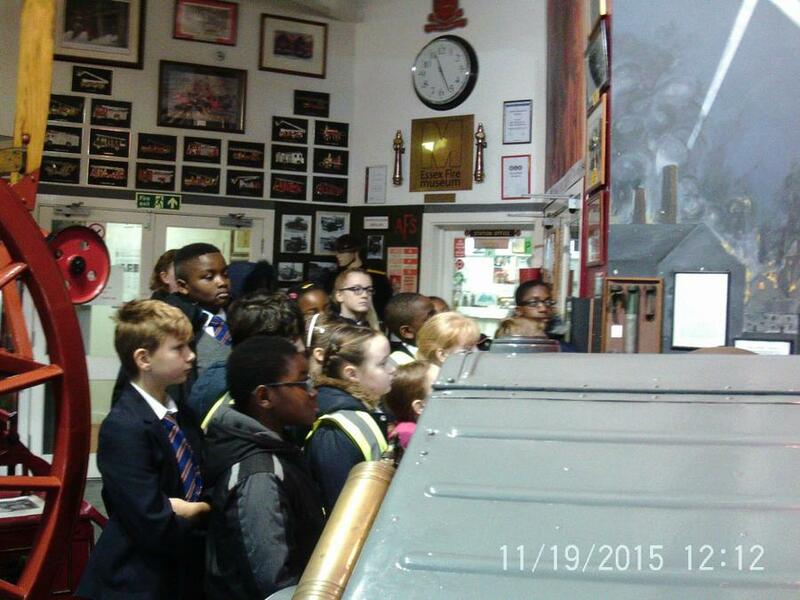 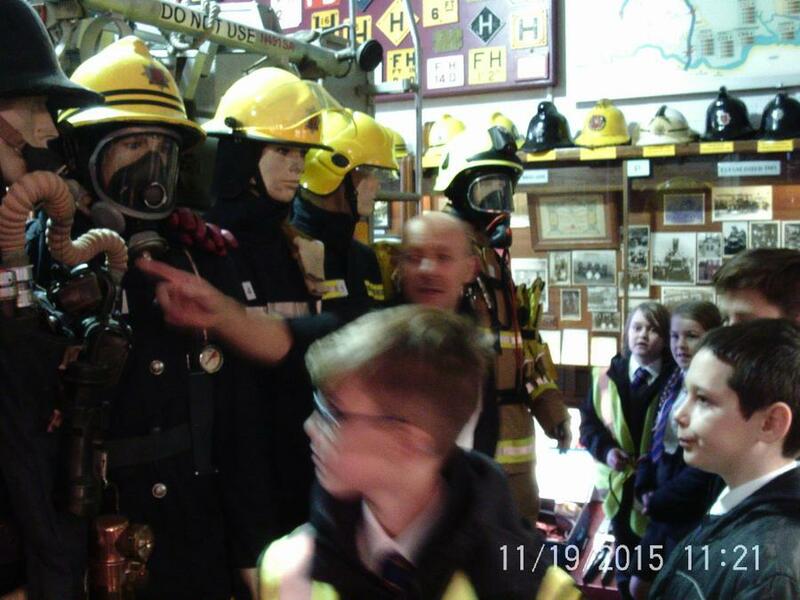 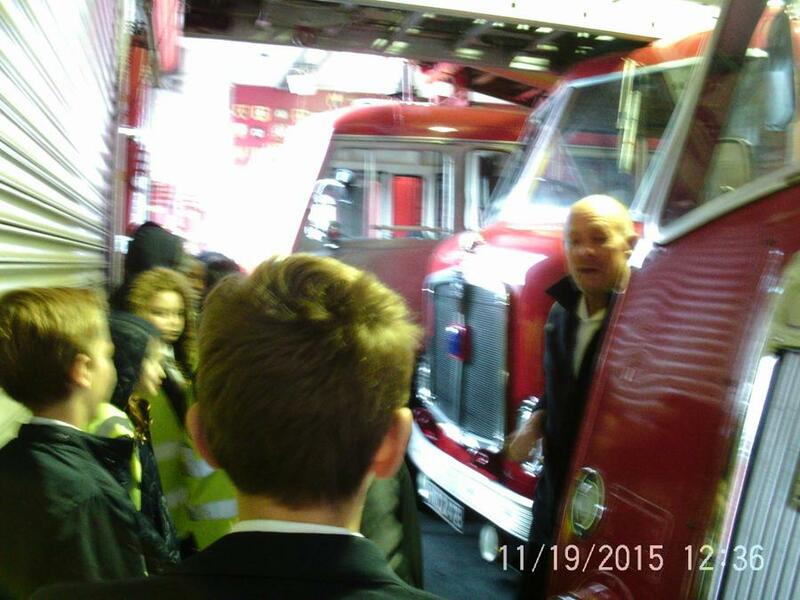 We enjoyed learning about all the artefacts and seeing how fighting fires has evolved over the years. 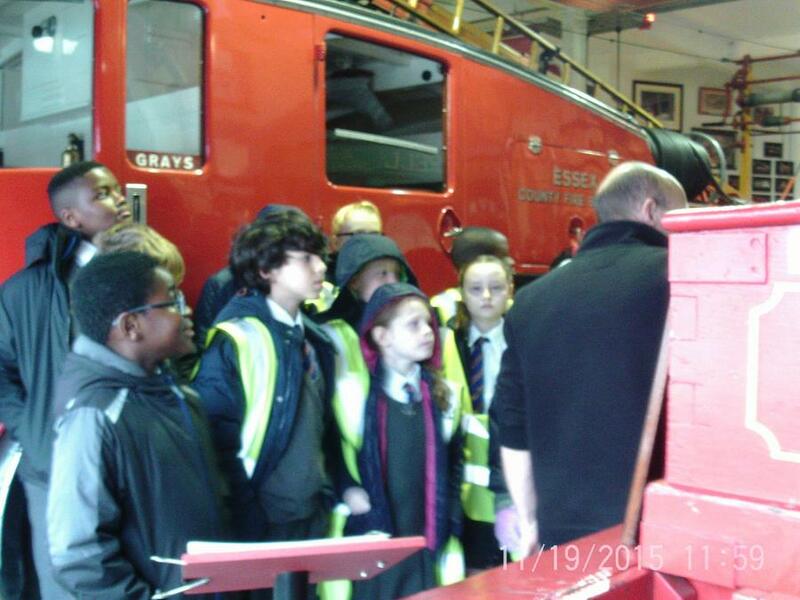 We also learnt lots about fire safety and all have ideas to take home to make sure our families are as safe as possible. 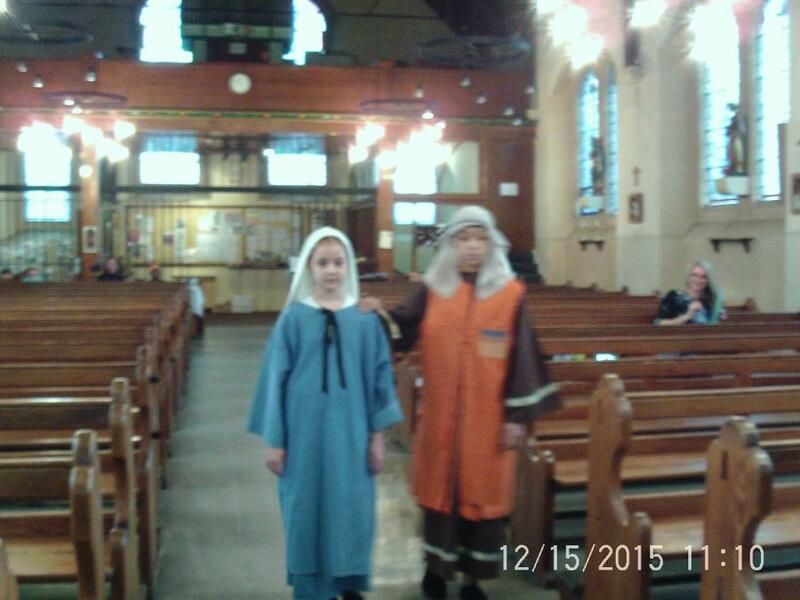 Just before half term the girls were all invited to spend the day at the Convent. 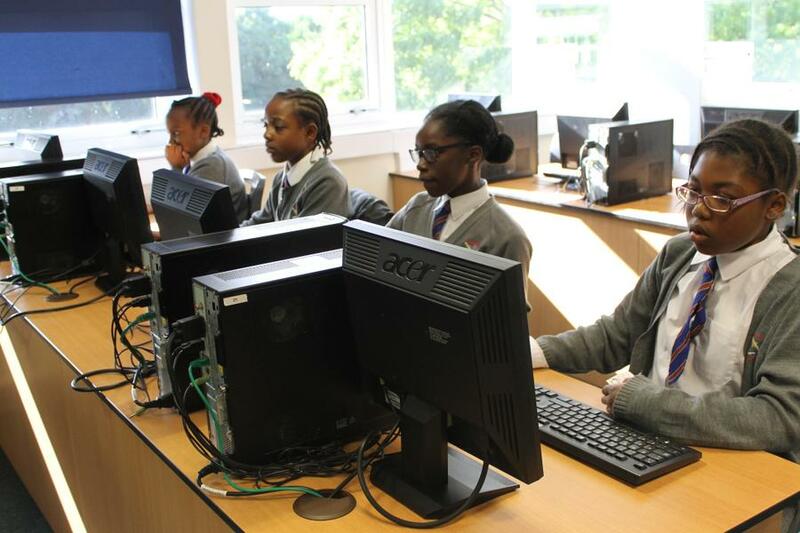 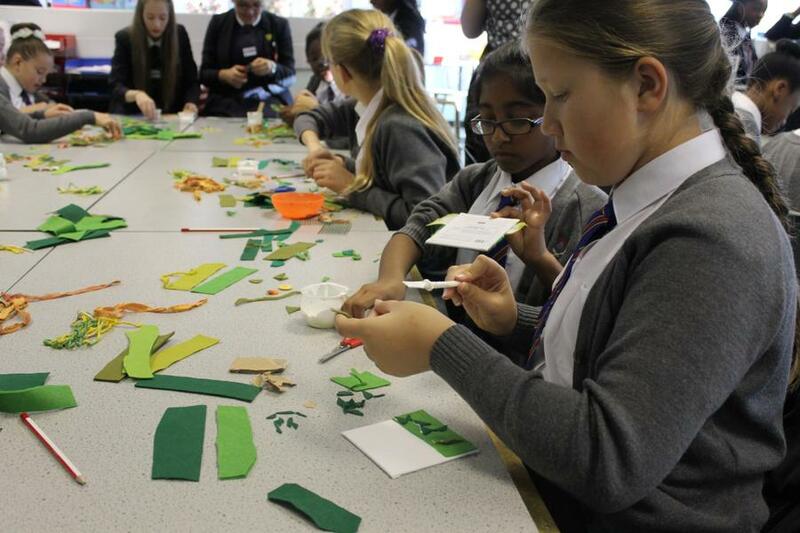 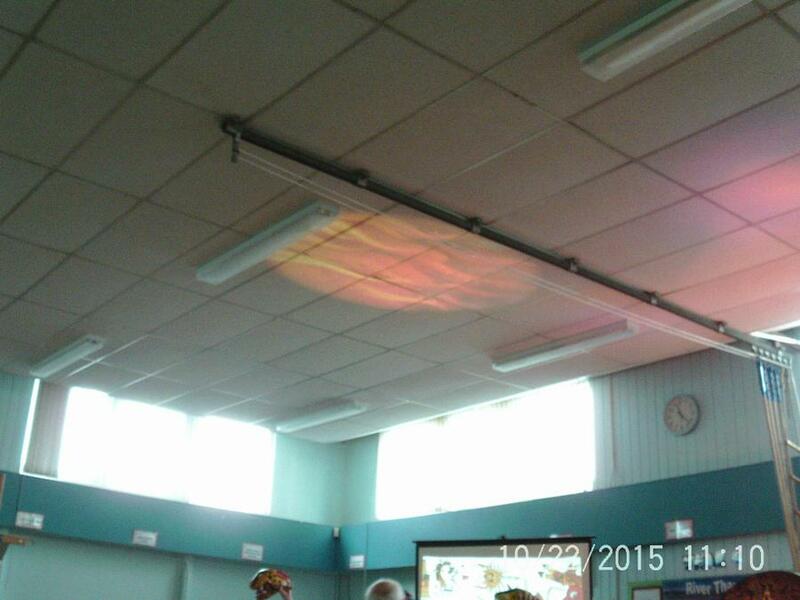 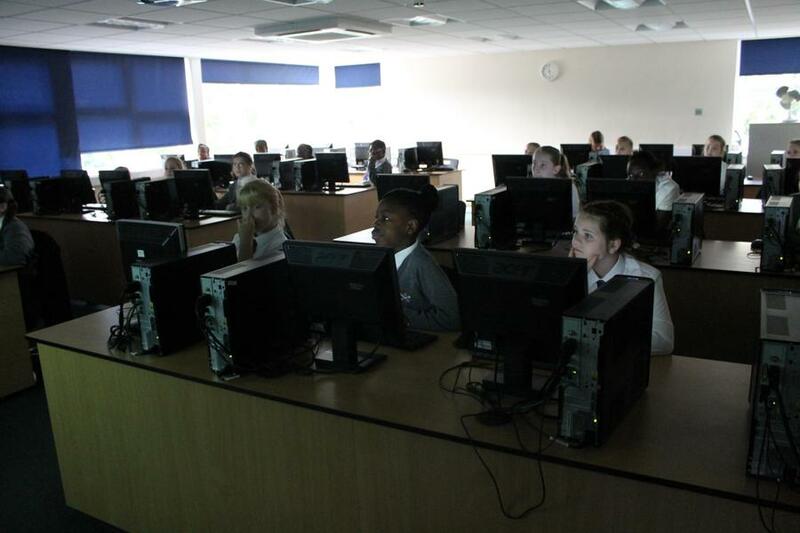 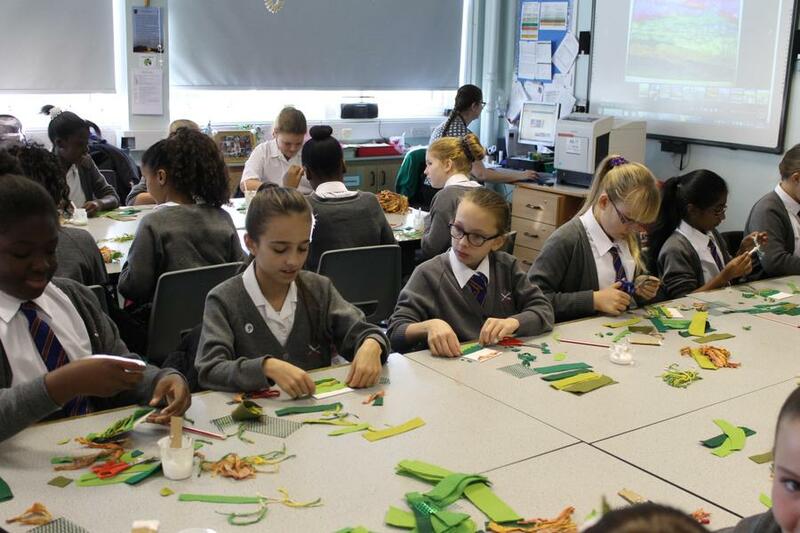 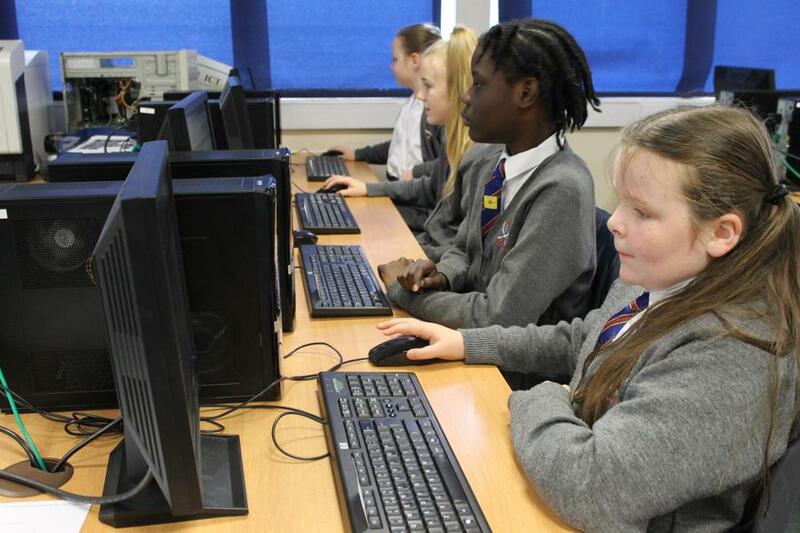 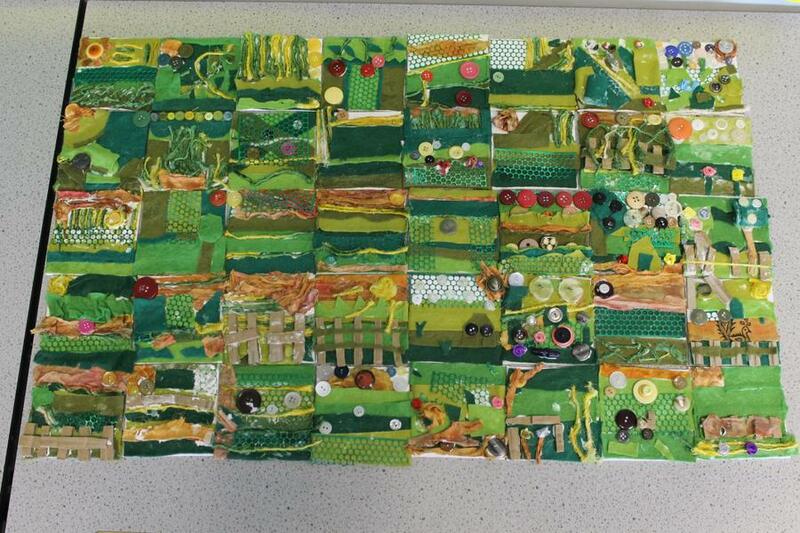 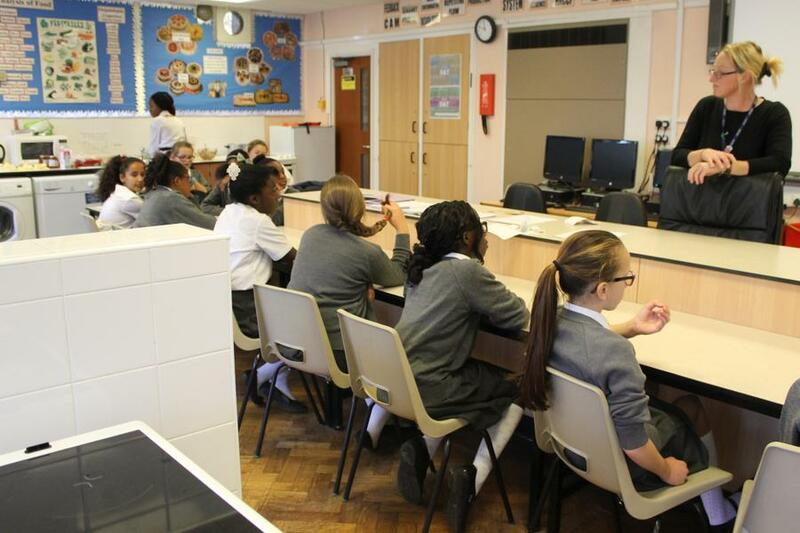 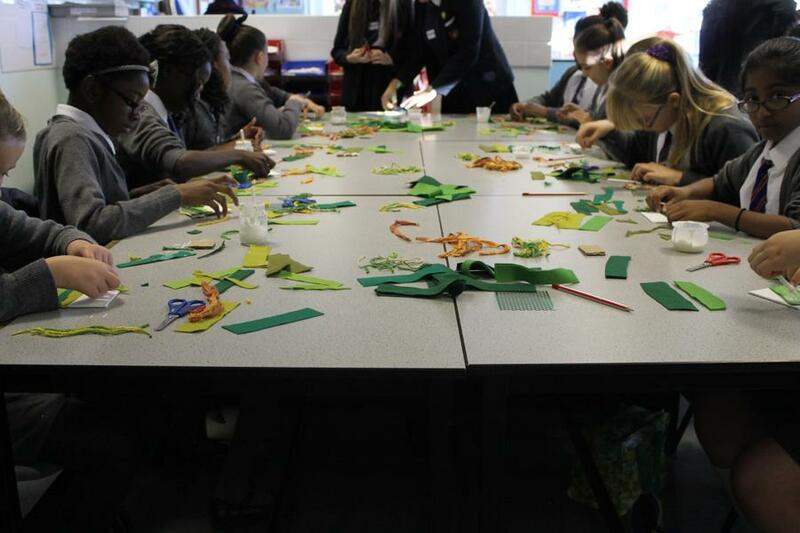 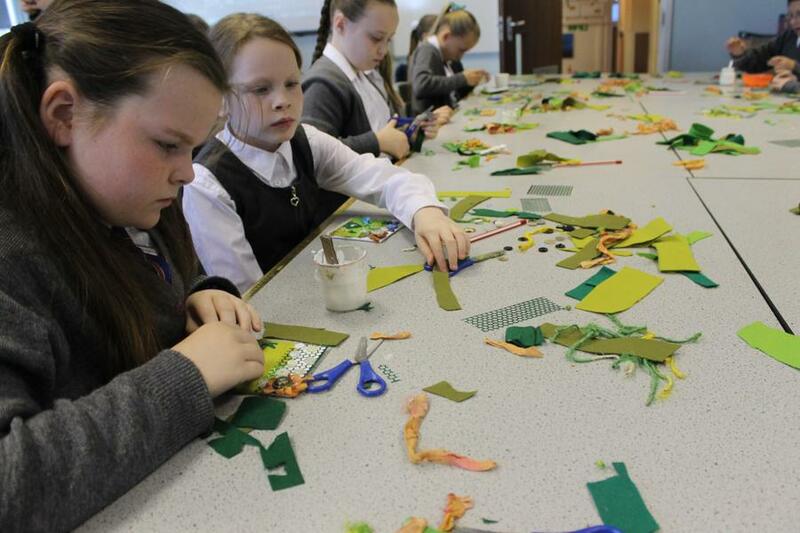 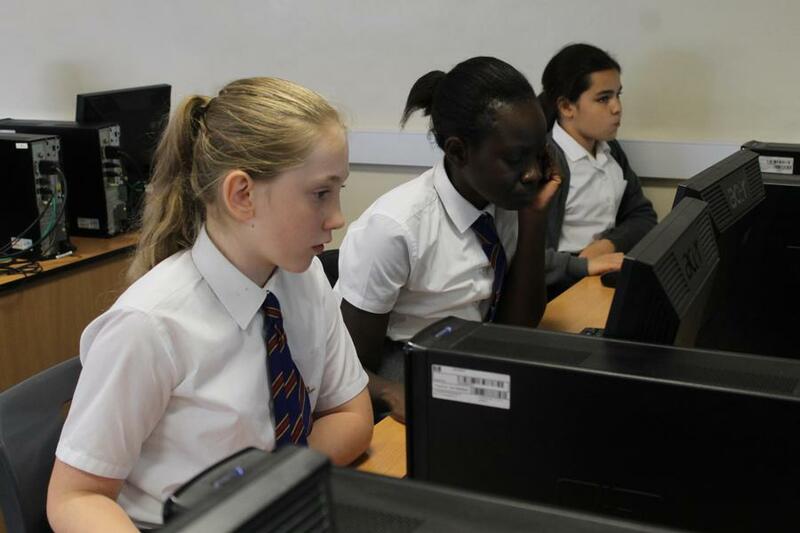 We took part in a fantastic technology day where we tried graphics, textiles, computing and cooking. 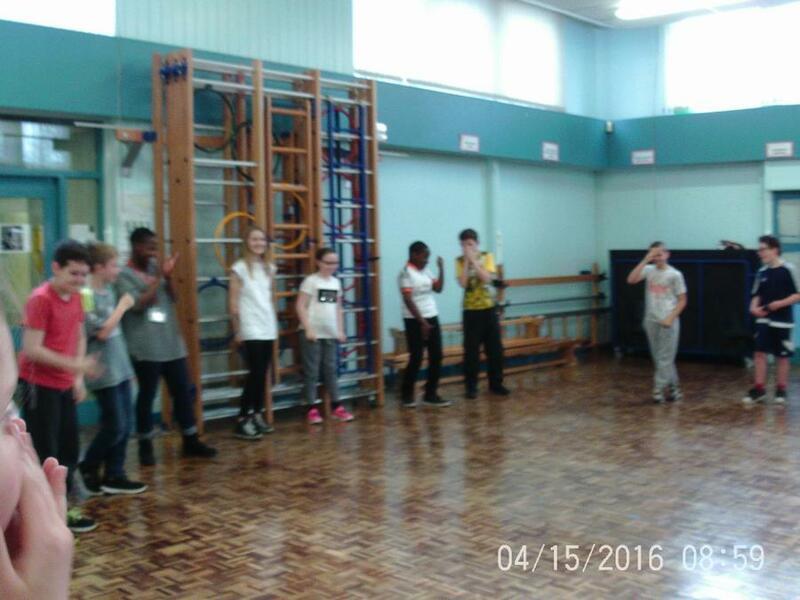 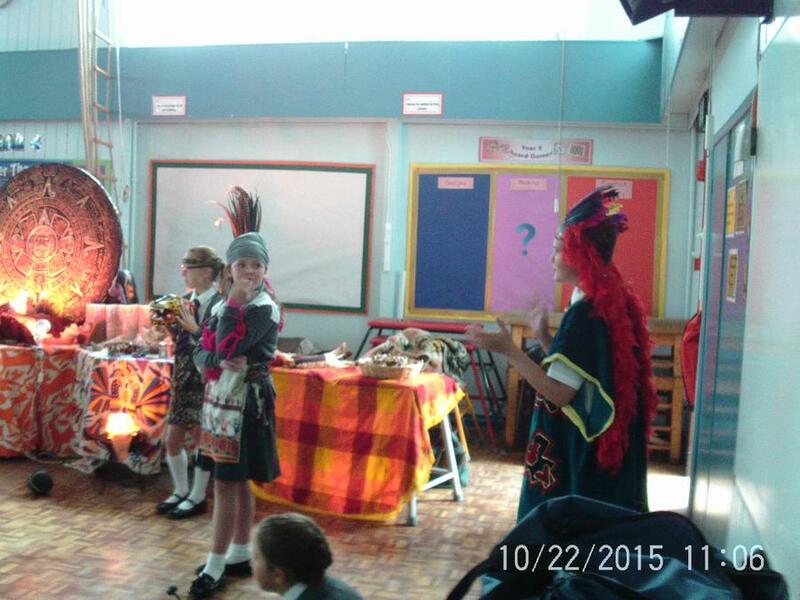 We all learnt new skills and particularly enjoyed the fashion show at lunch time. 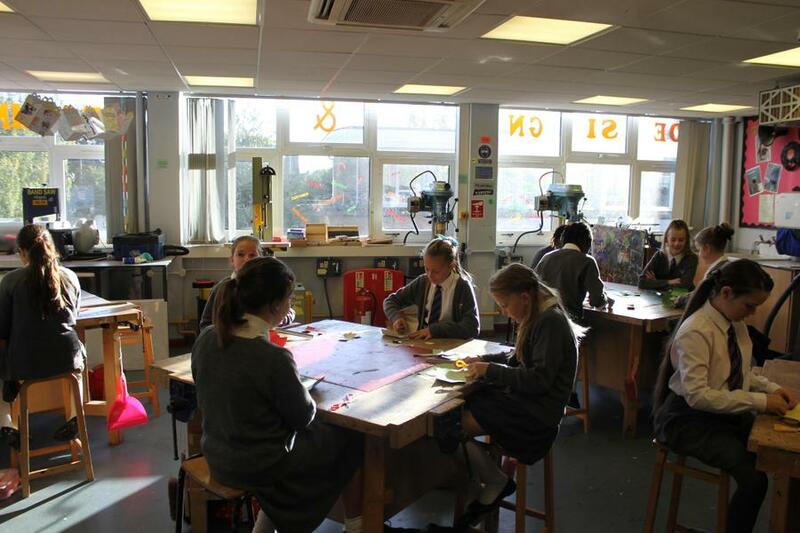 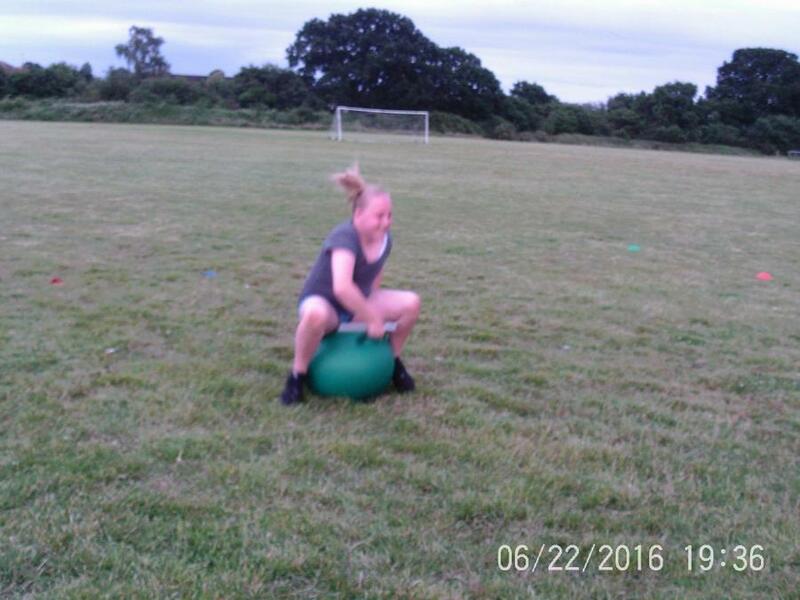 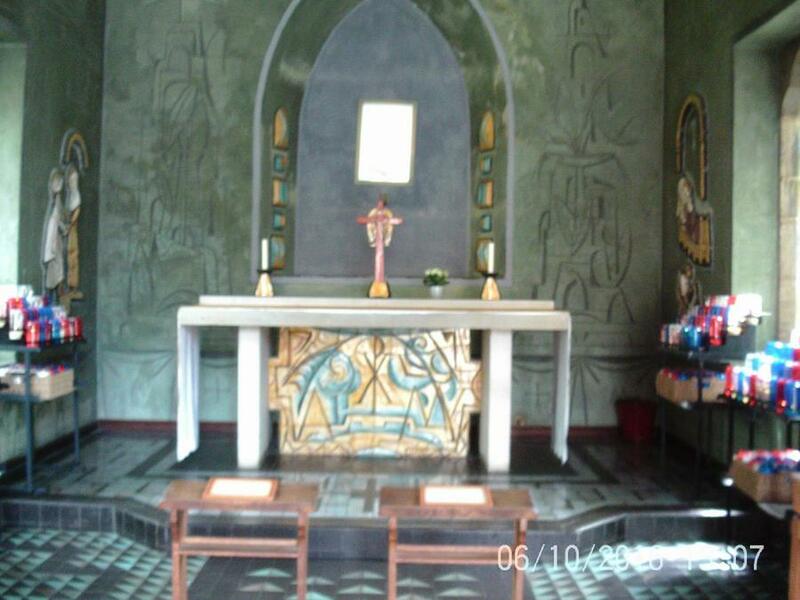 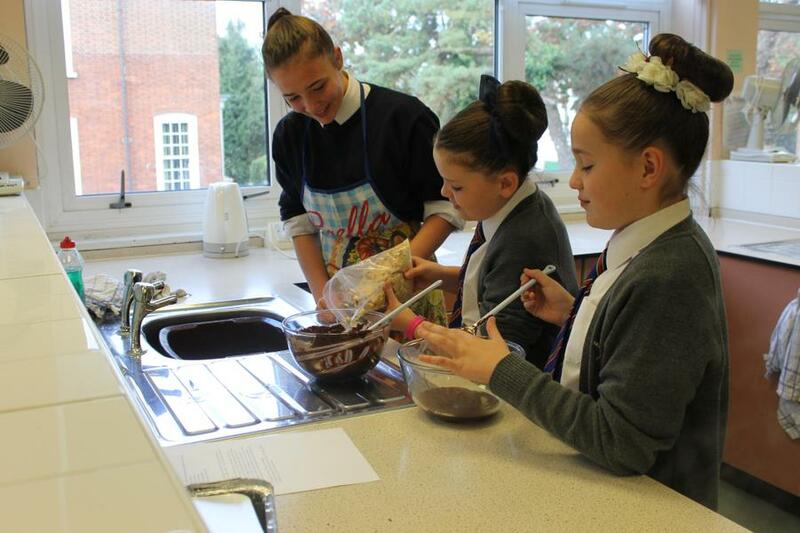 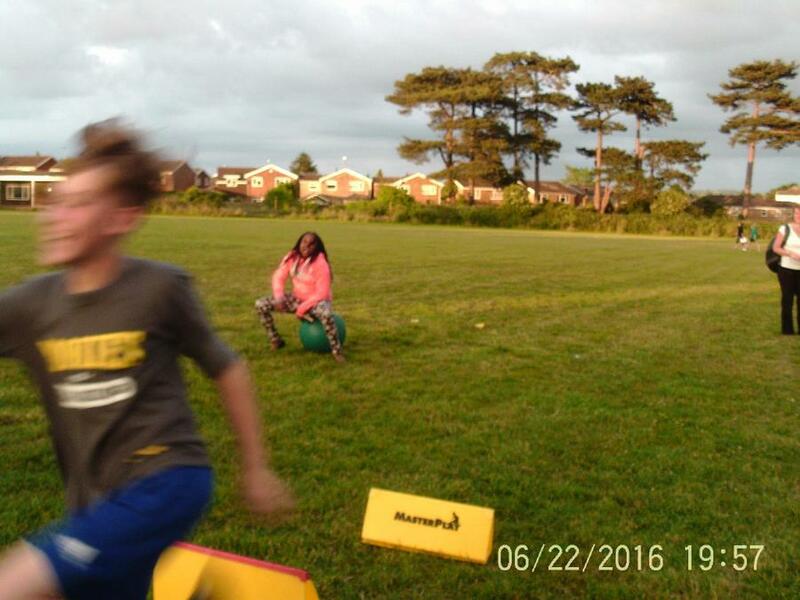 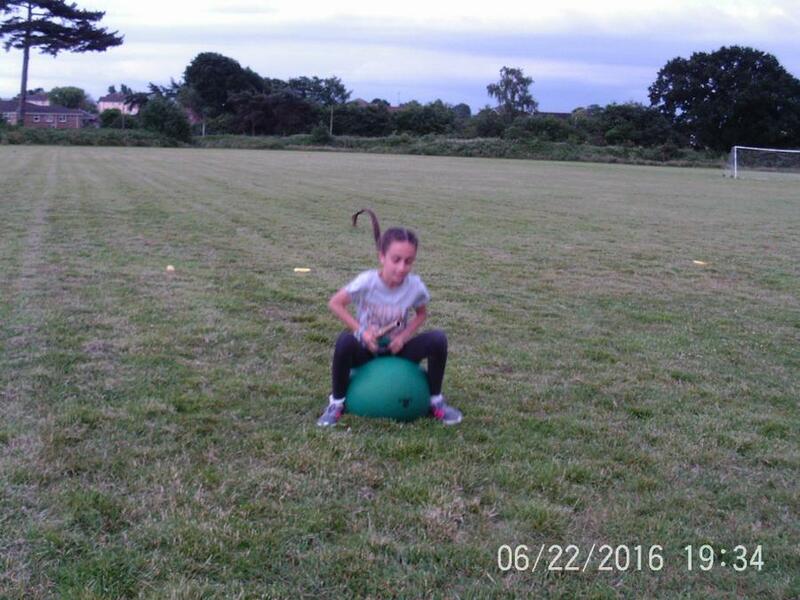 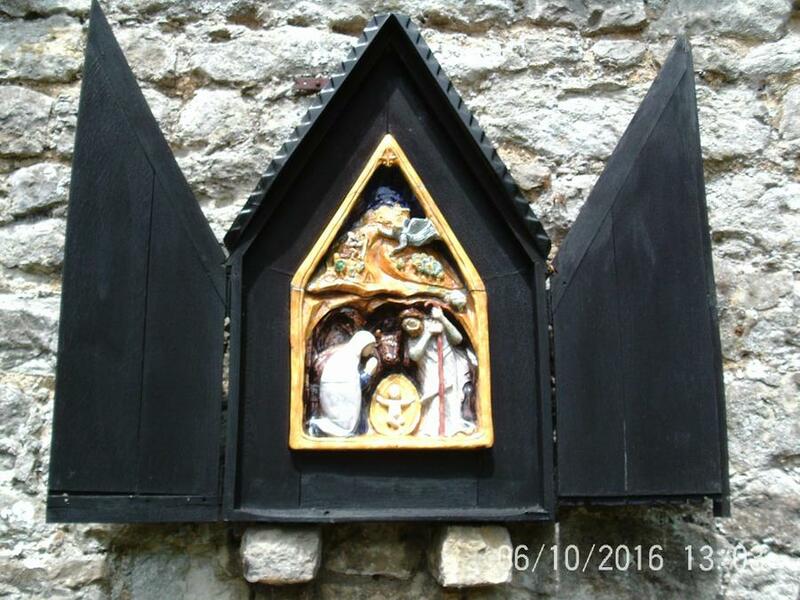 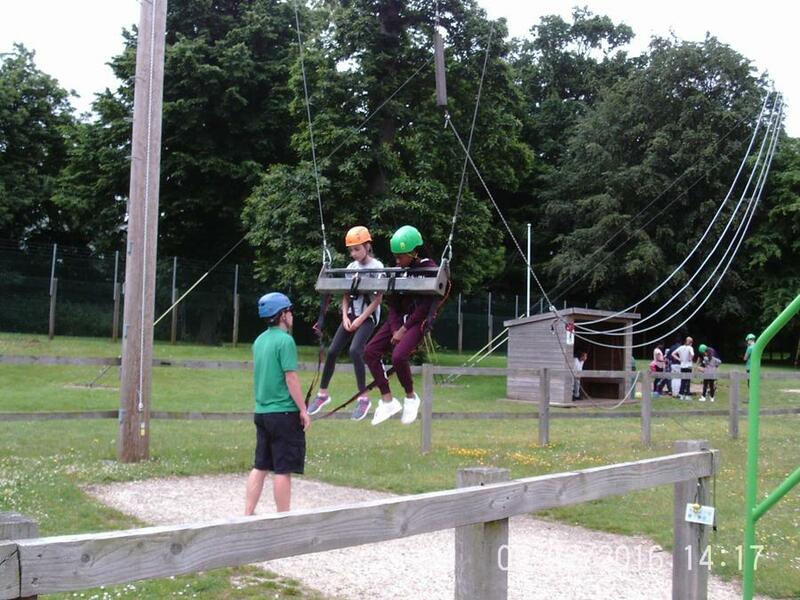 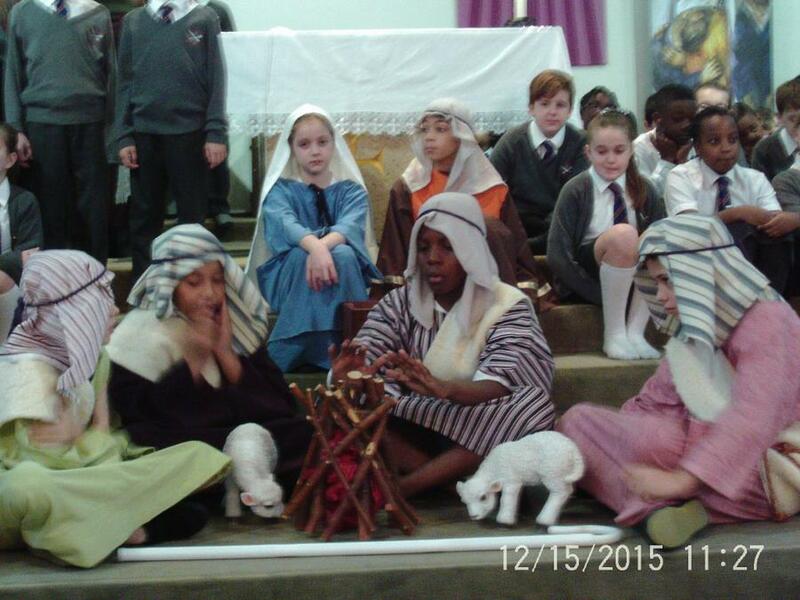 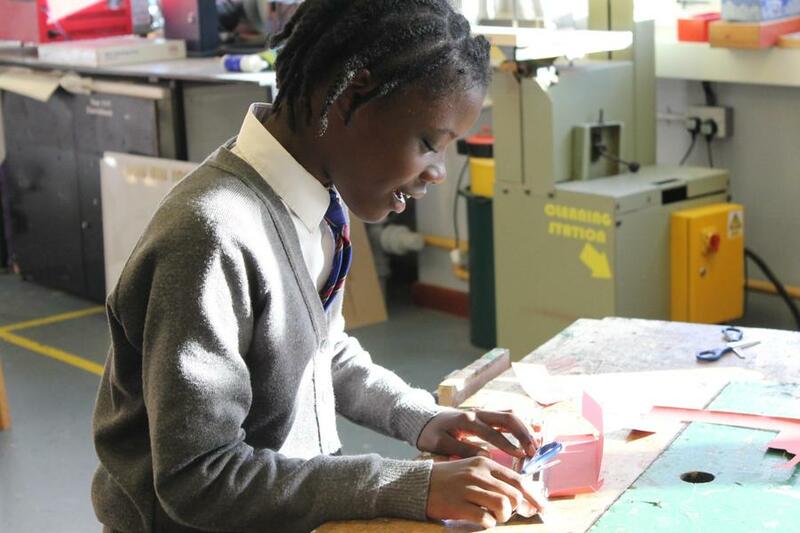 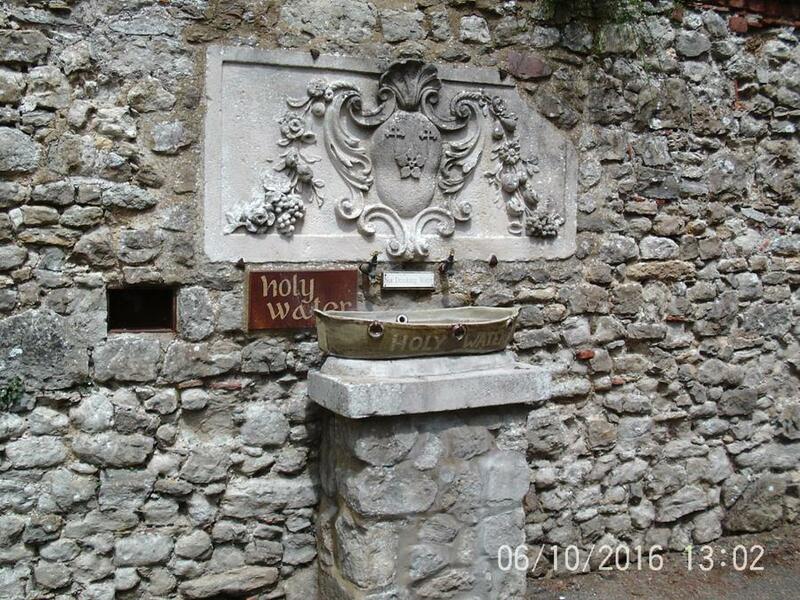 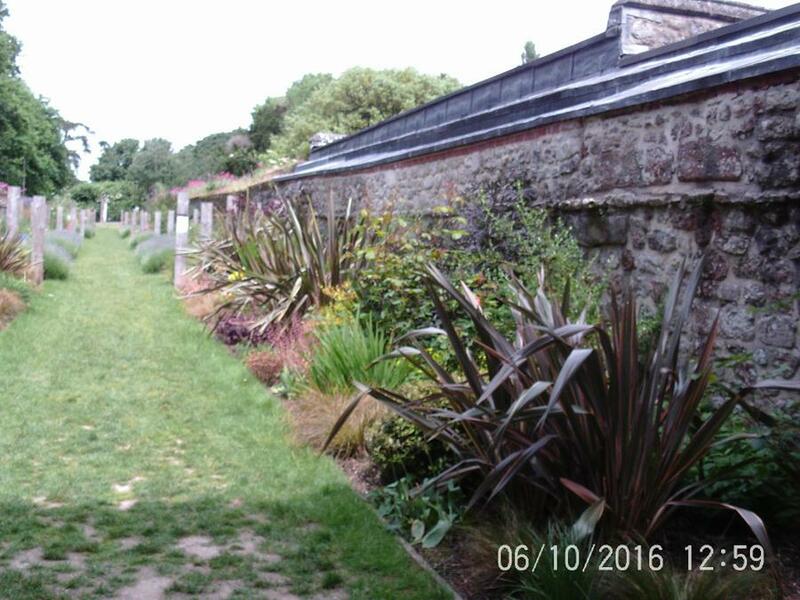 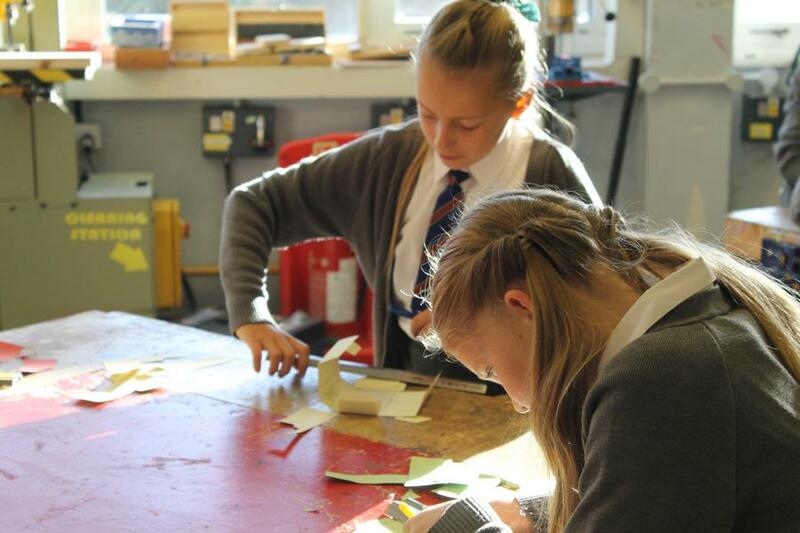 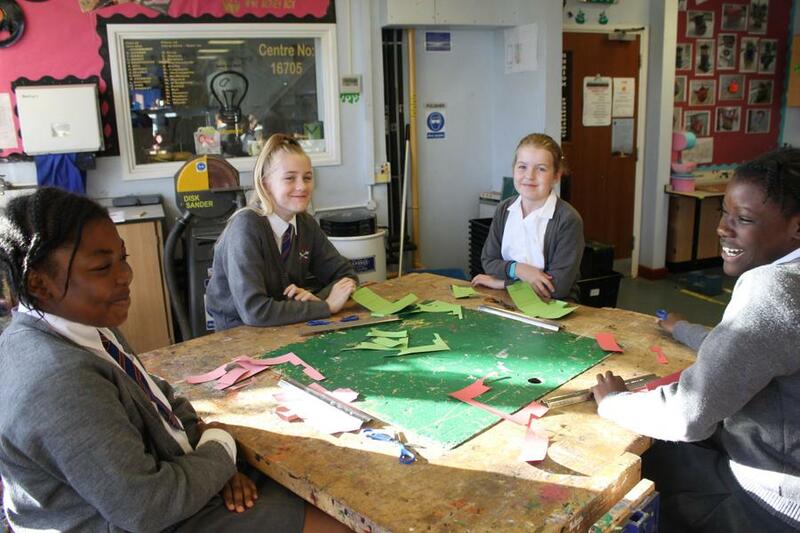 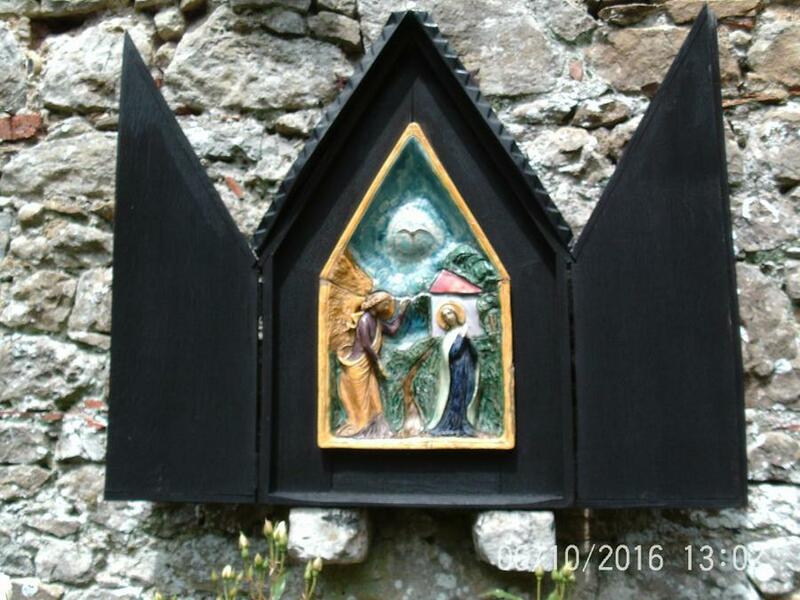 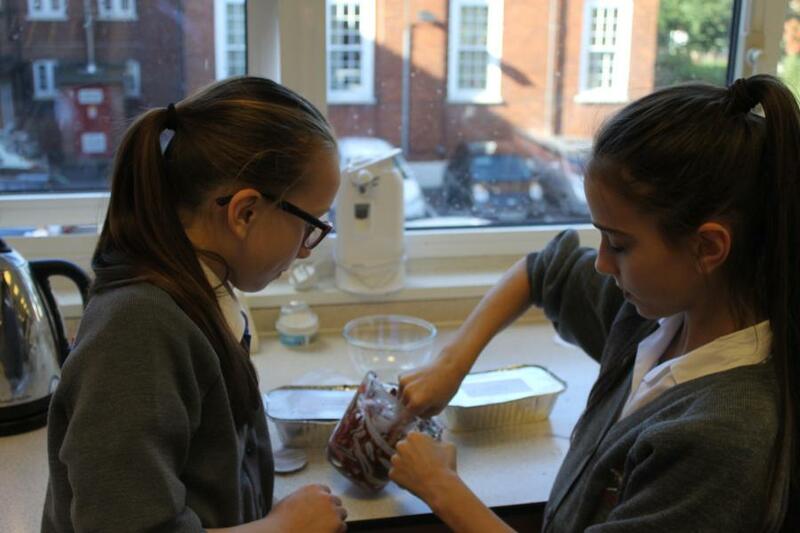 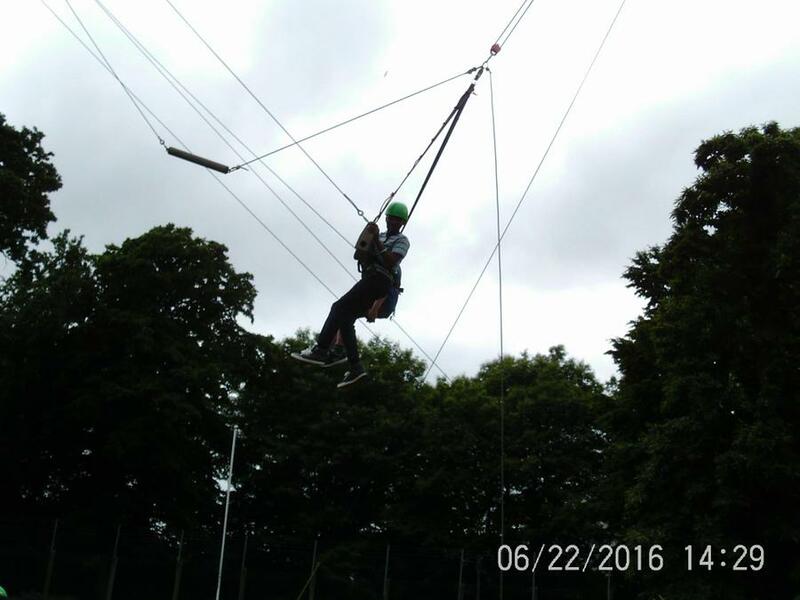 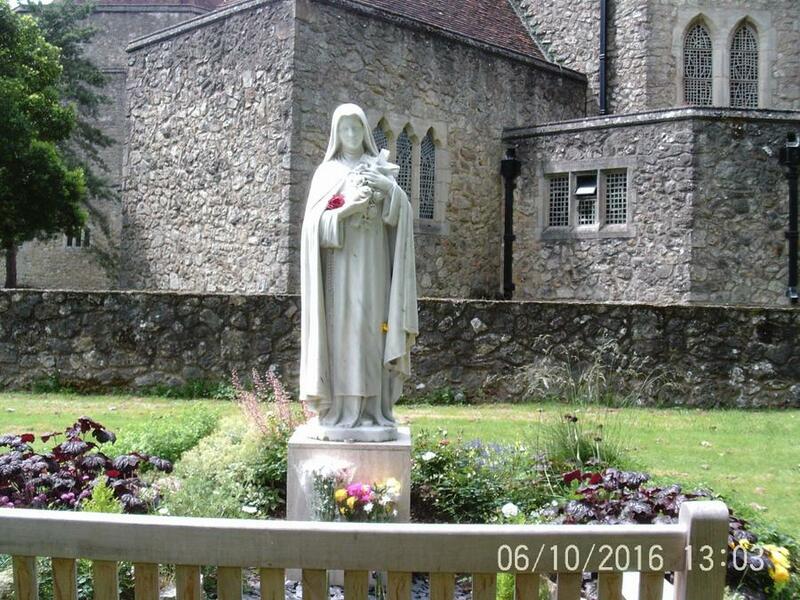 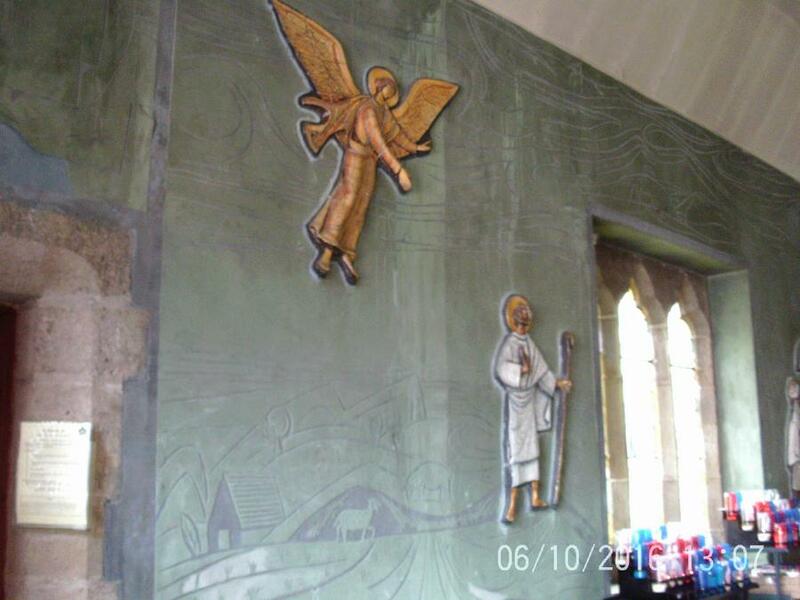 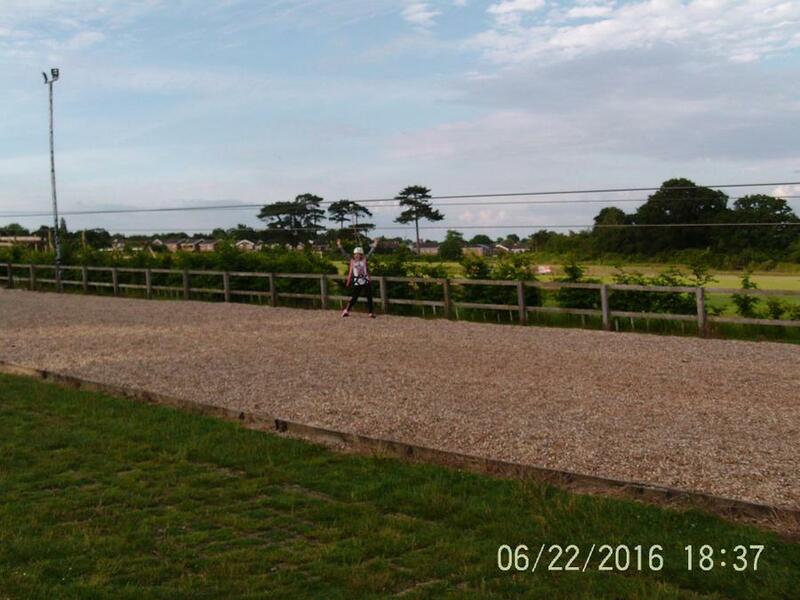 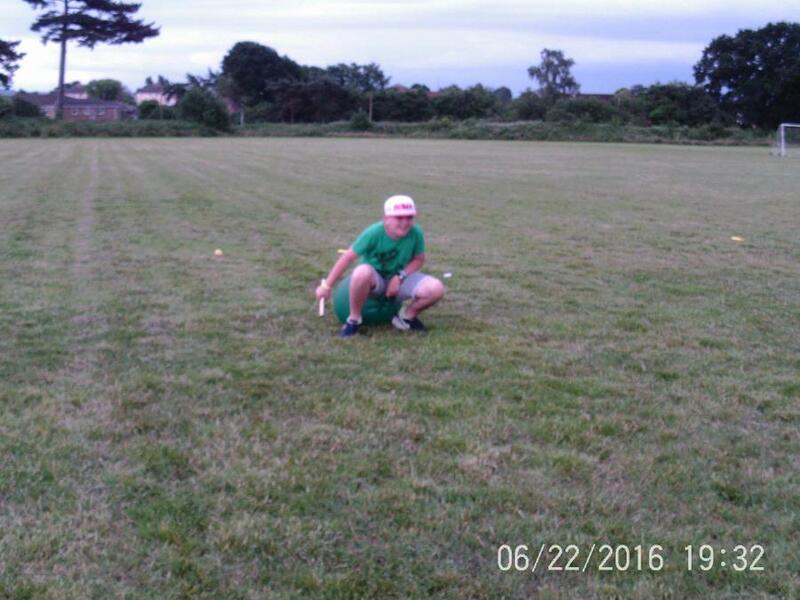 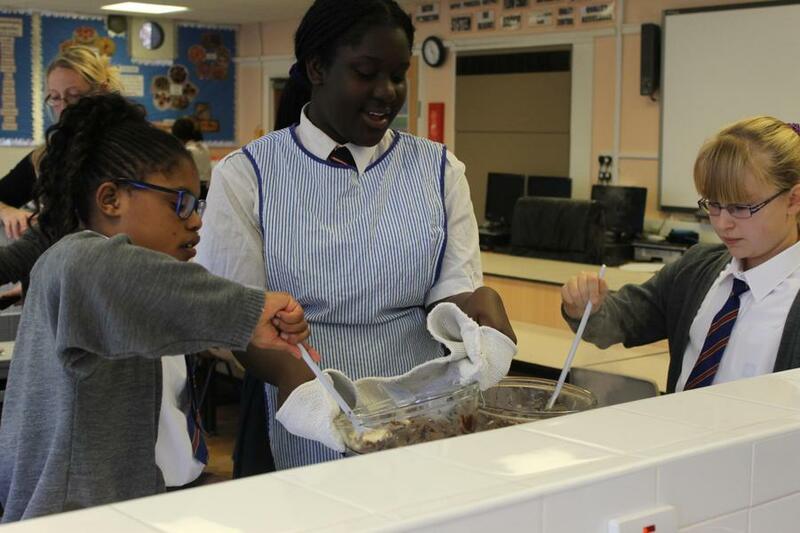 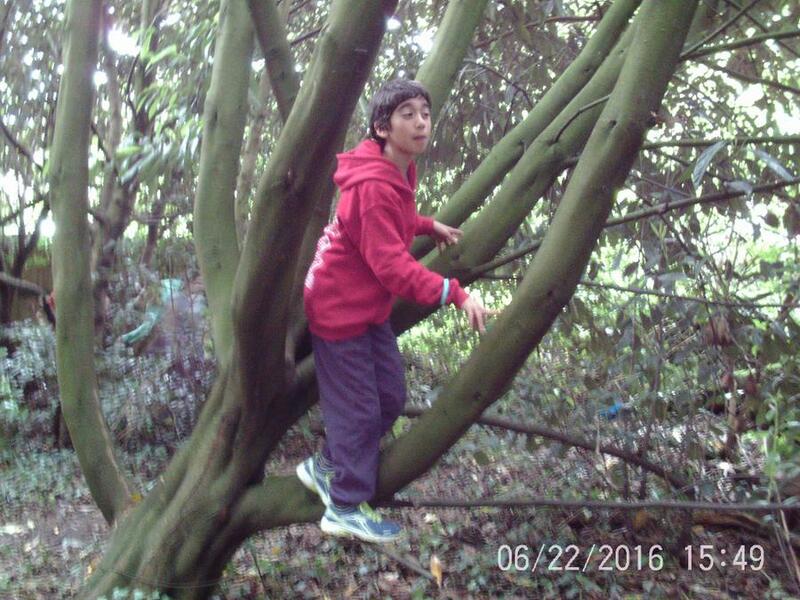 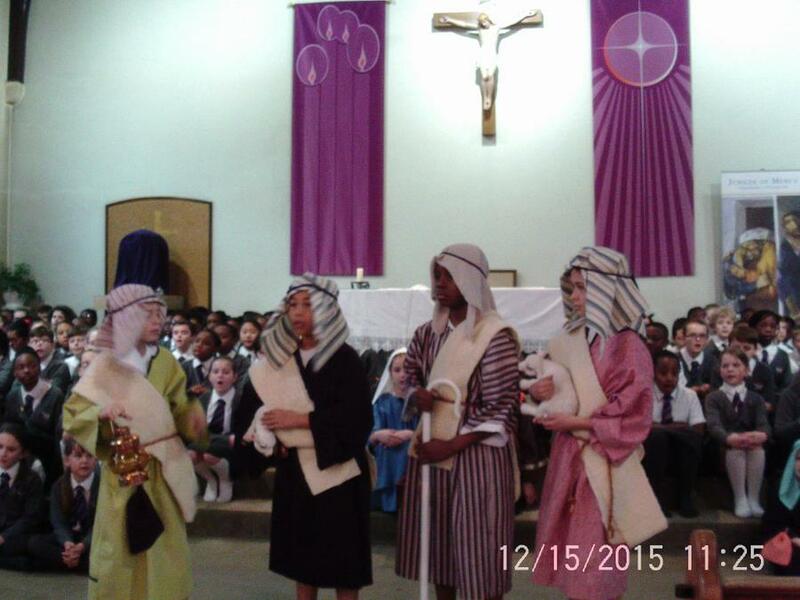 The teachers at the Convent have kindly sent the photographs of the day. 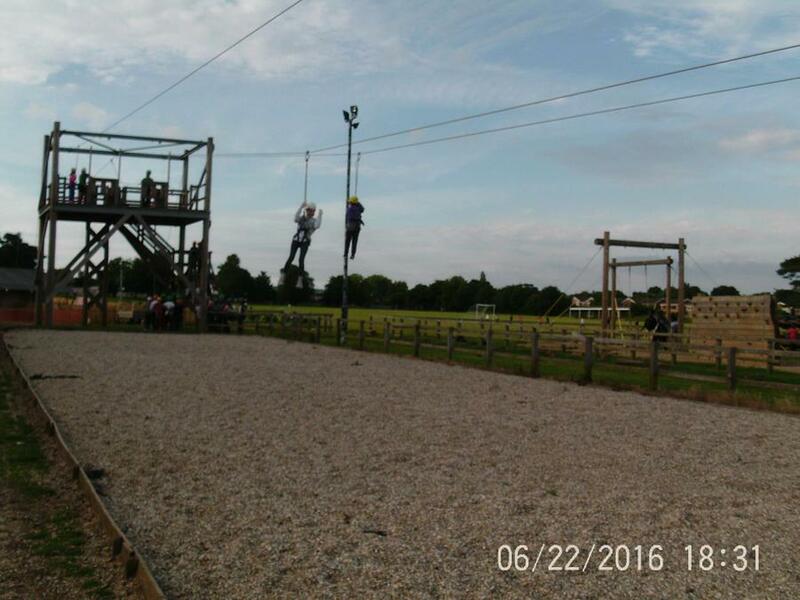 We hope you enjoy looking at the fun we had. 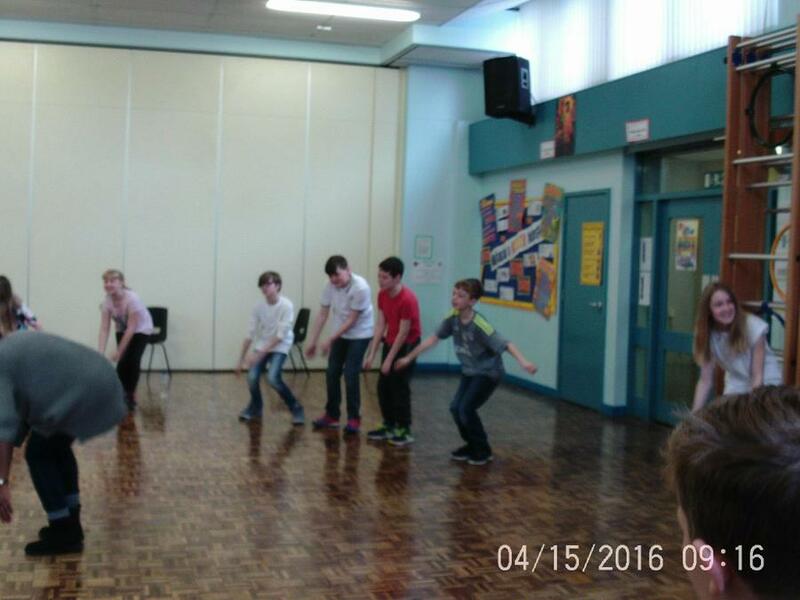 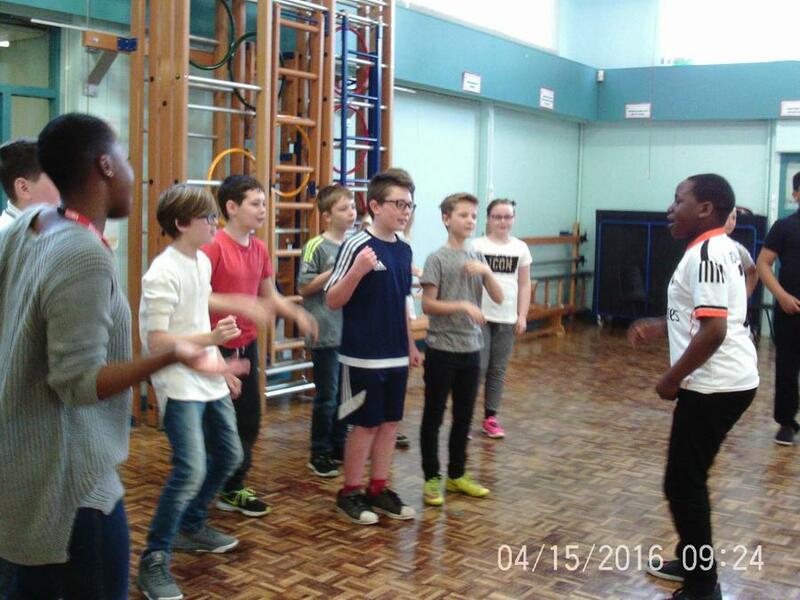 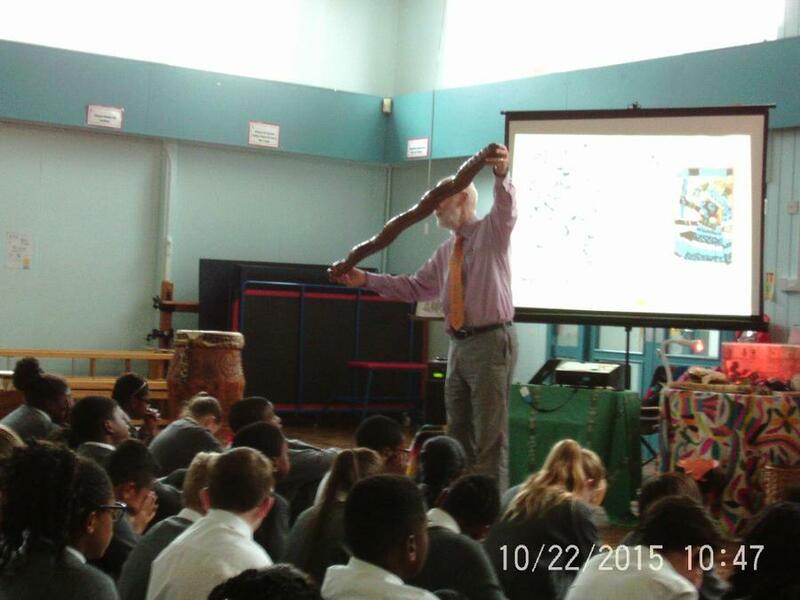 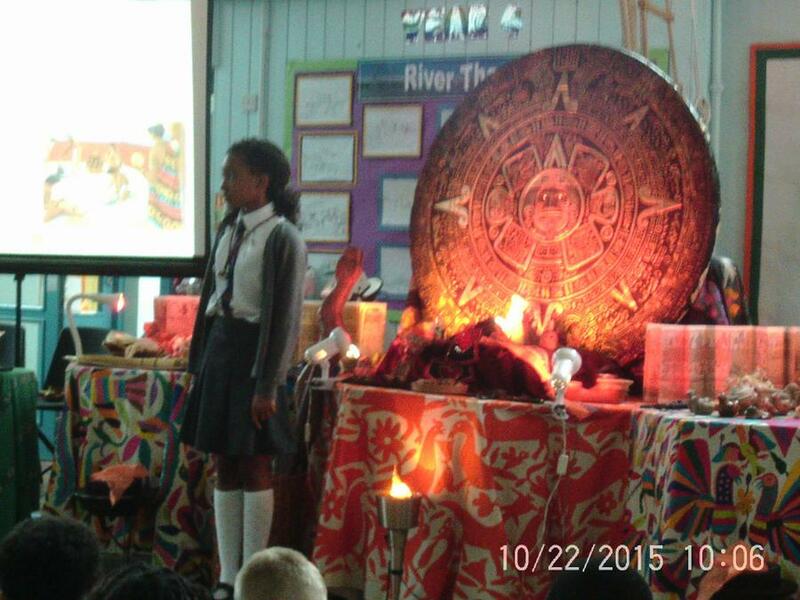 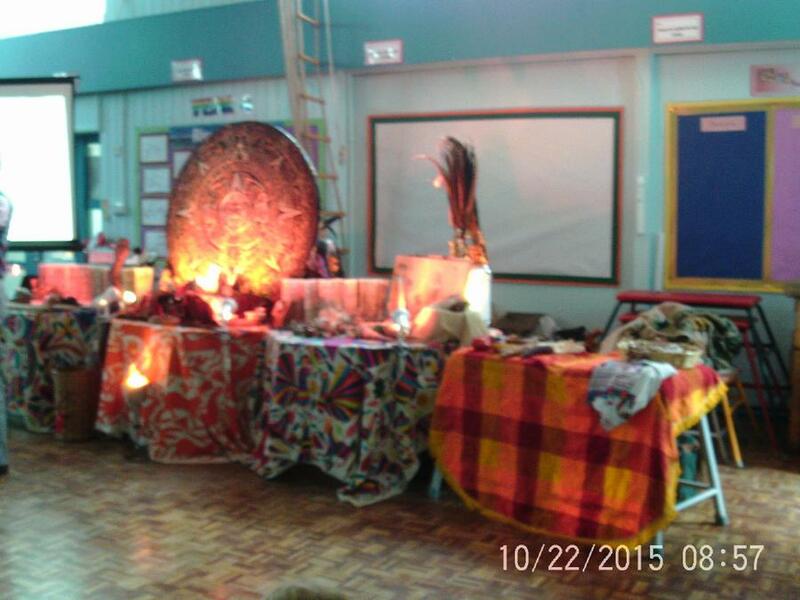 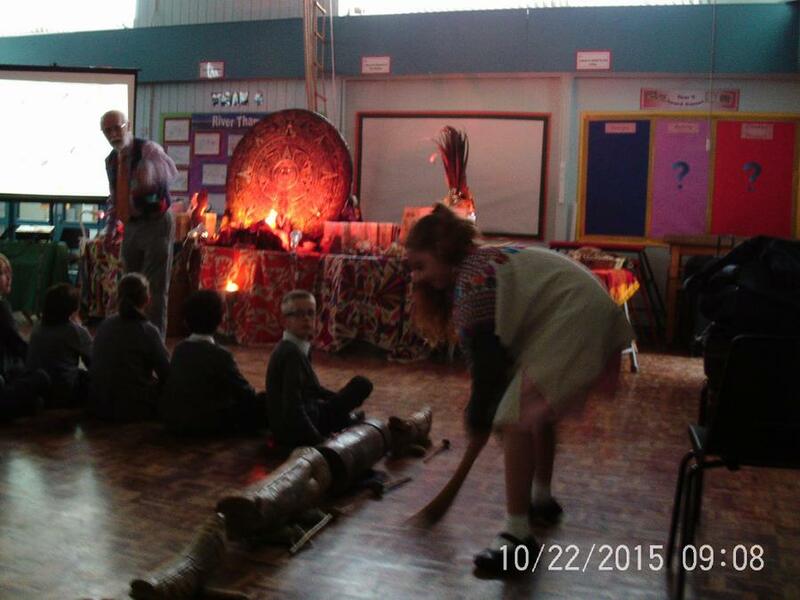 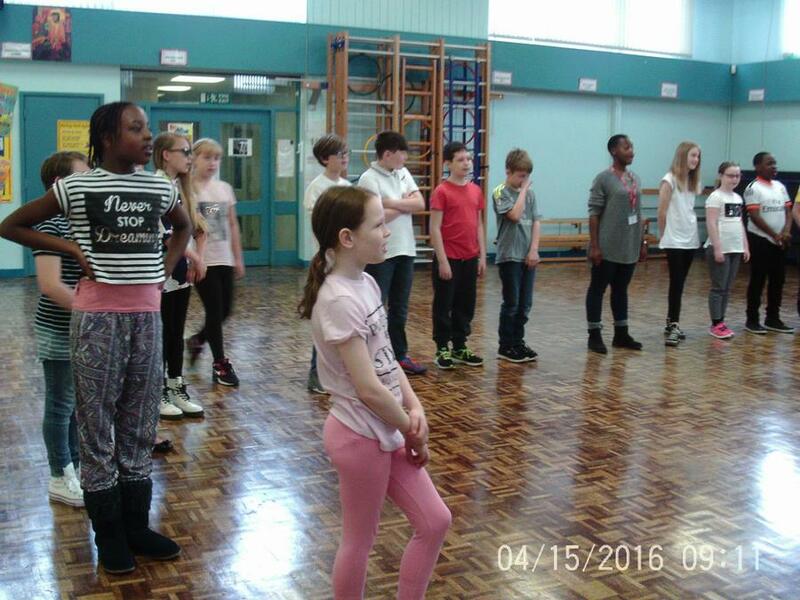 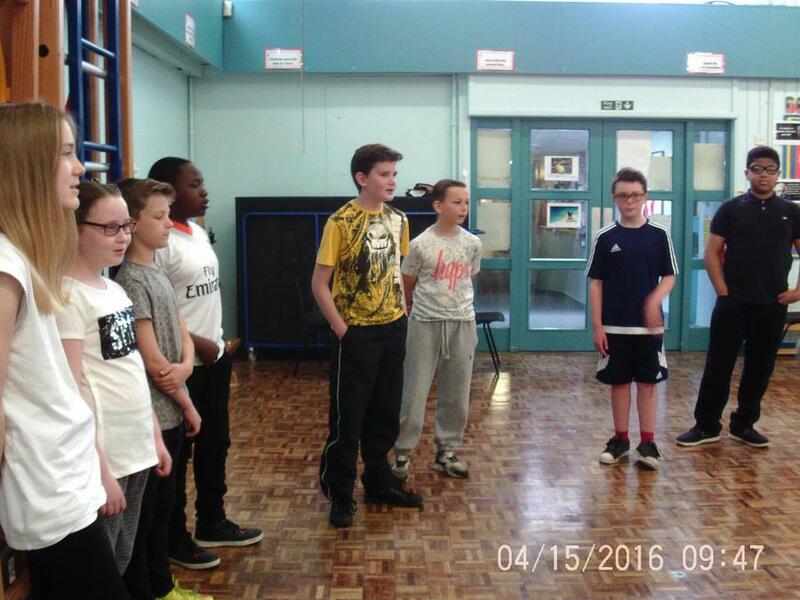 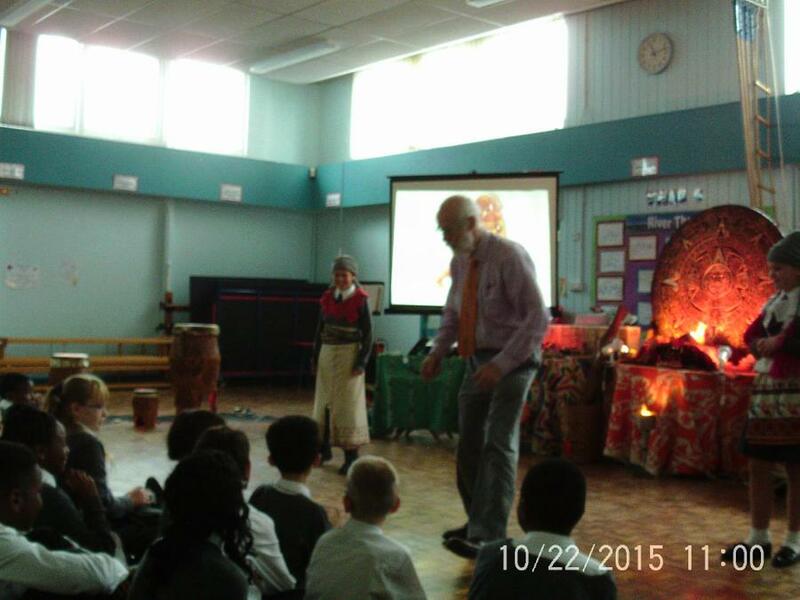 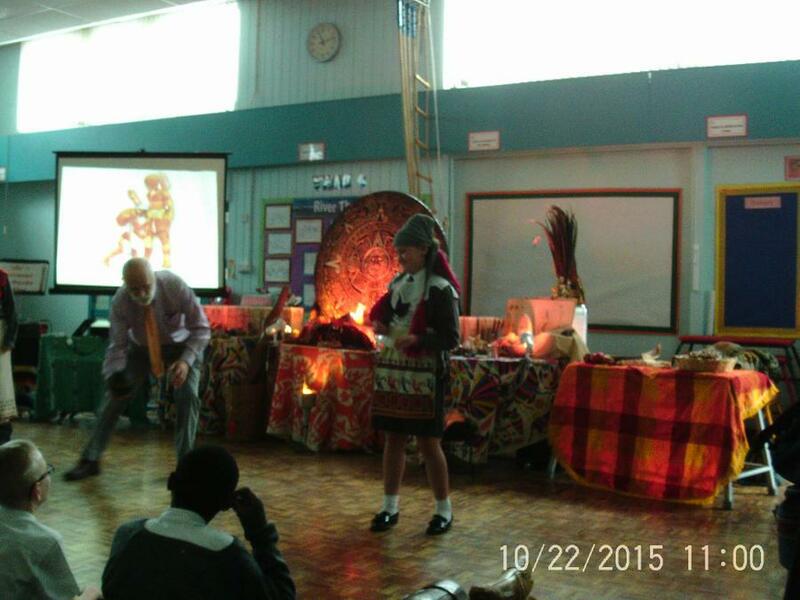 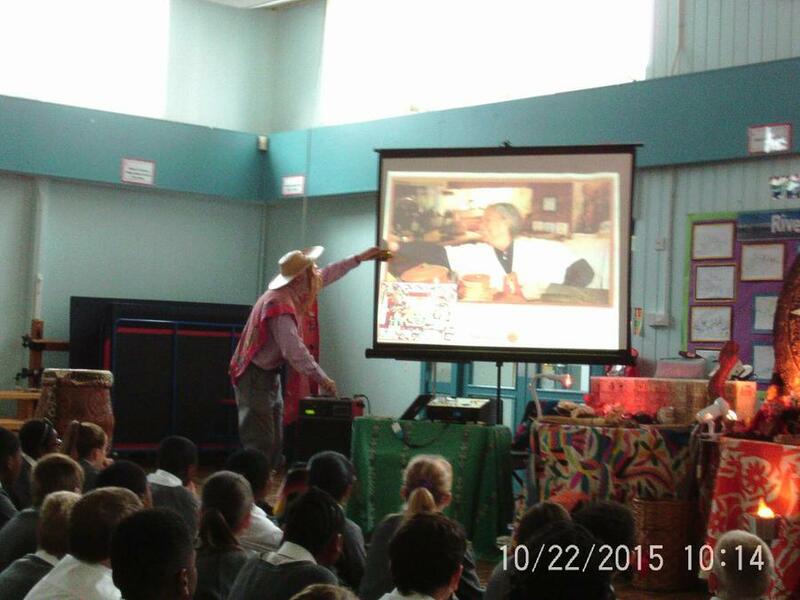 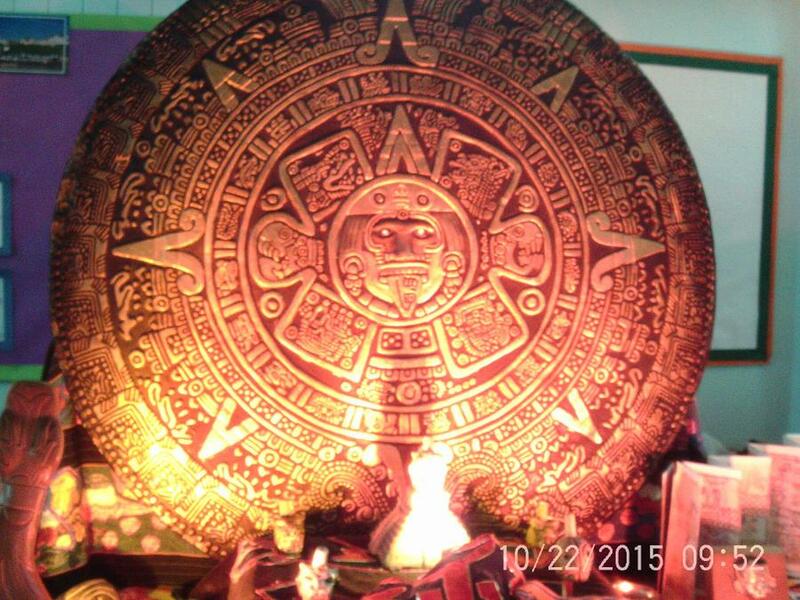 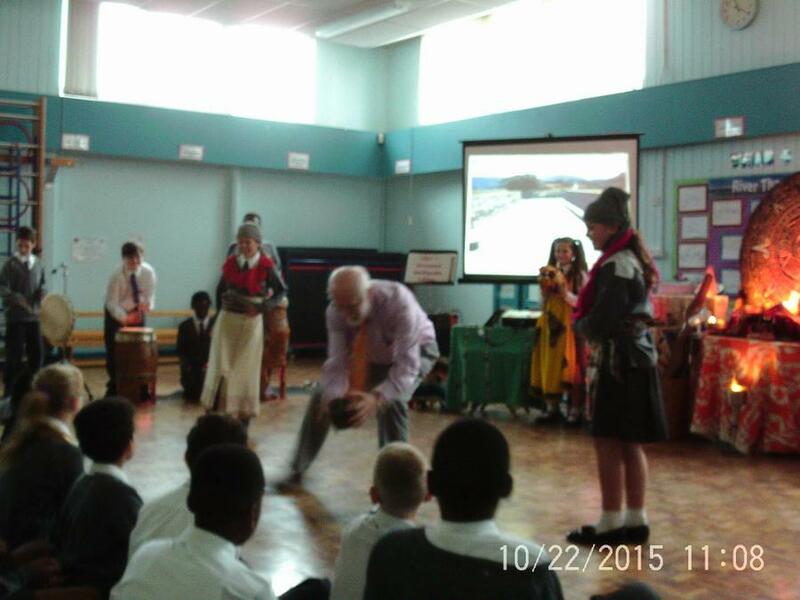 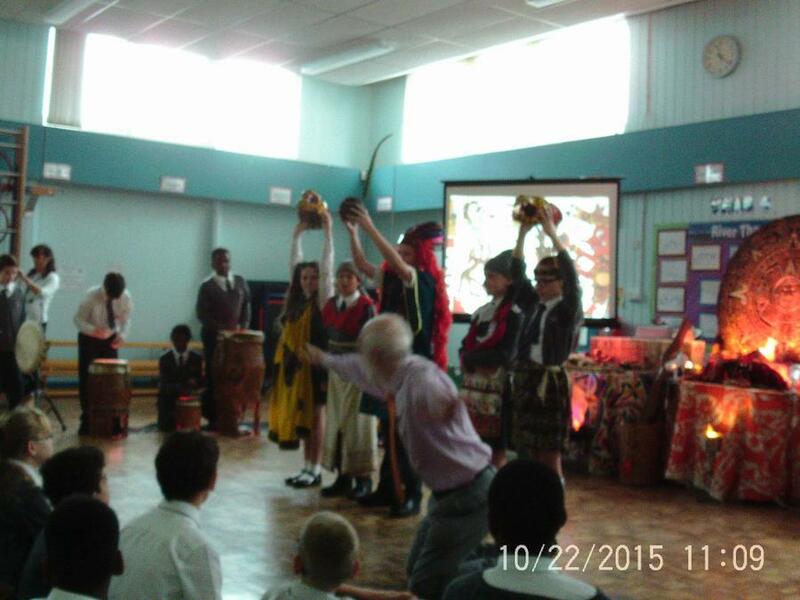 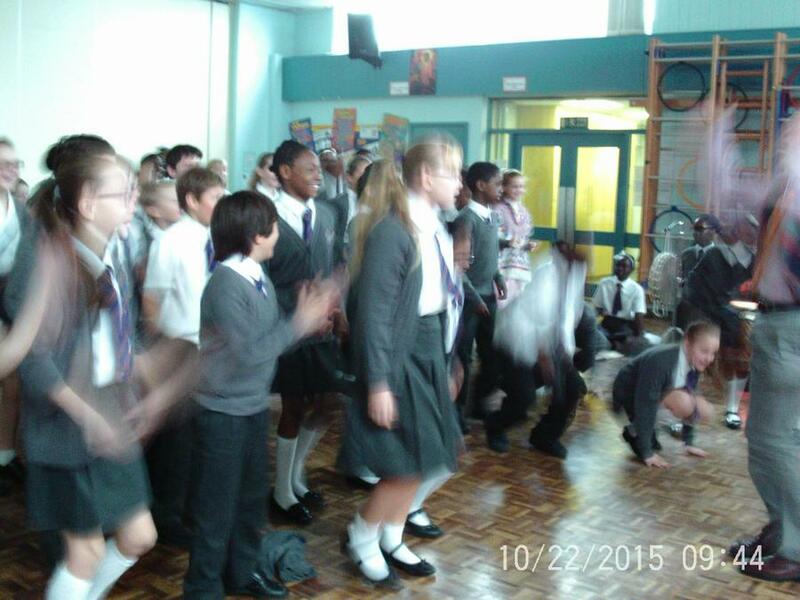 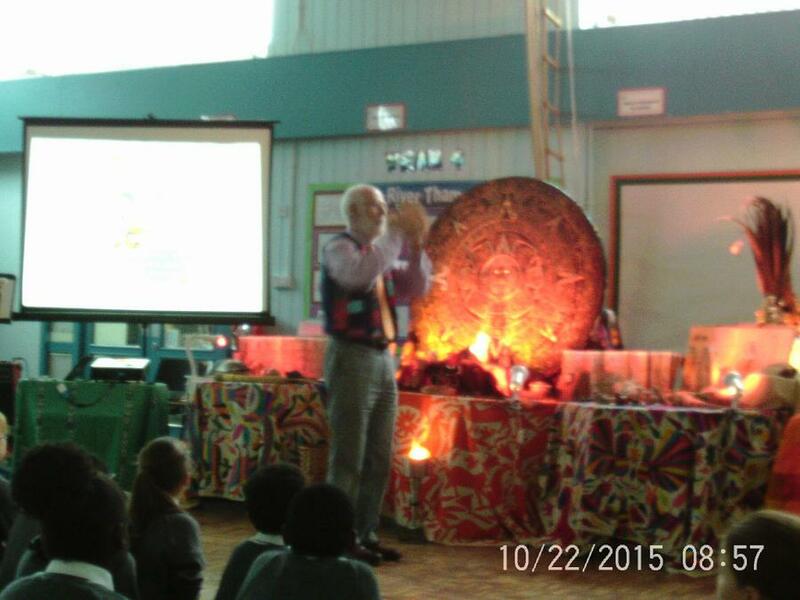 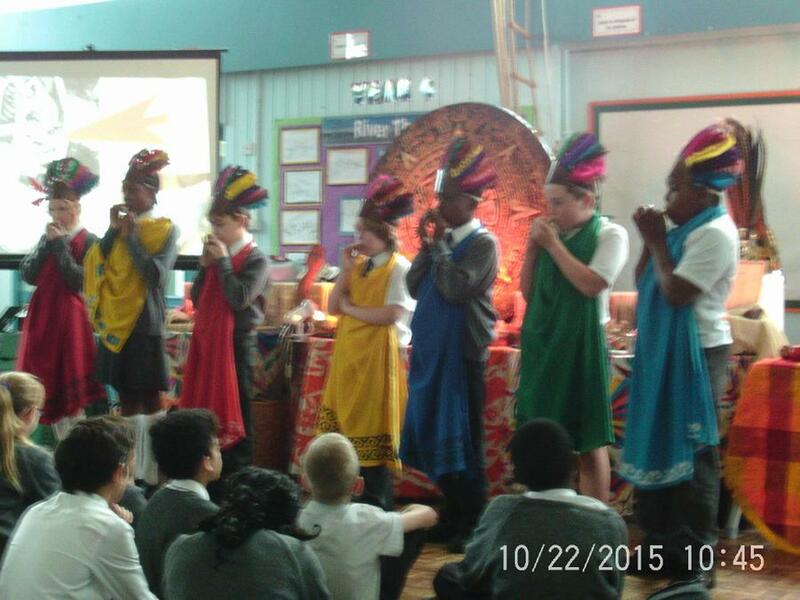 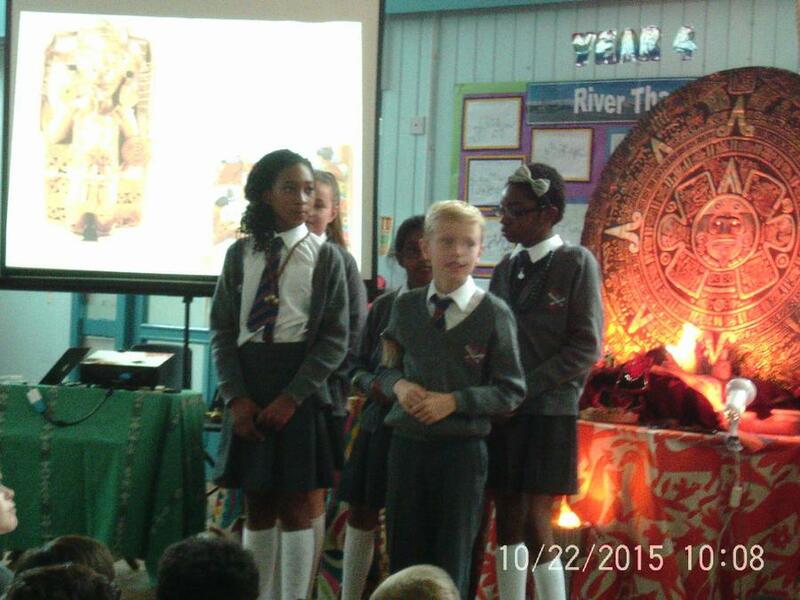 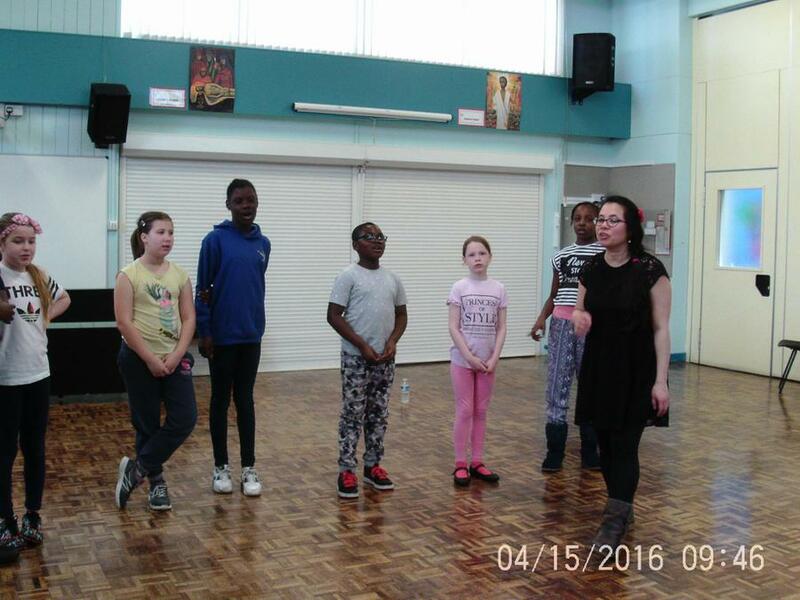 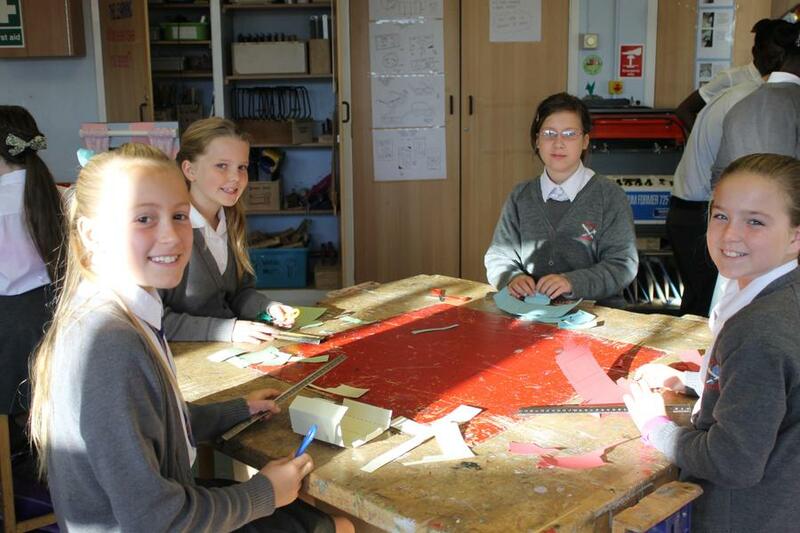 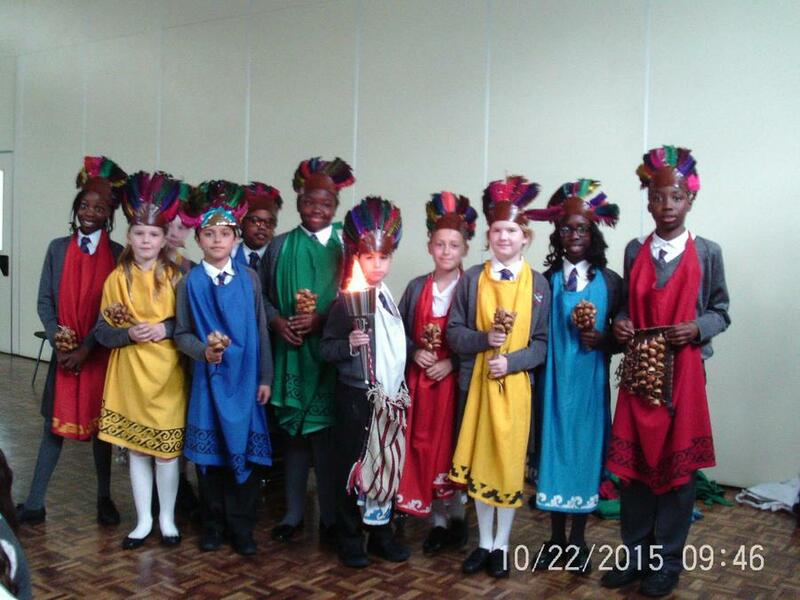 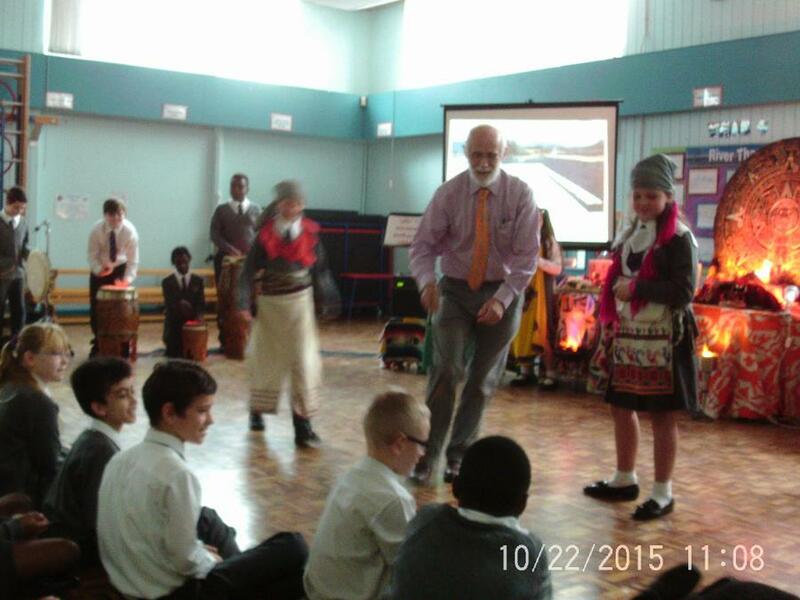 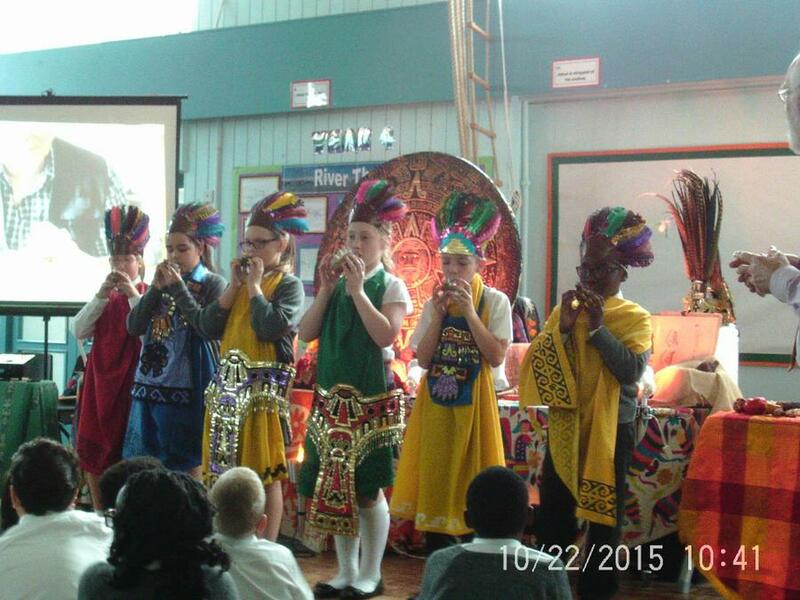 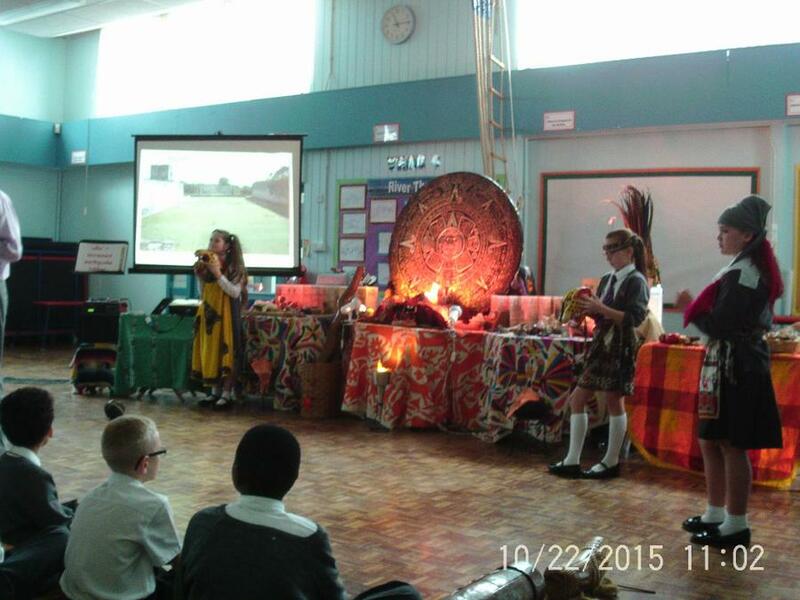 Year six have had an extremely entertaining morning in our Mexicolore Aztec workshop. 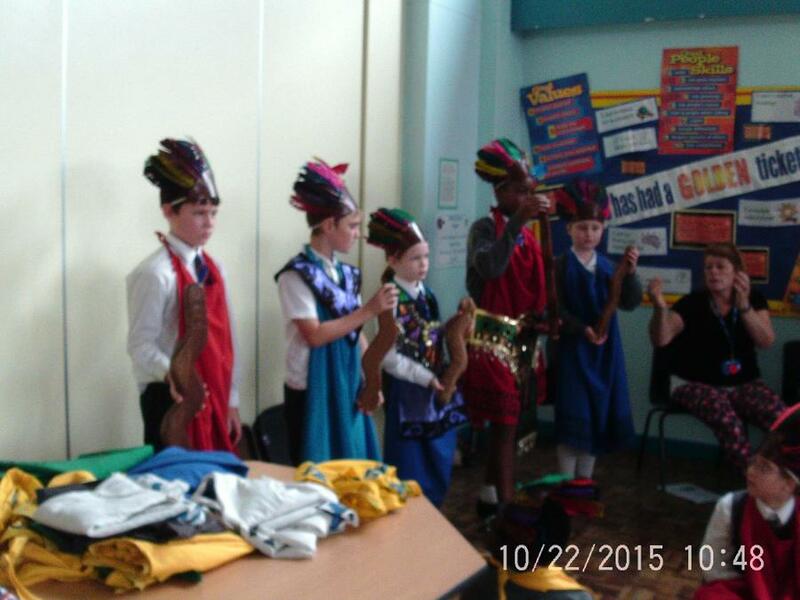 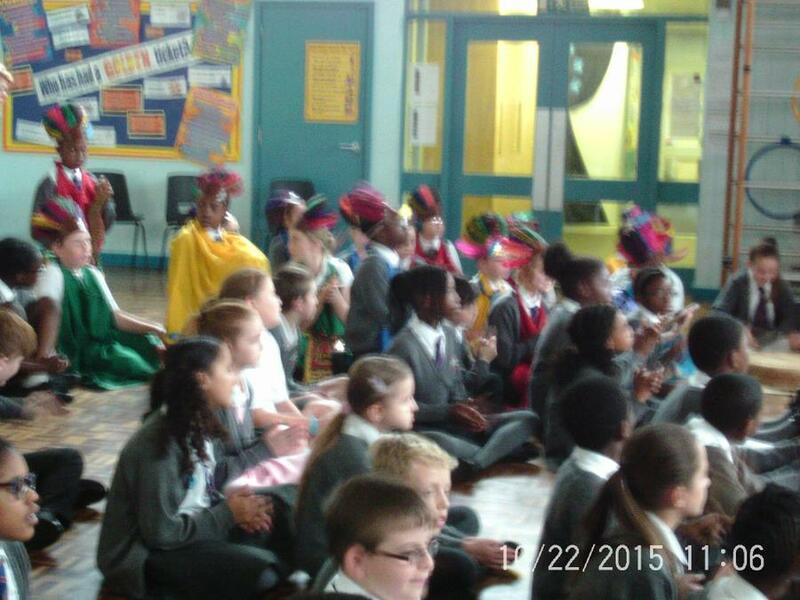 We learnt all about the culture, including music and costume. 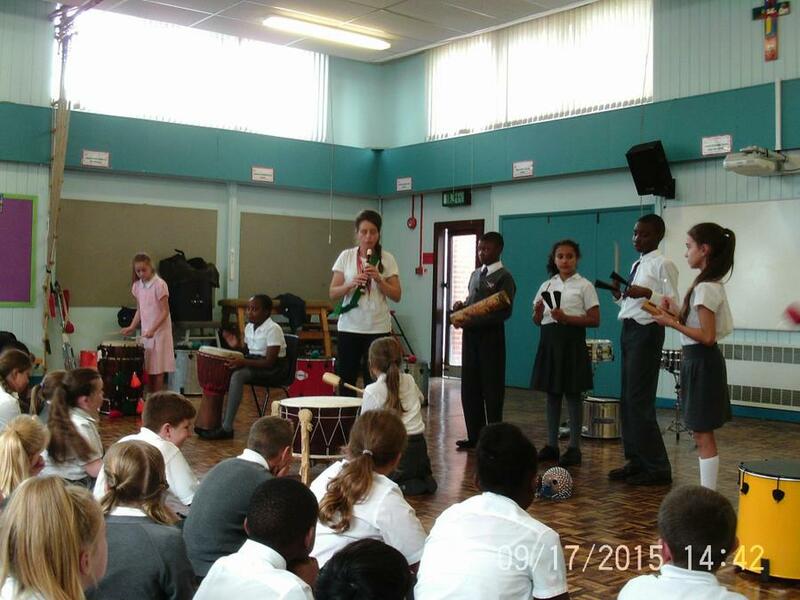 We took turns playing instruments and particularly enjoyed the football game. 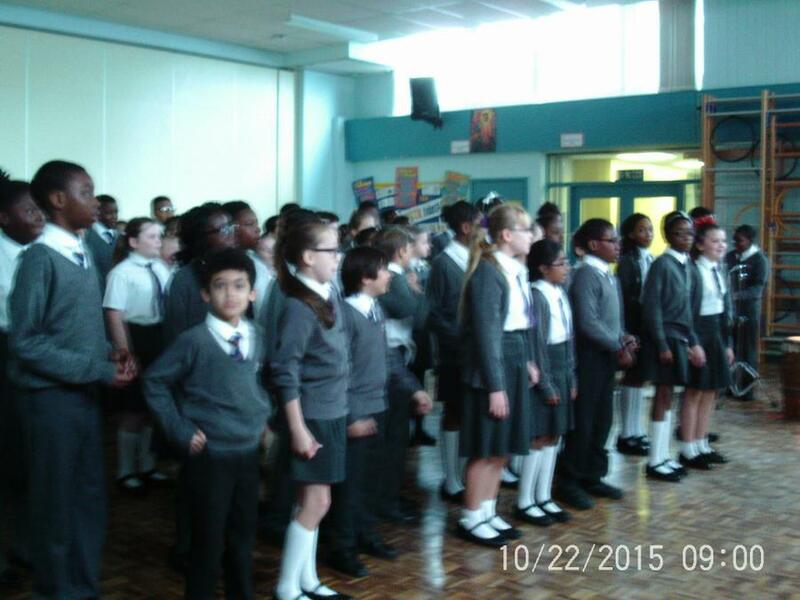 We look forward to learning more in our lessons after half term. 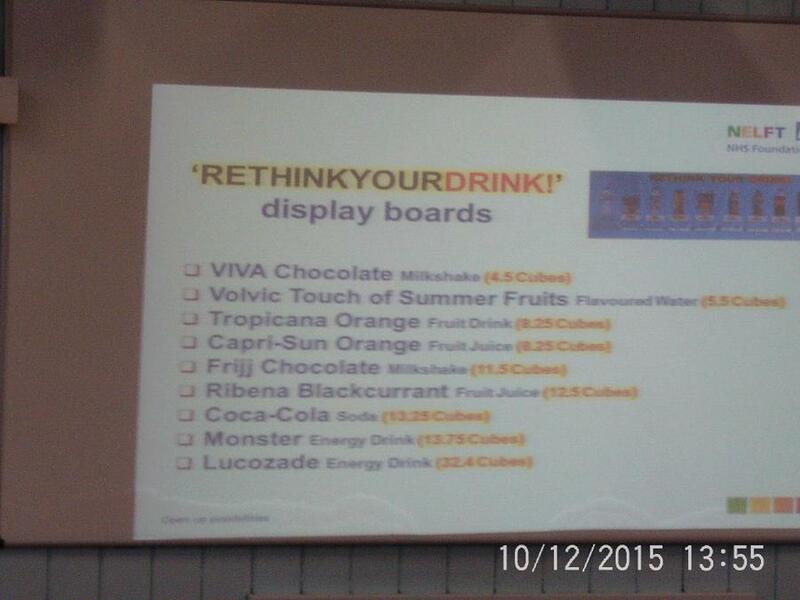 Year six thought we knew what we were drinking. 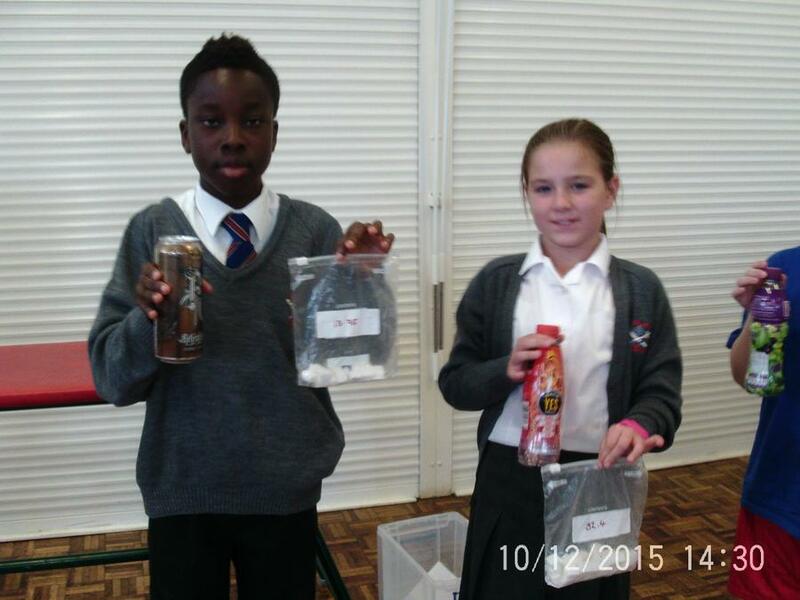 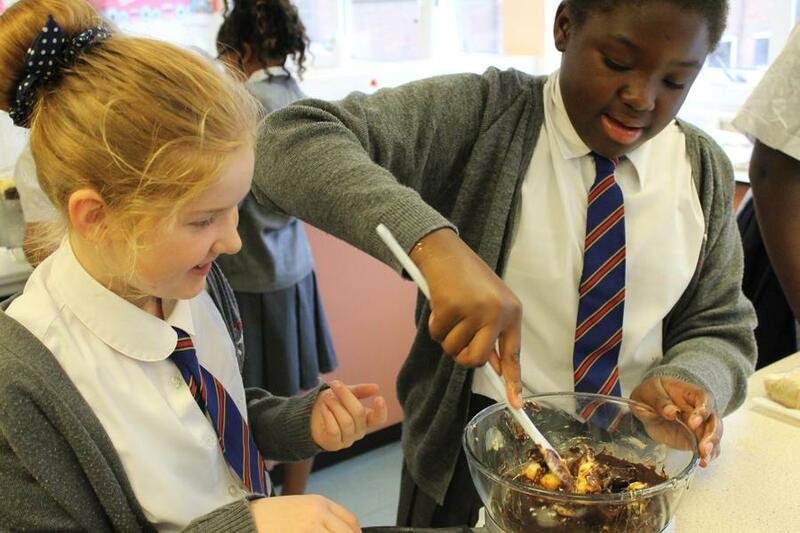 However it was very shocking to learn exactly how much sugar appears in our favourite treats. 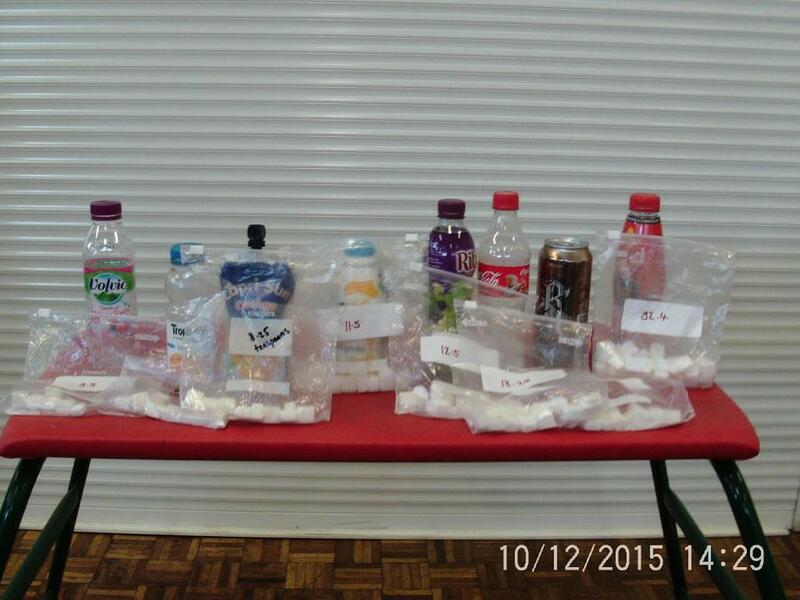 The most surprising were the flavoured water, capri-sun and worst of all...Lucozade! 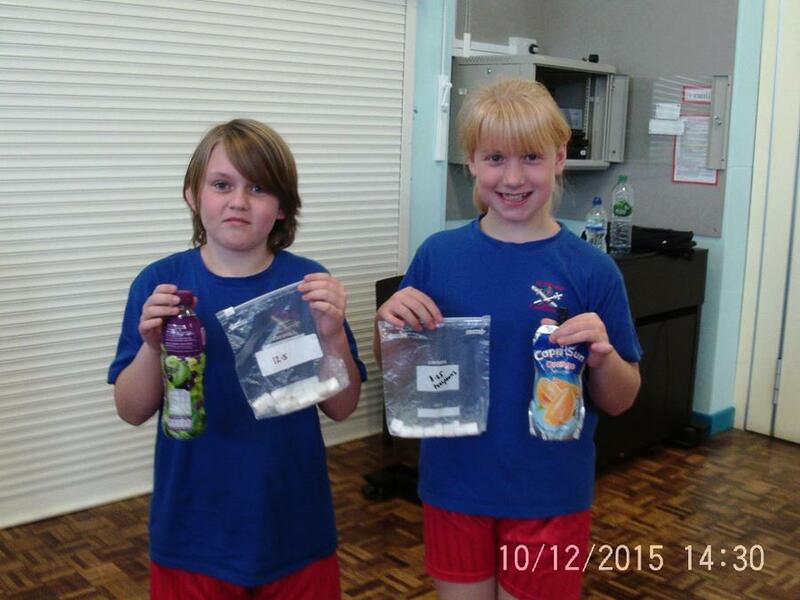 We must take more notice of our diet and make some simple changes to decrease our sugar intake. 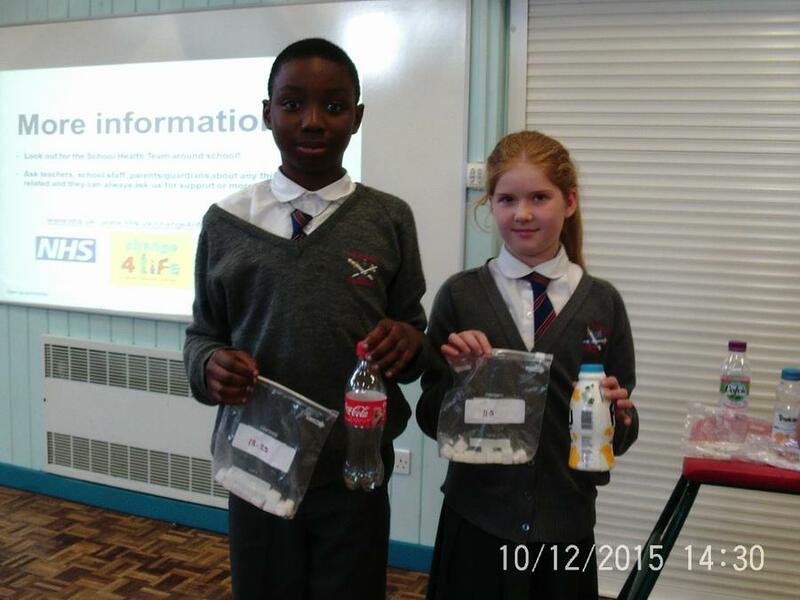 Drinking more water, together with our increased running, will keep us far healthier. 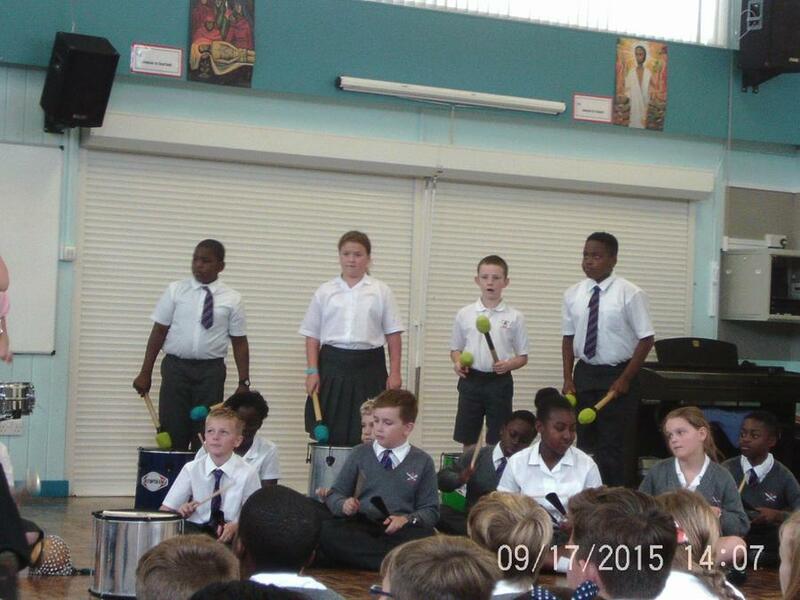 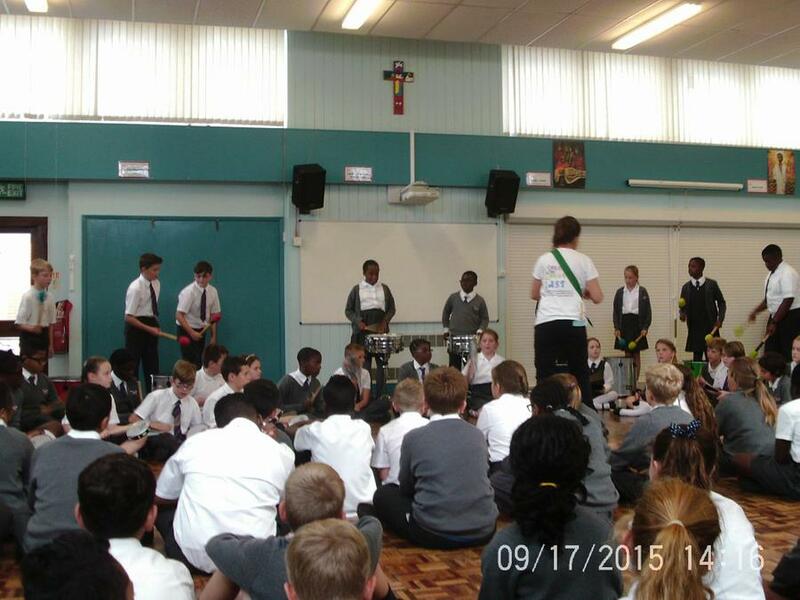 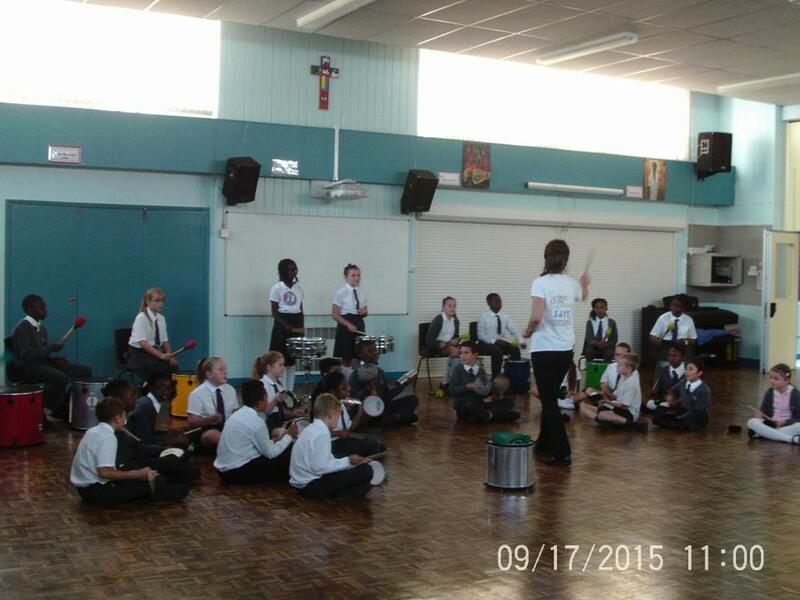 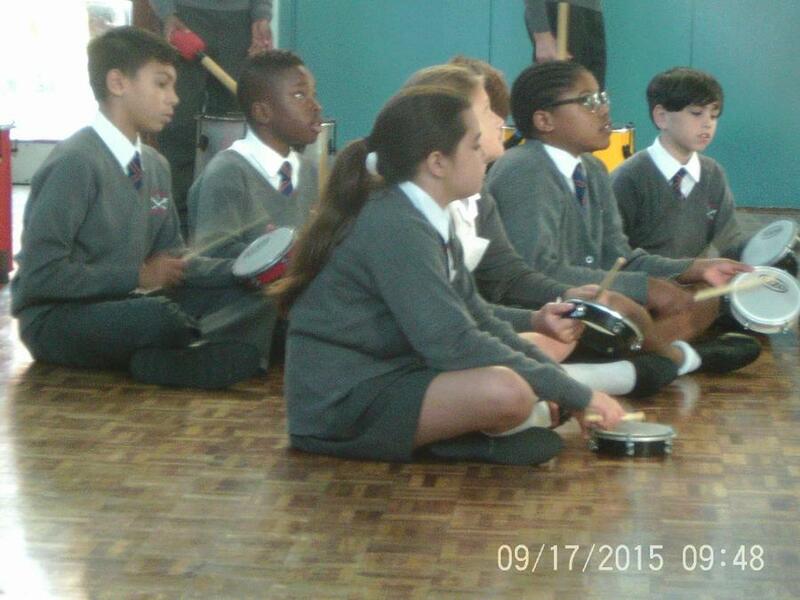 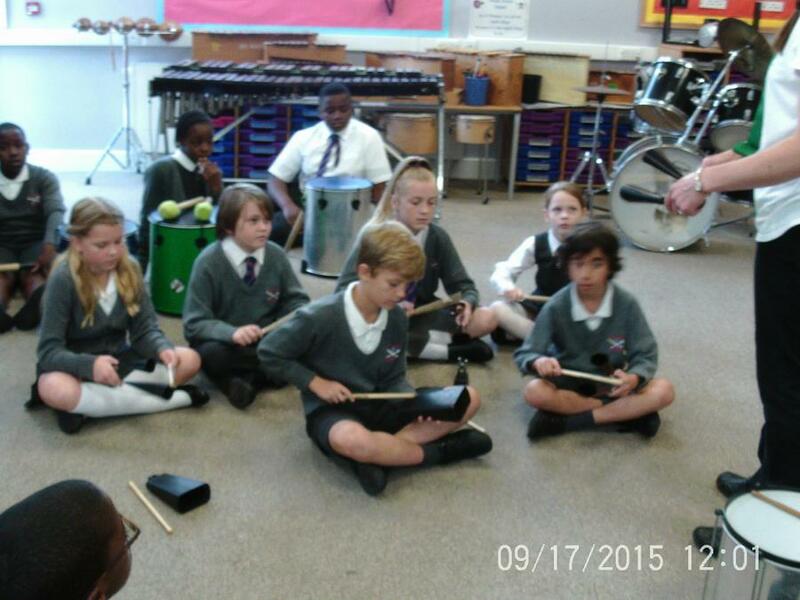 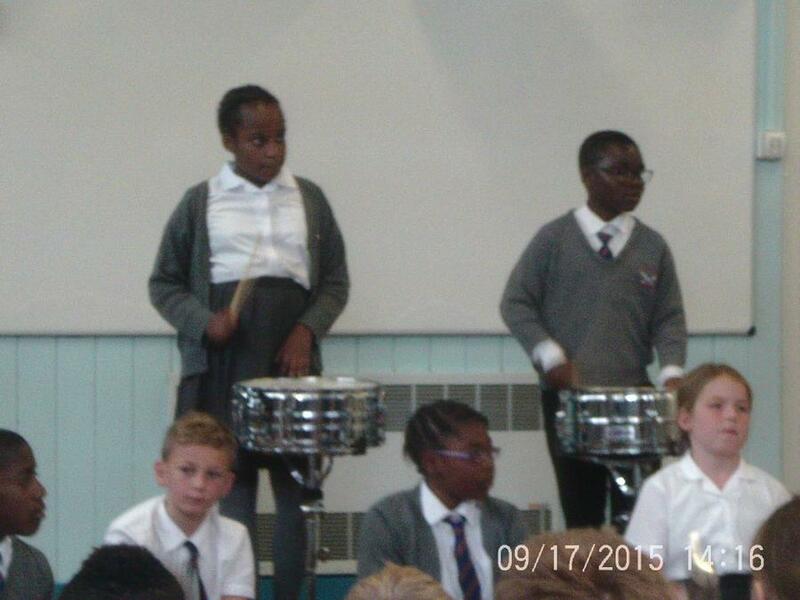 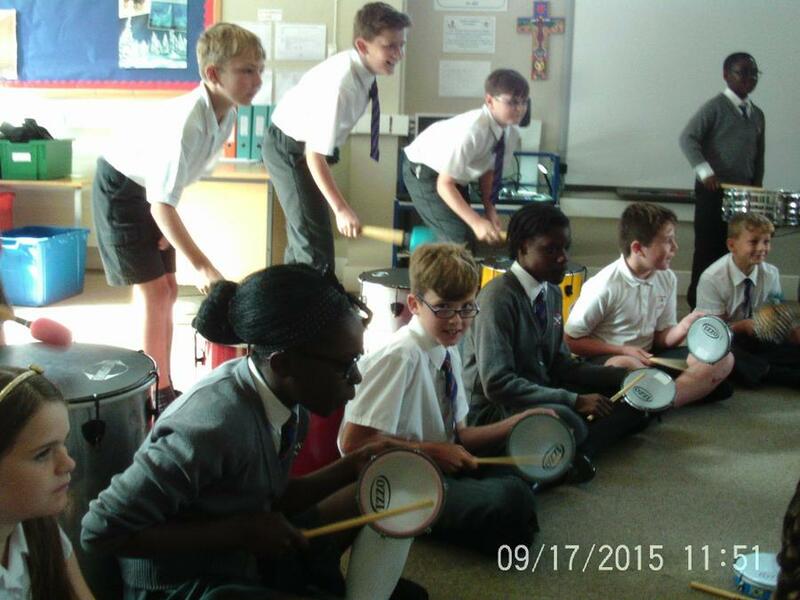 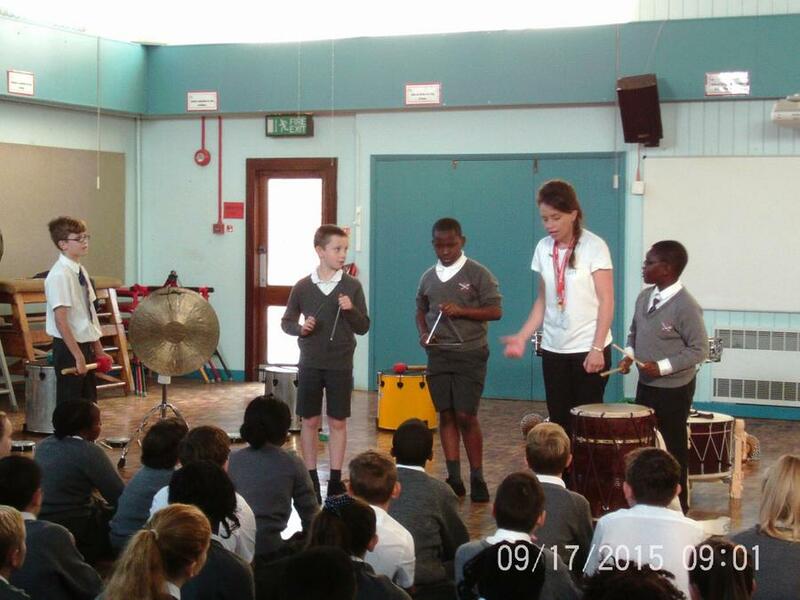 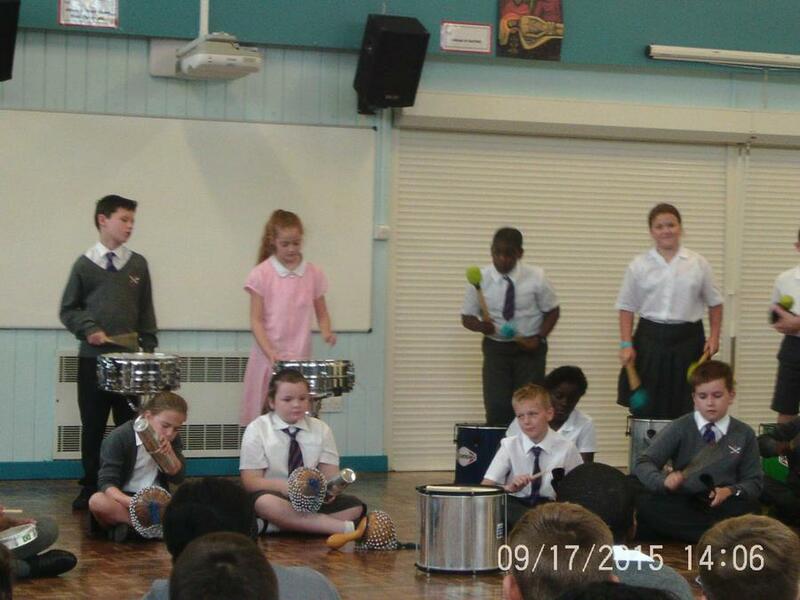 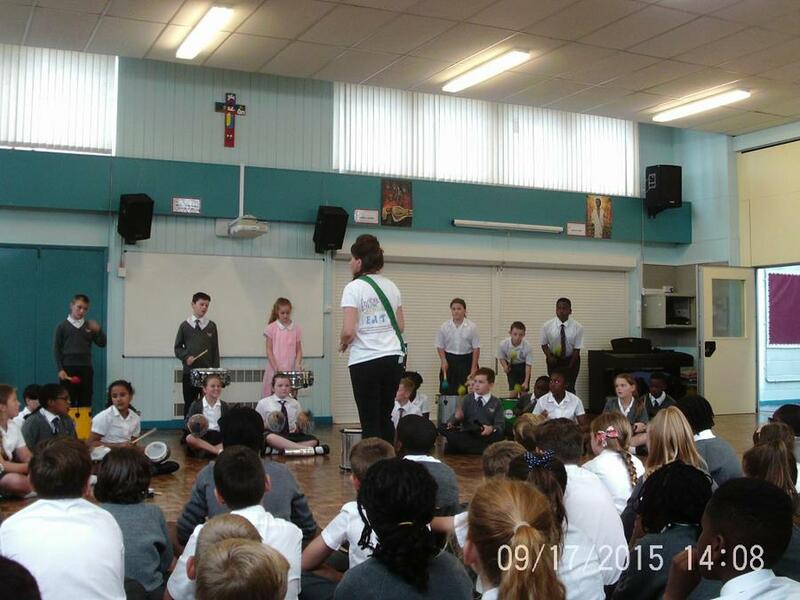 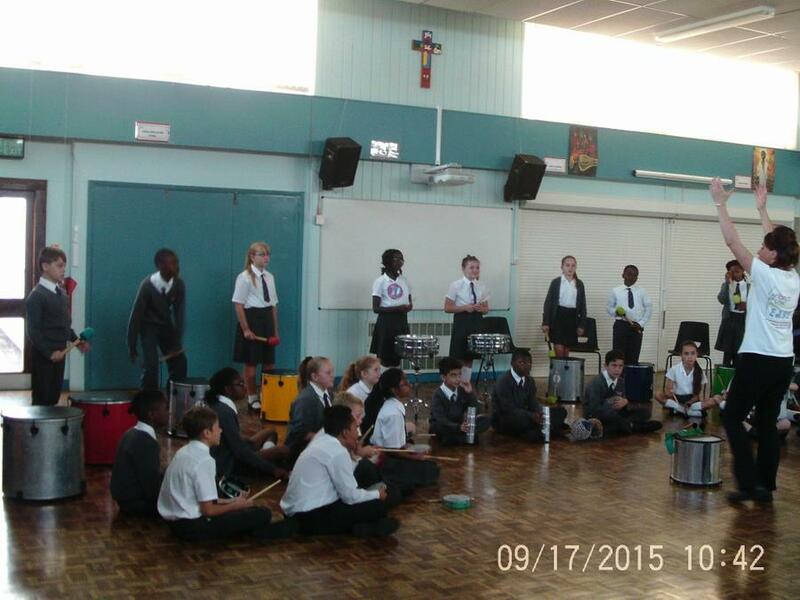 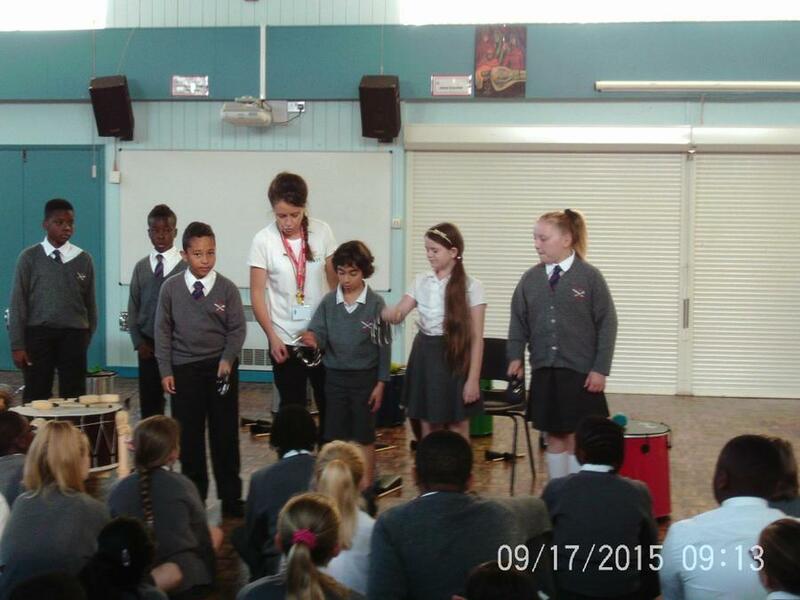 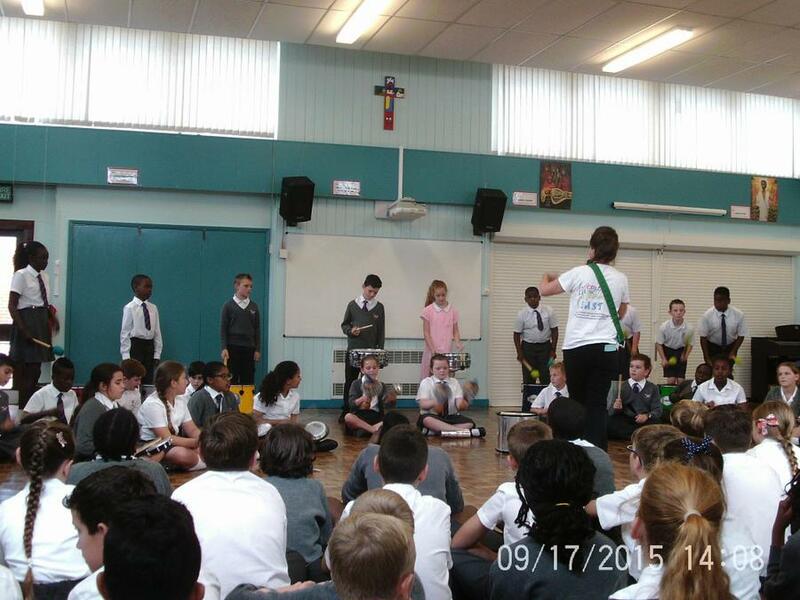 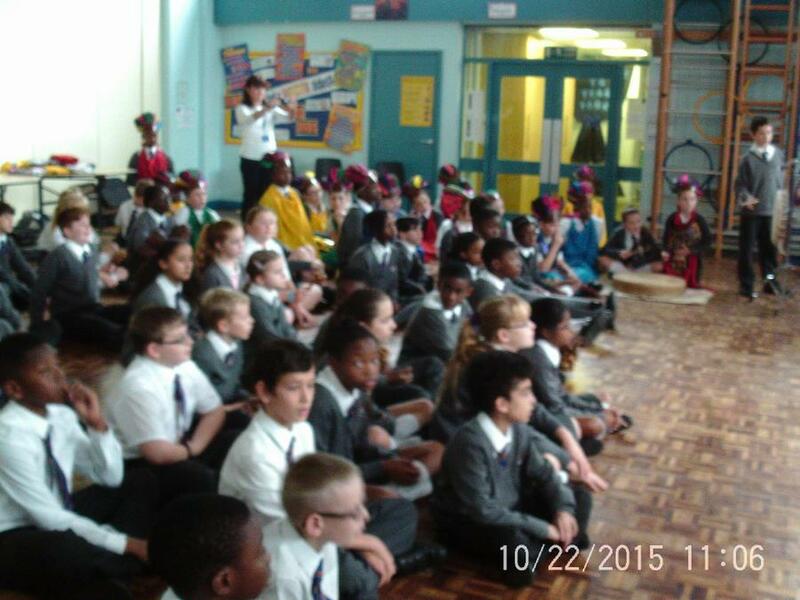 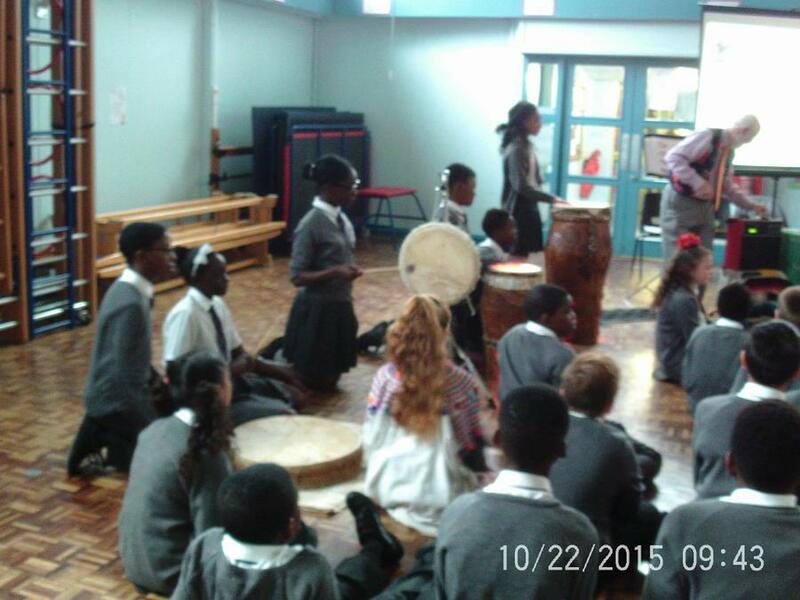 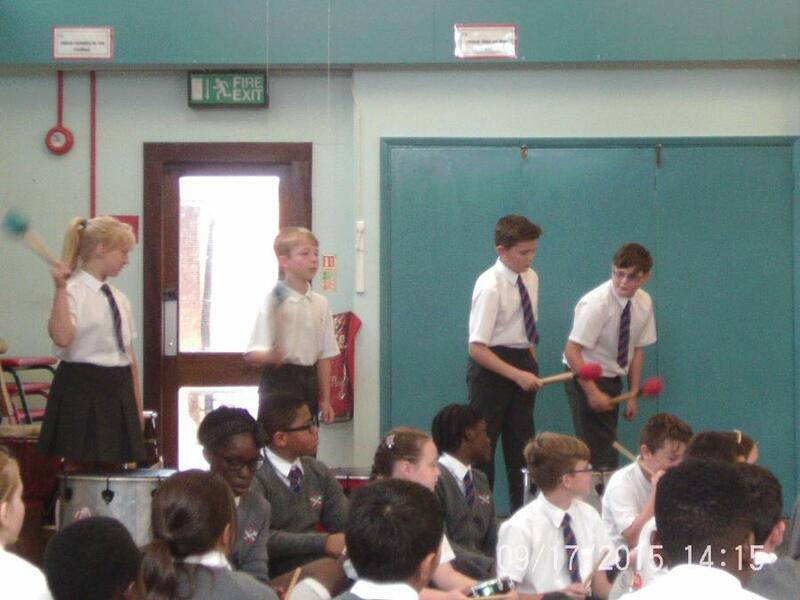 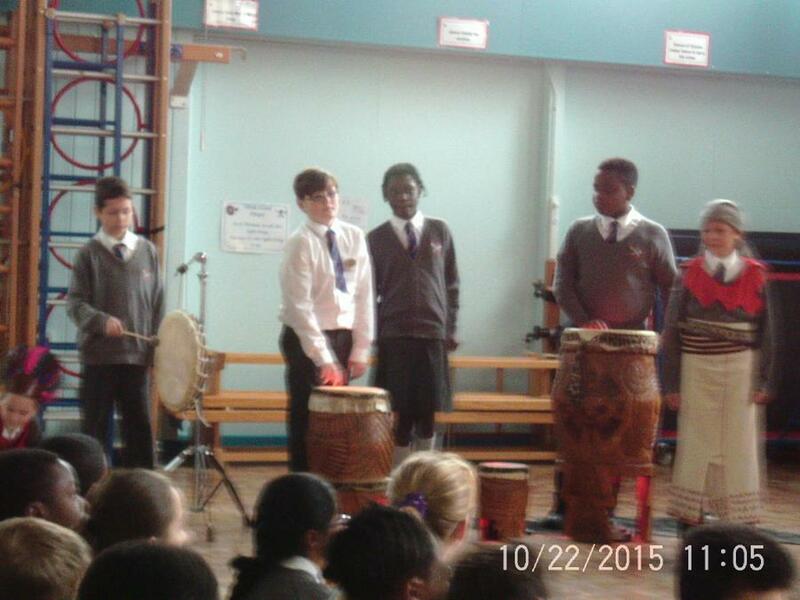 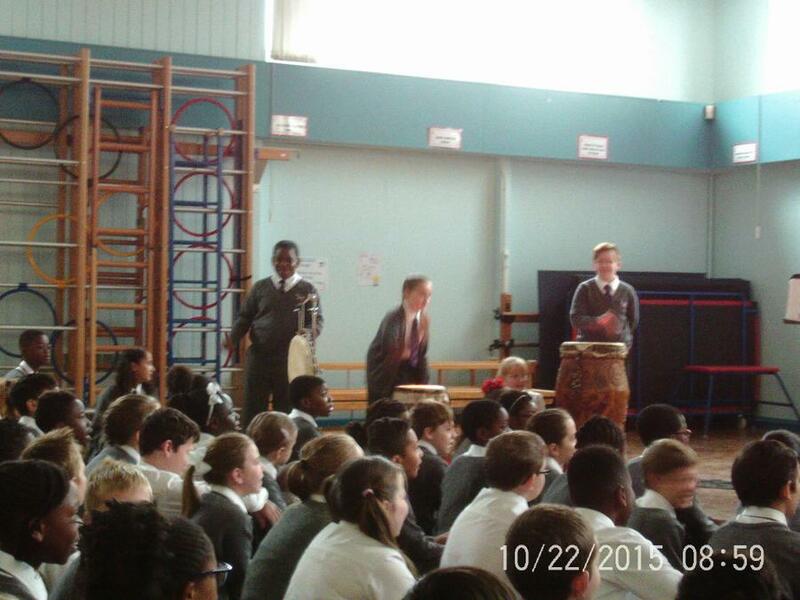 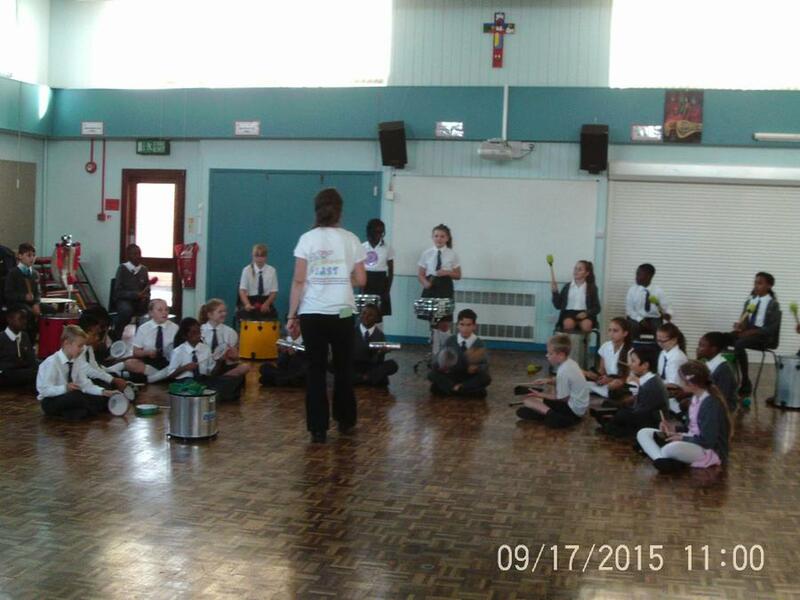 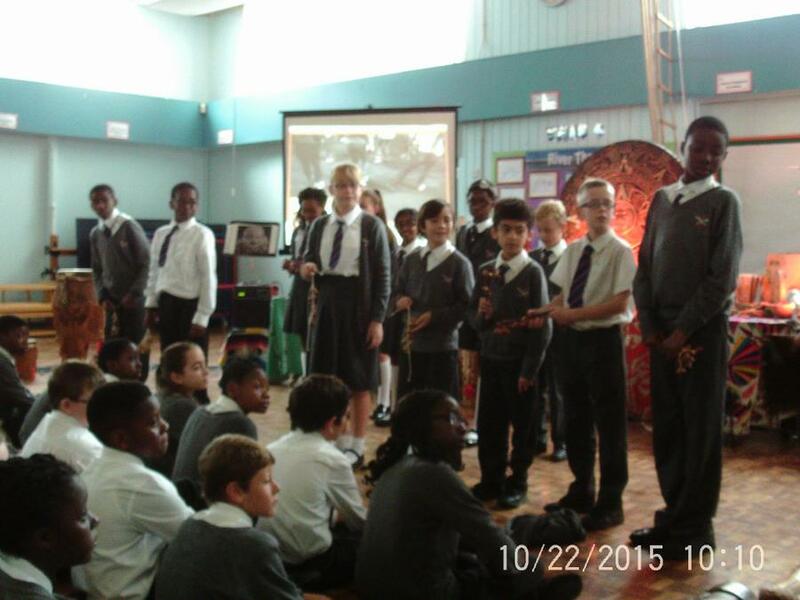 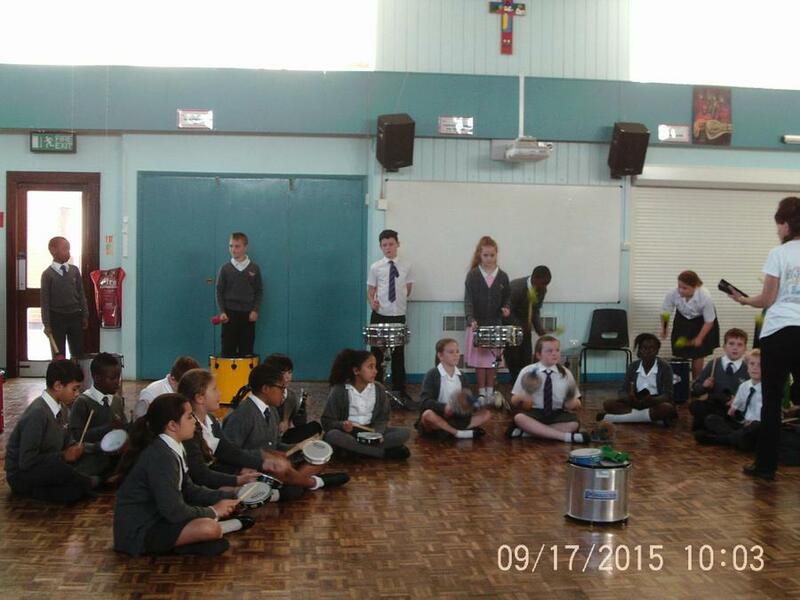 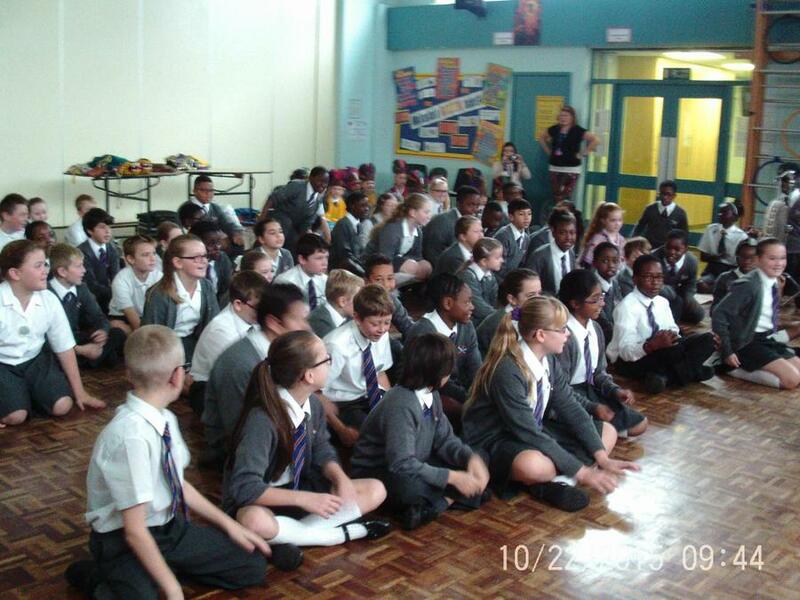 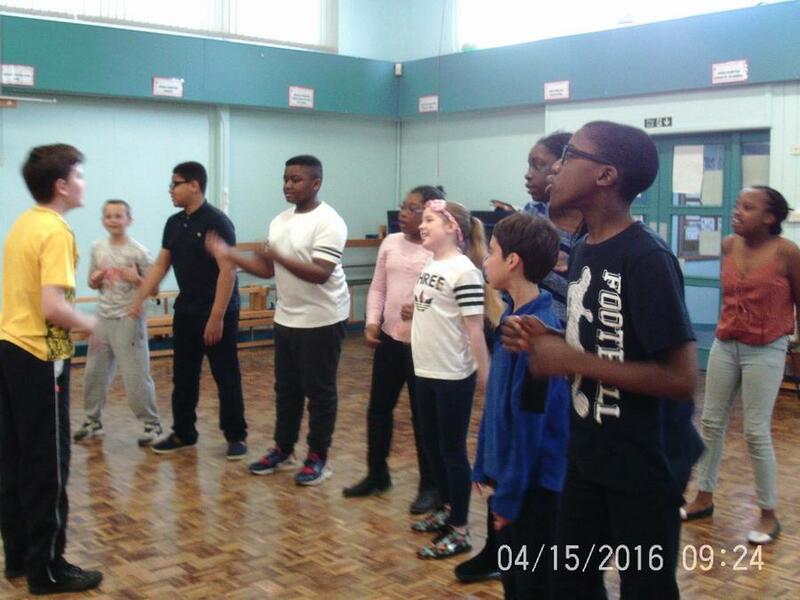 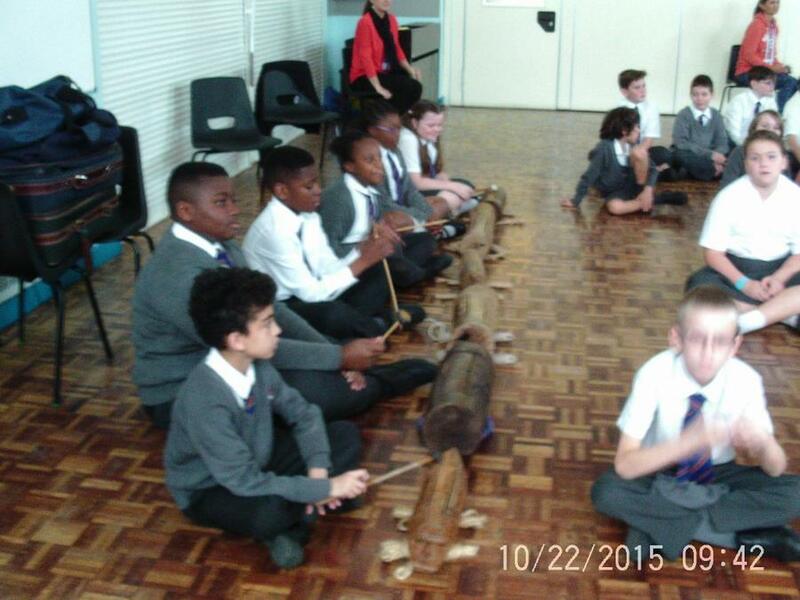 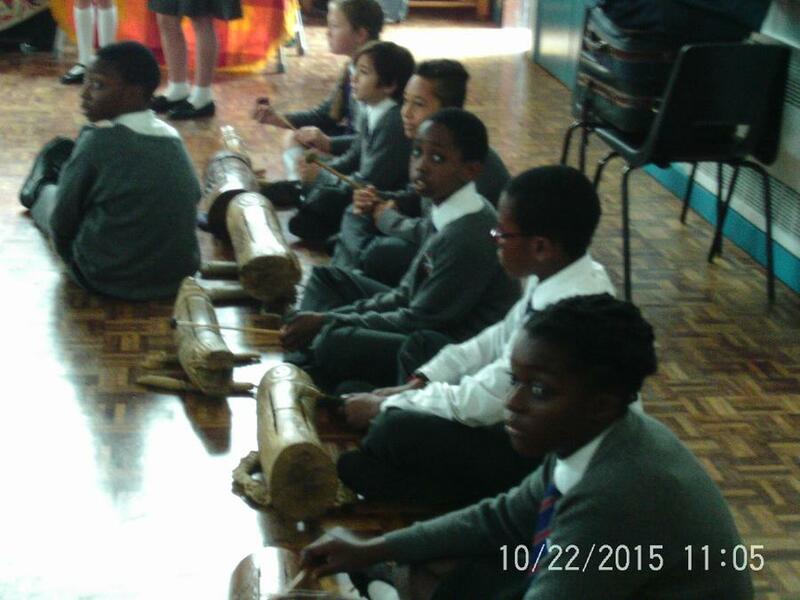 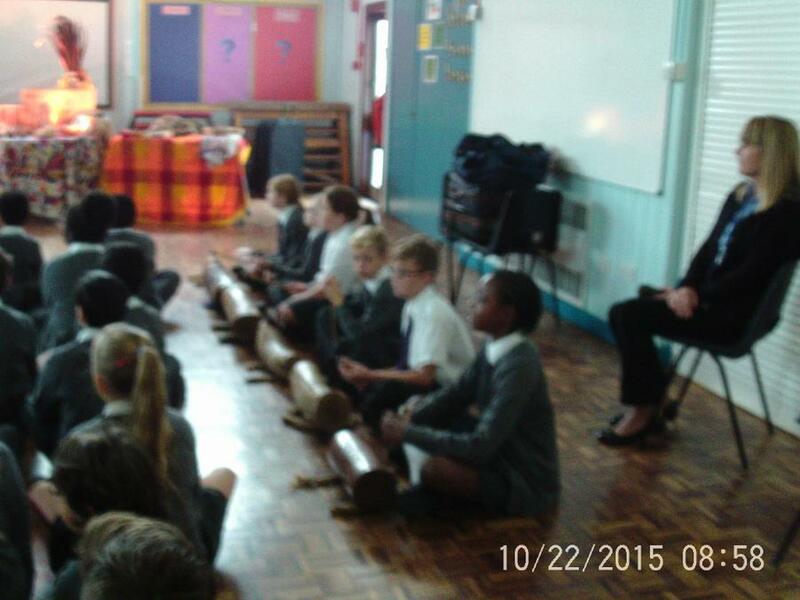 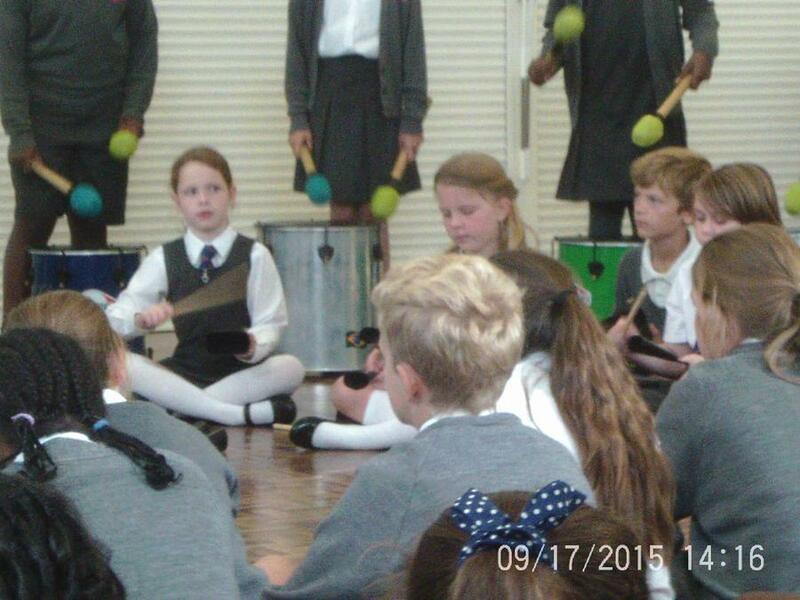 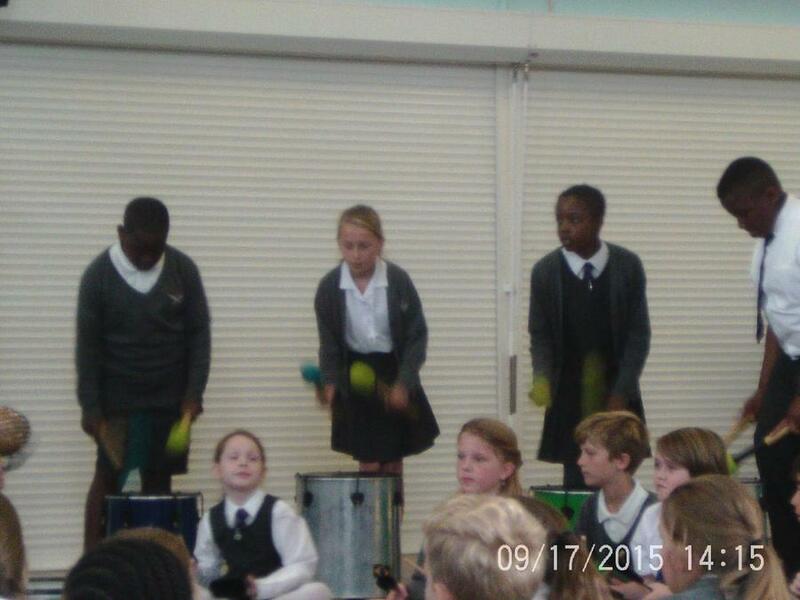 Year six had a fantastic day exploring Samba music. 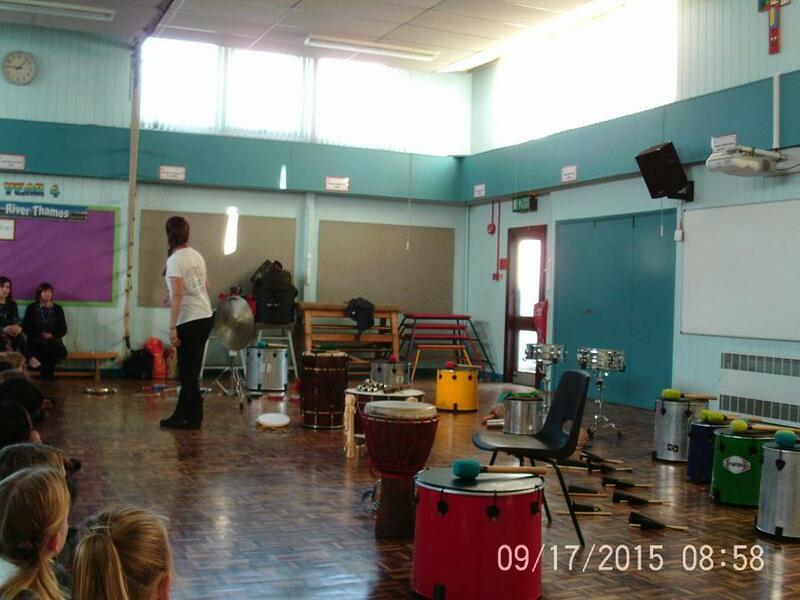 We experimented with lots of new instruments and finished the day with a performance for each other. 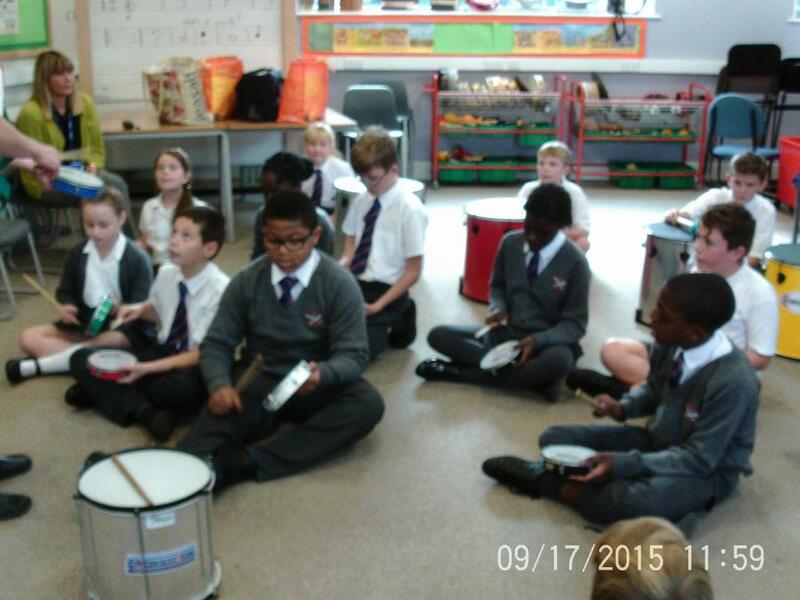 Now we can use our skills to create our own compositions in the next few weeks.